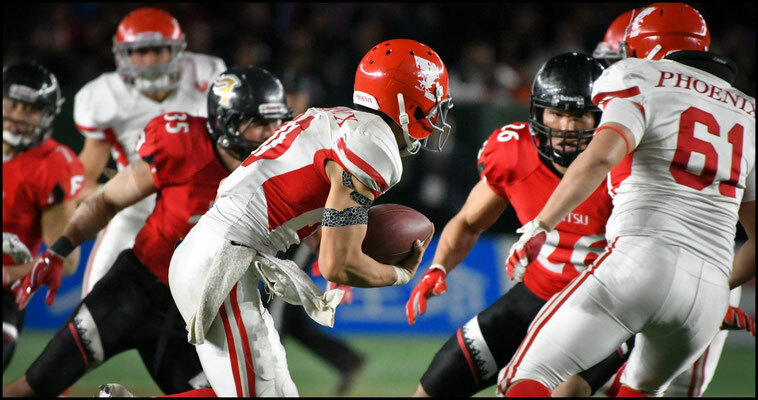 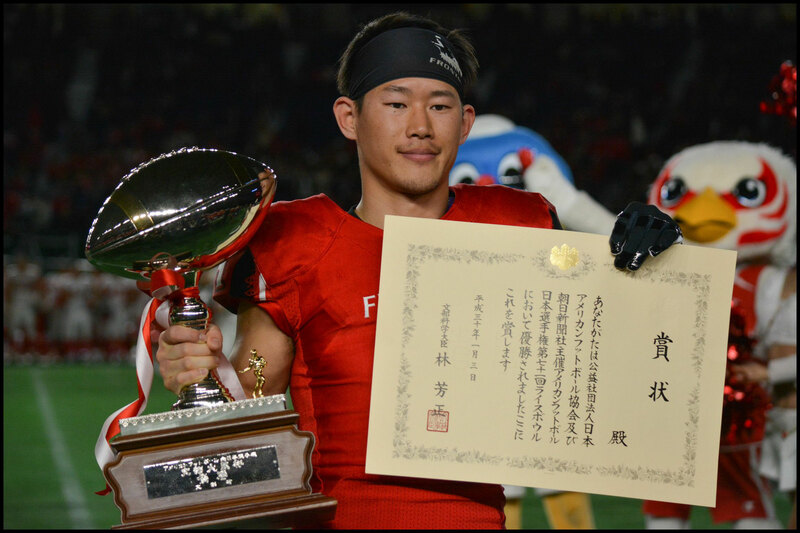 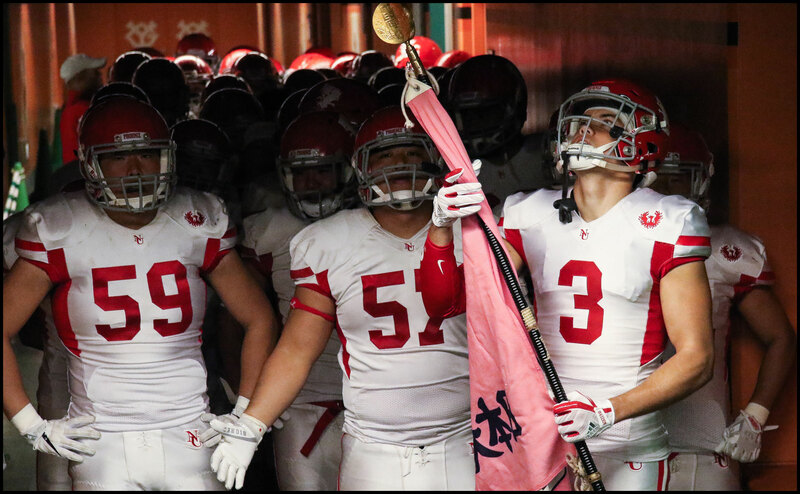 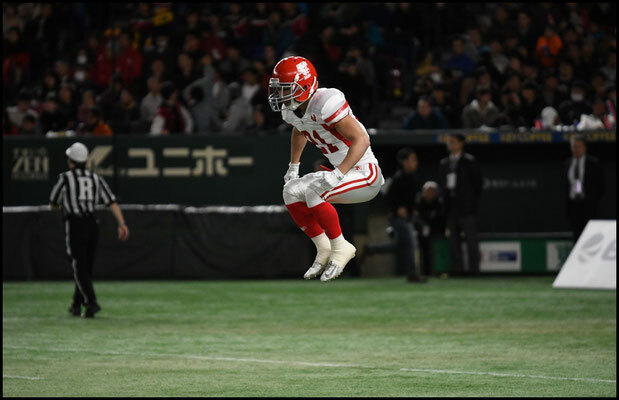 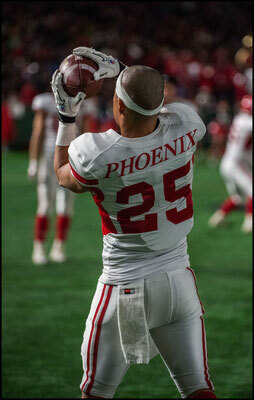 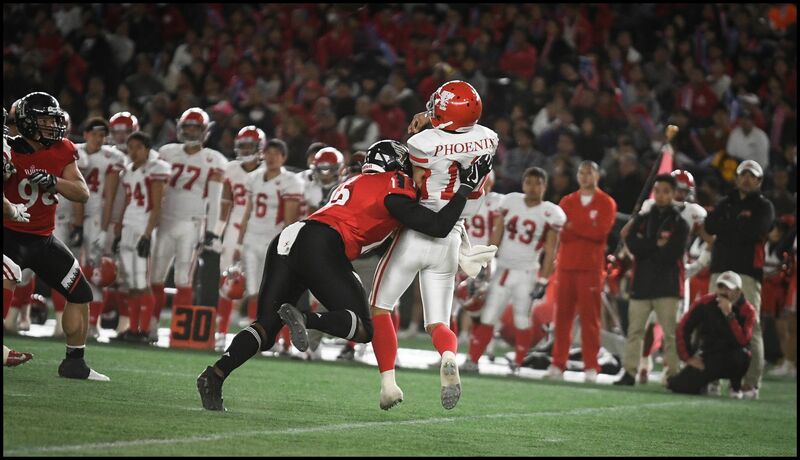 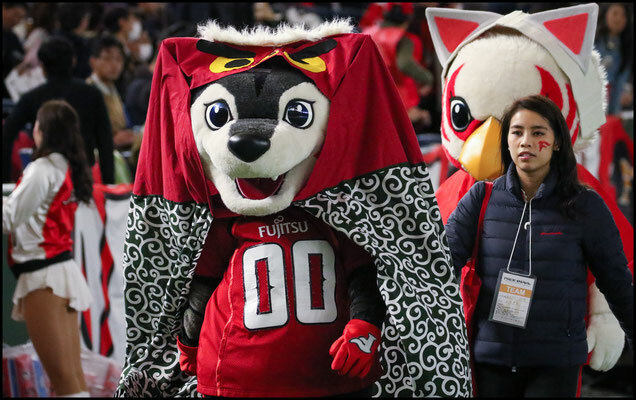 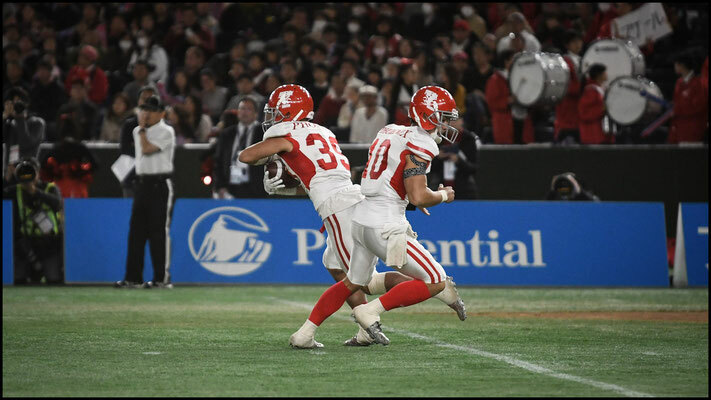 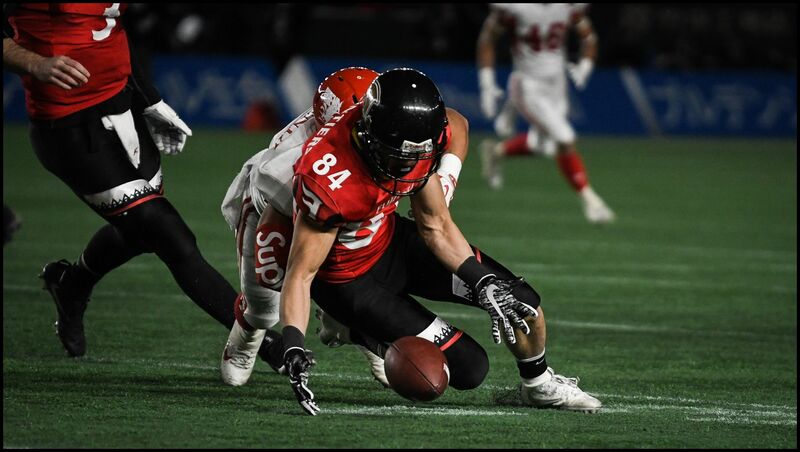 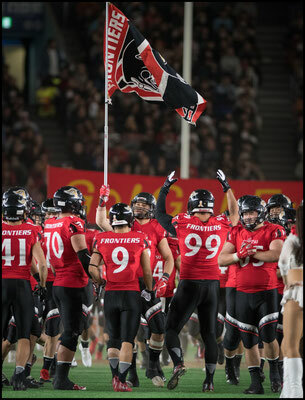 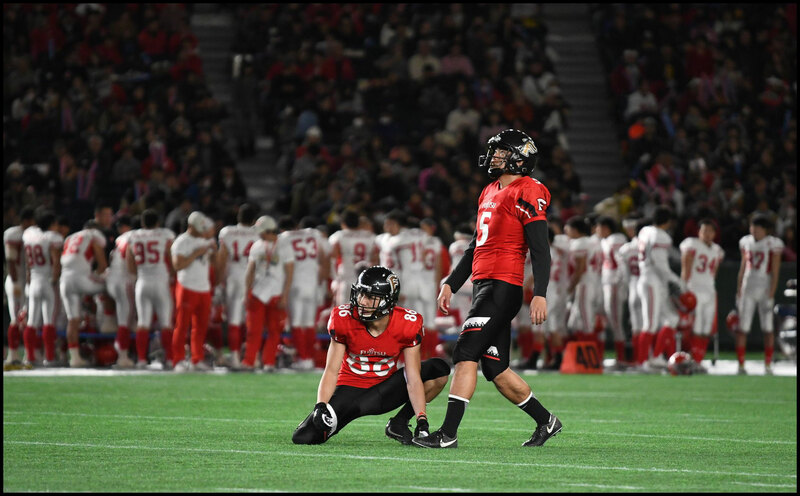 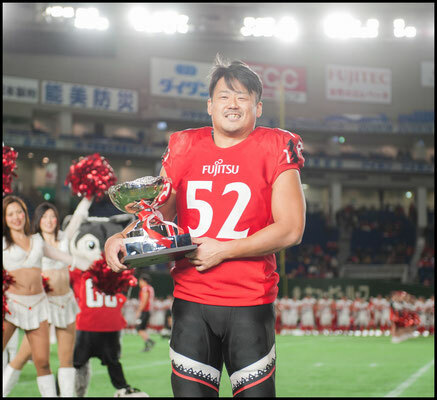 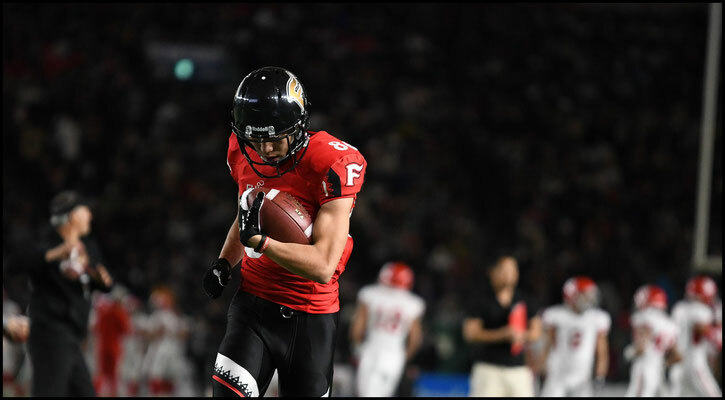 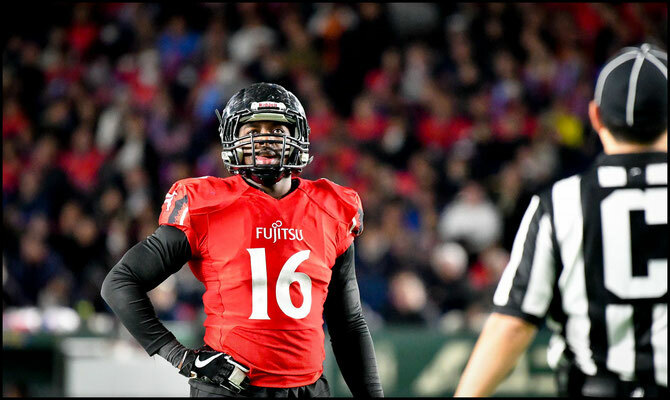 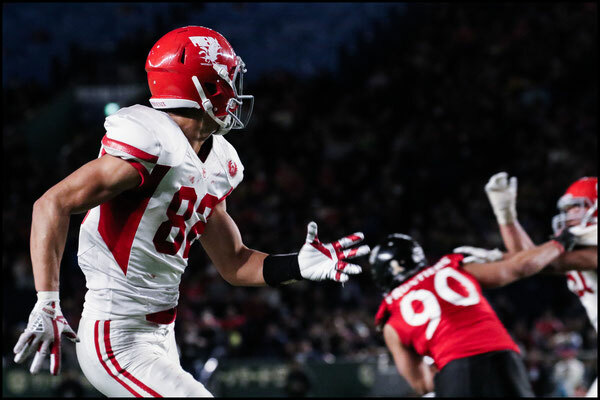 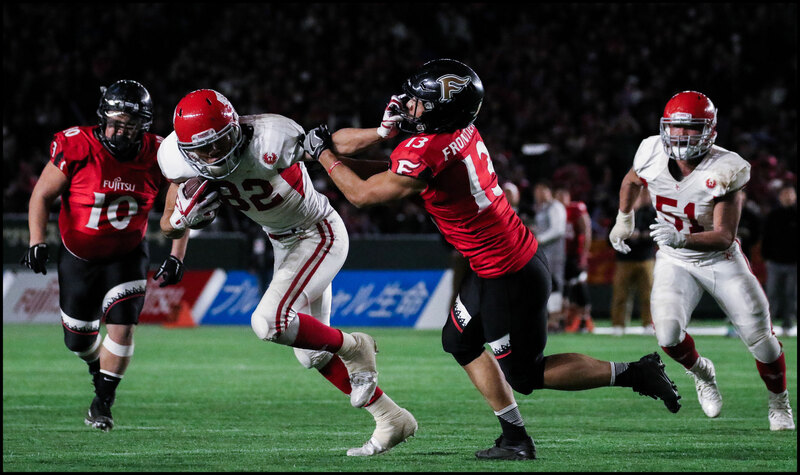 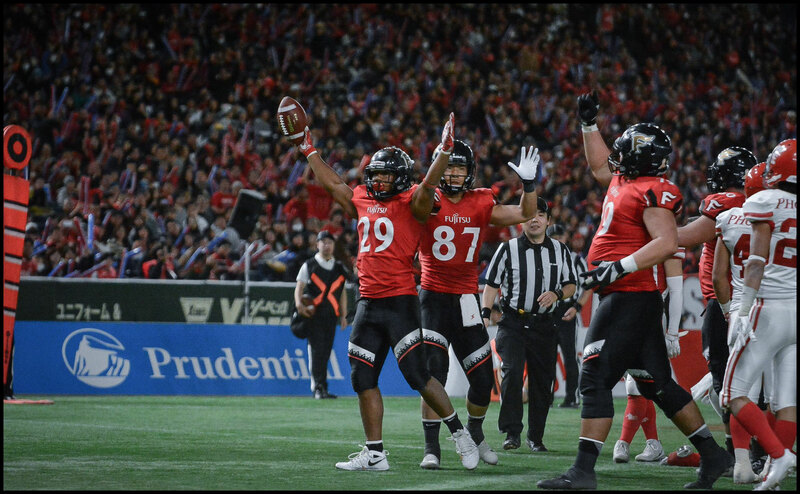 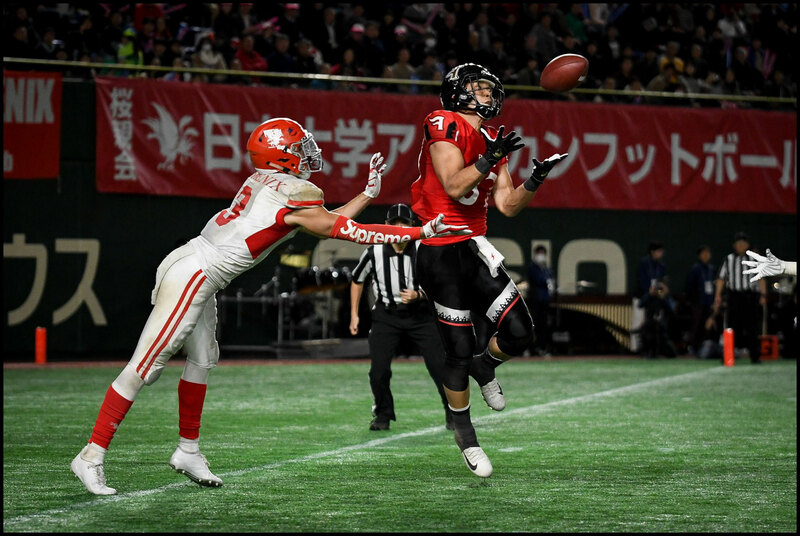 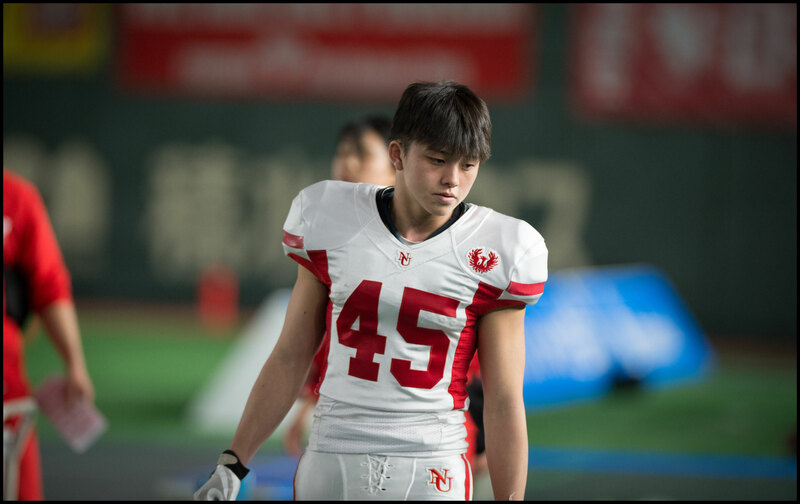 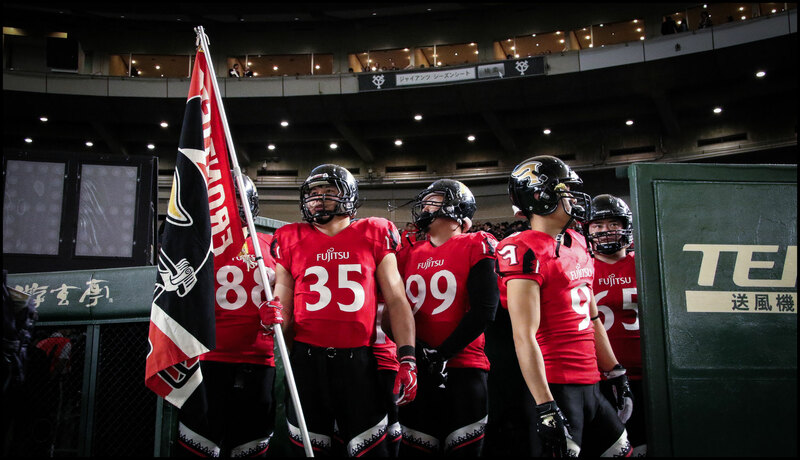 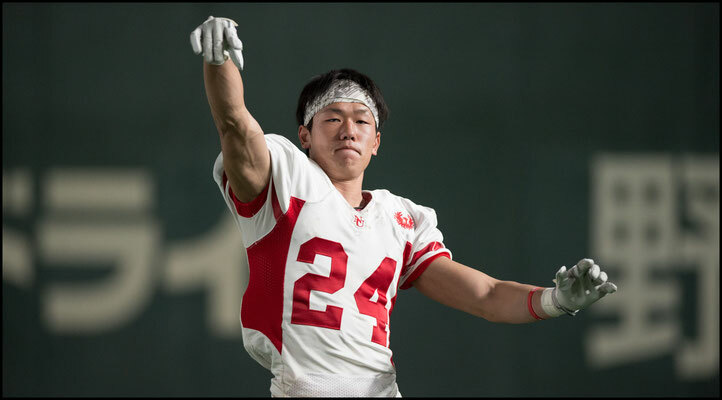 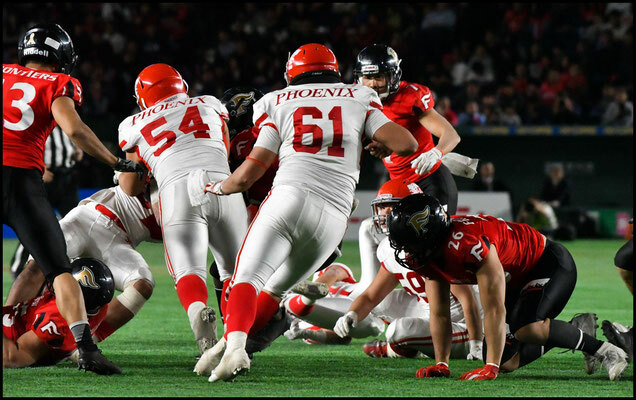 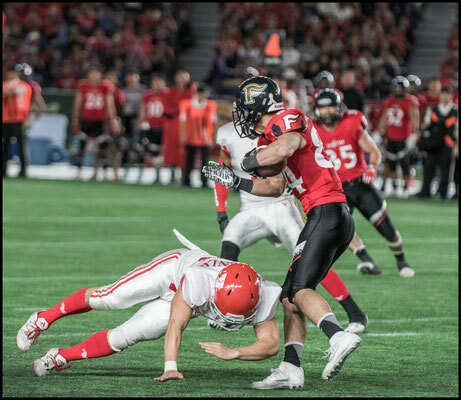 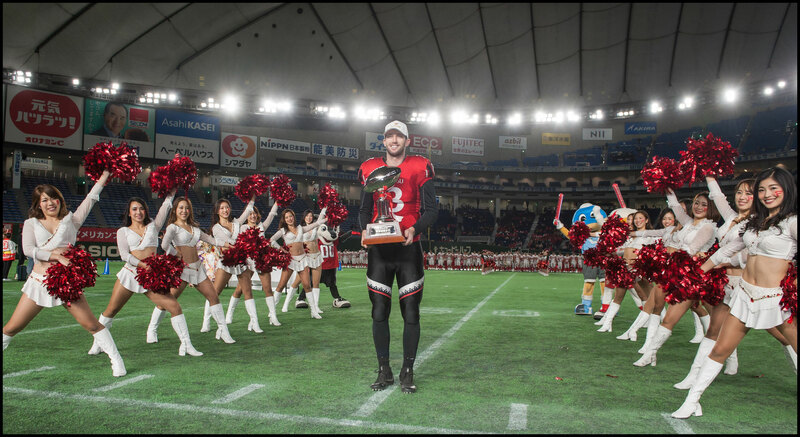 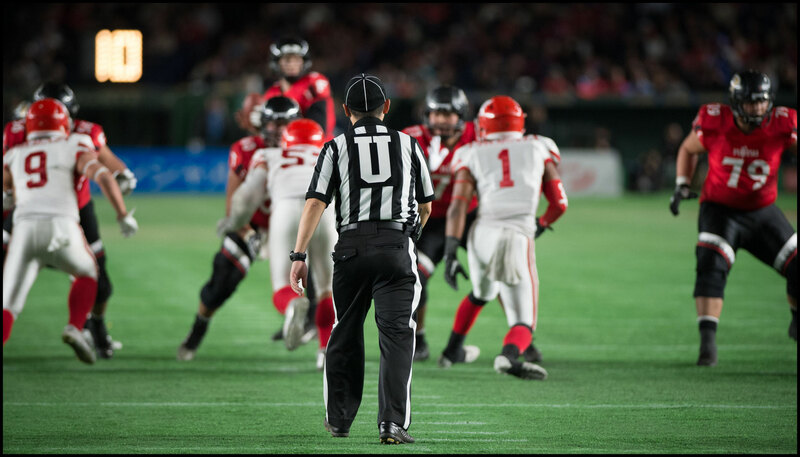 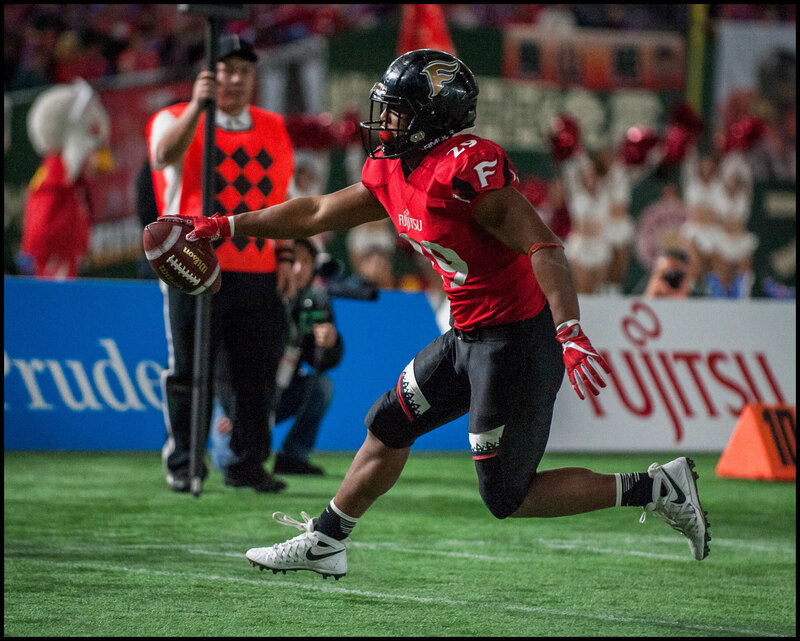 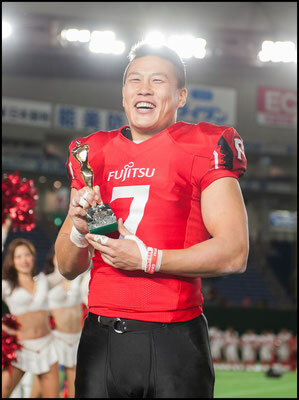 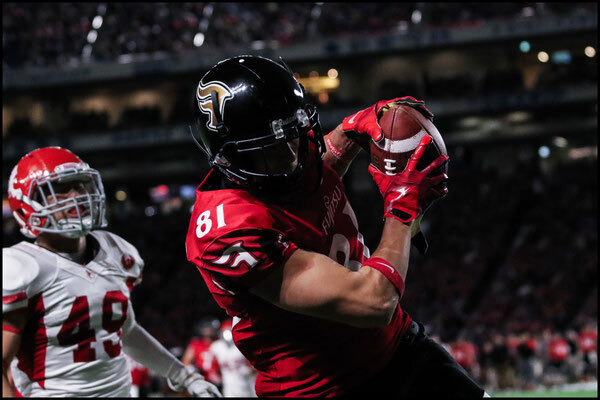 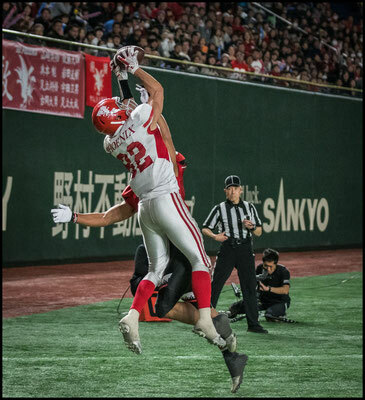 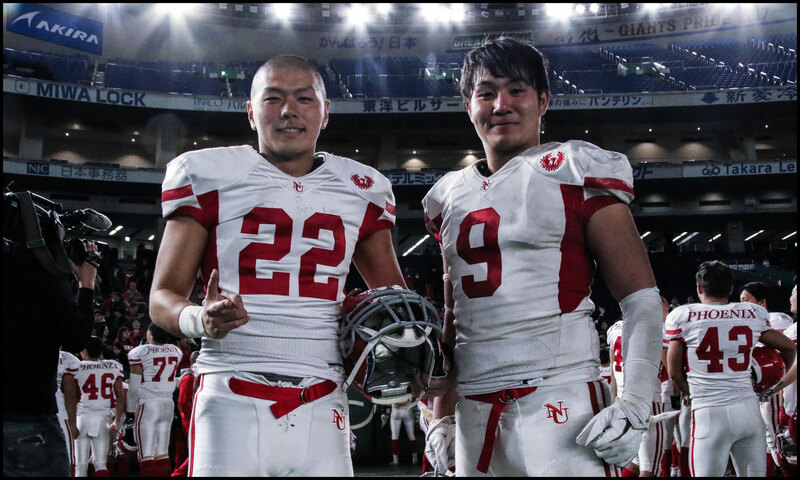 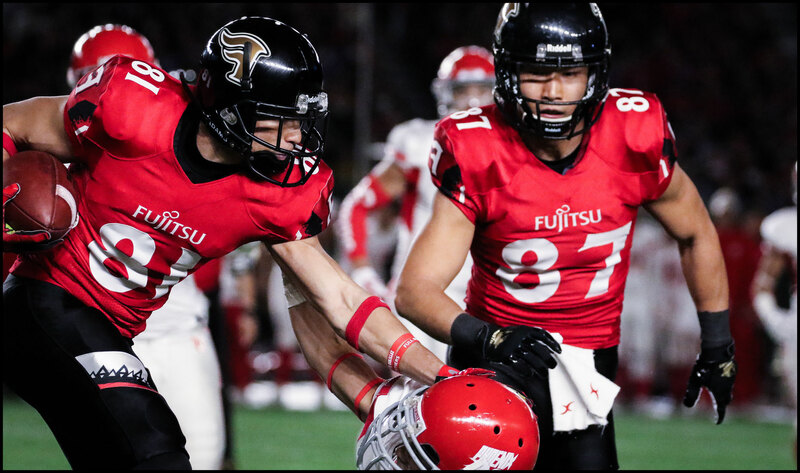 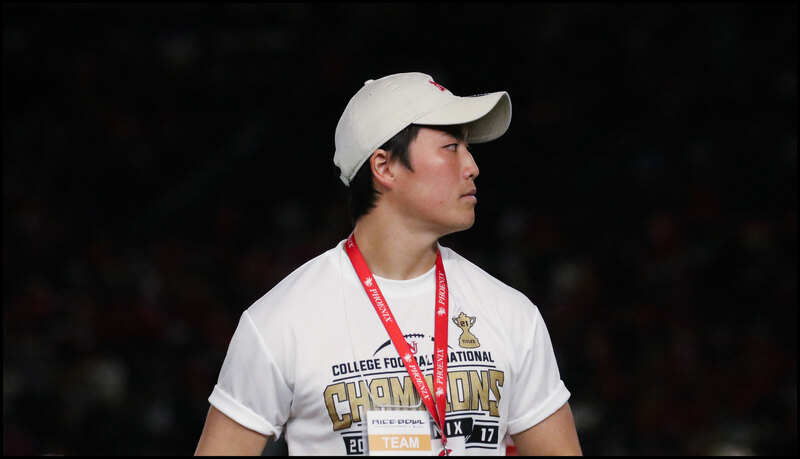 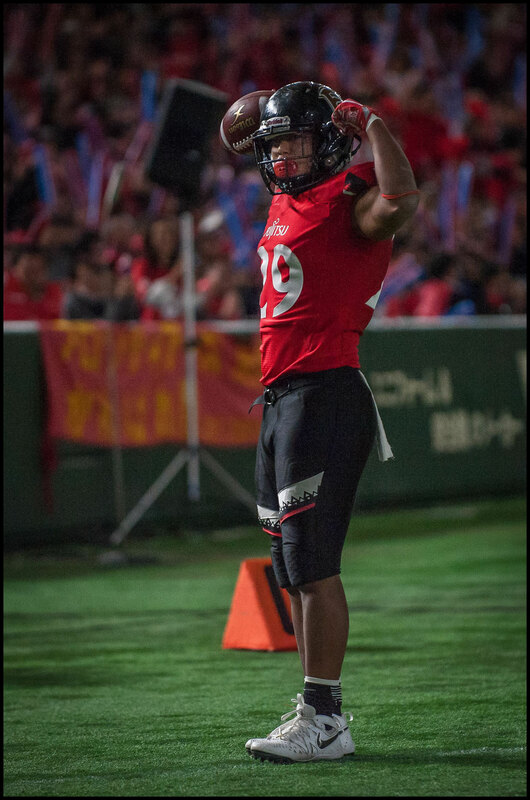 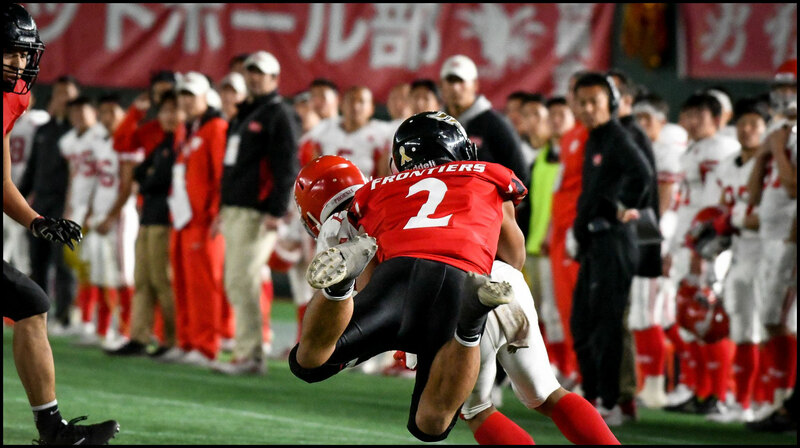 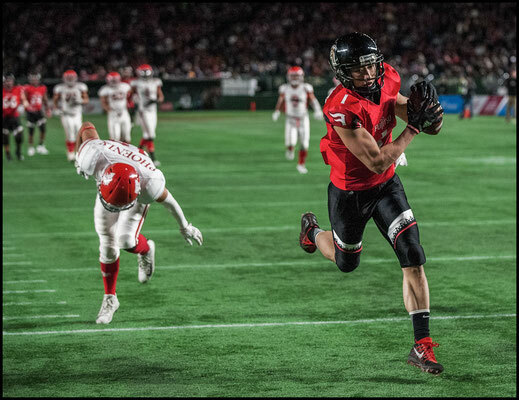 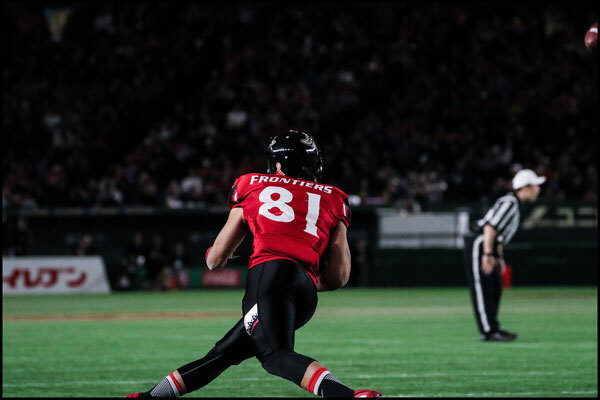 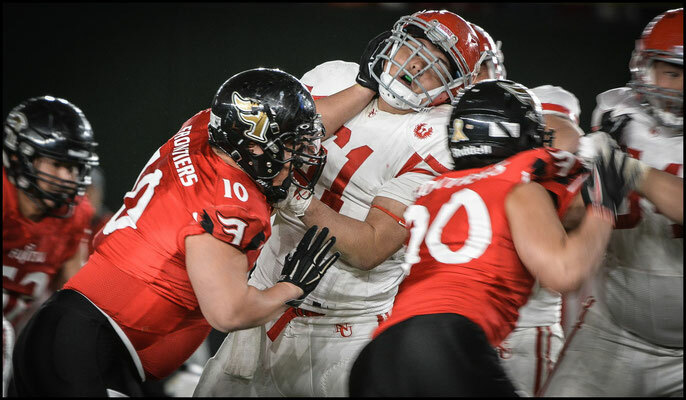 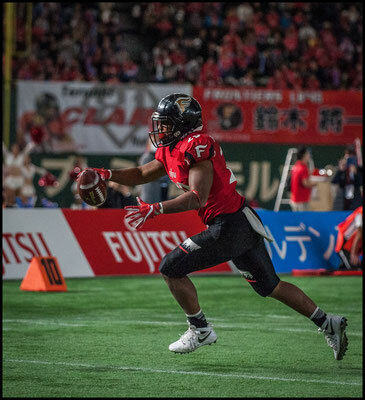 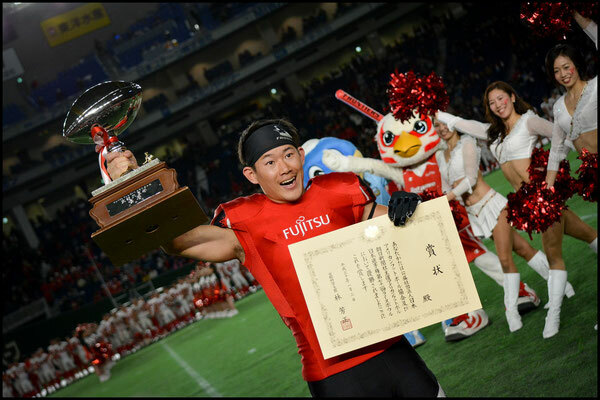 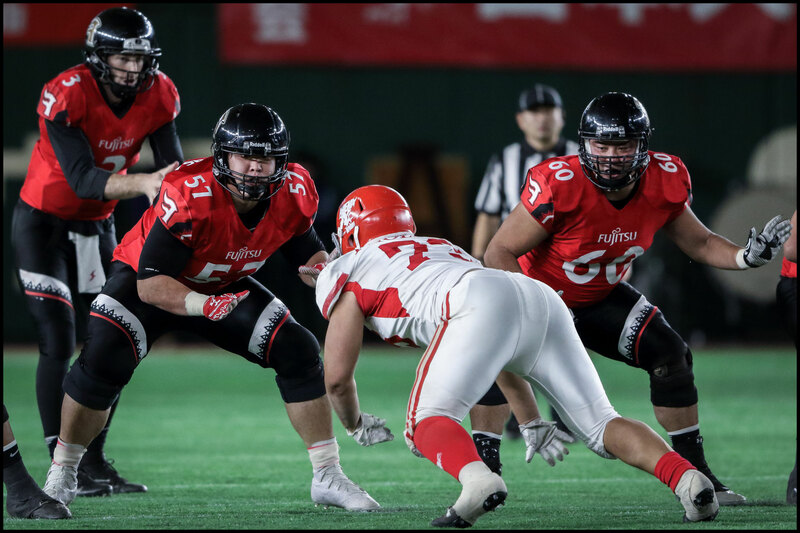 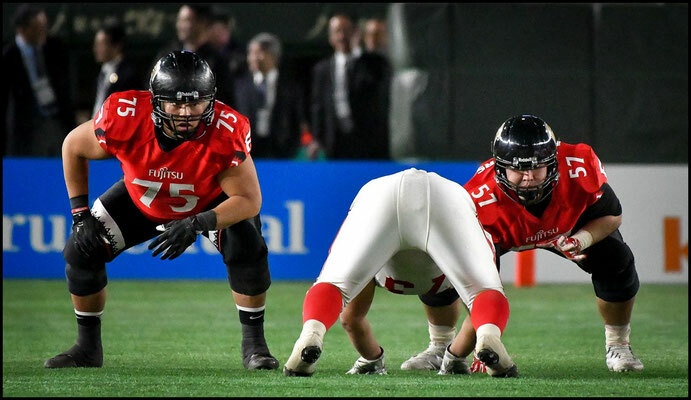 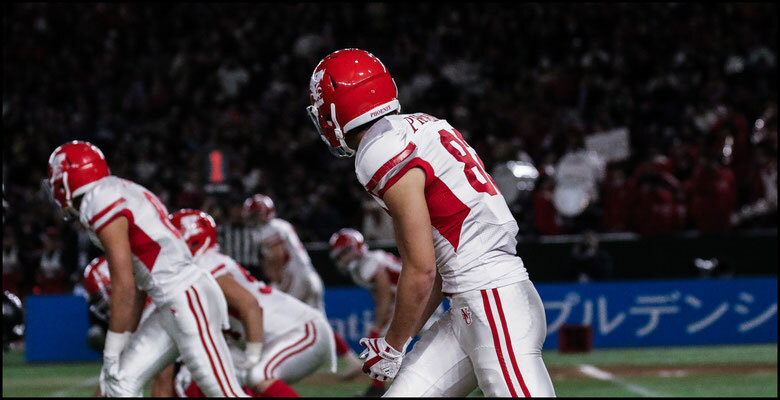 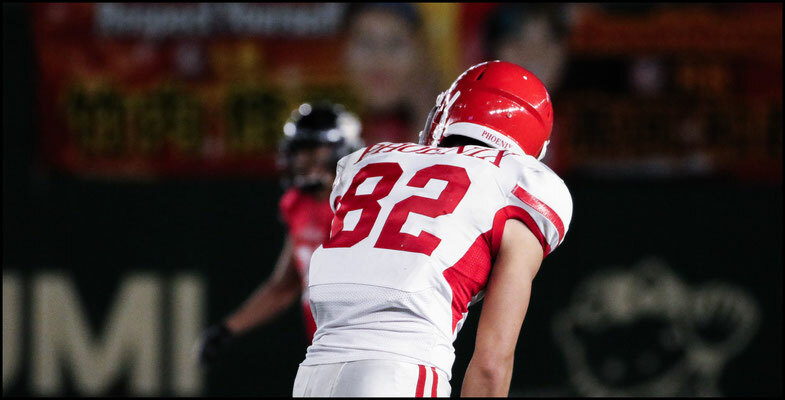 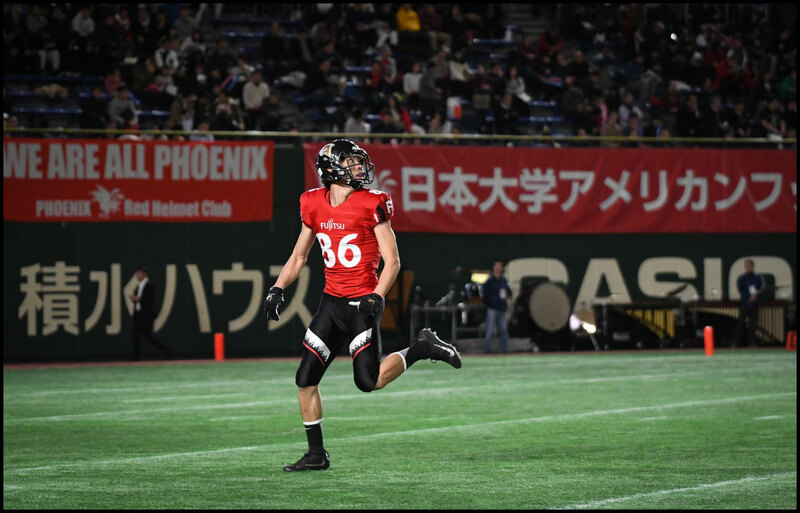 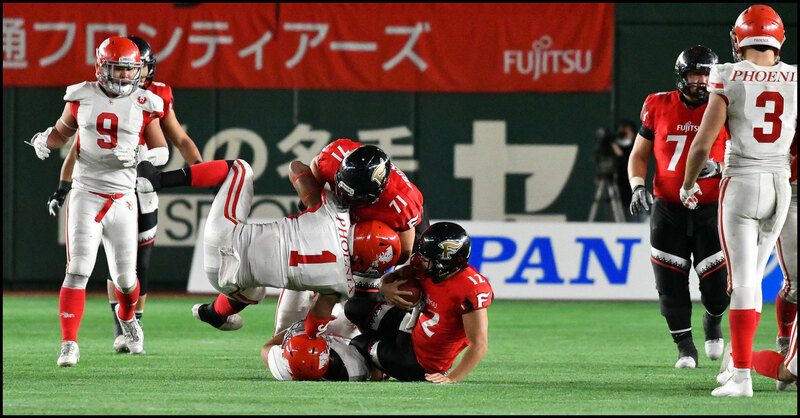 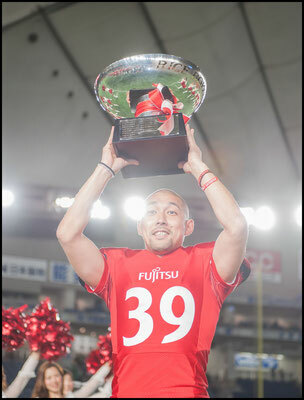 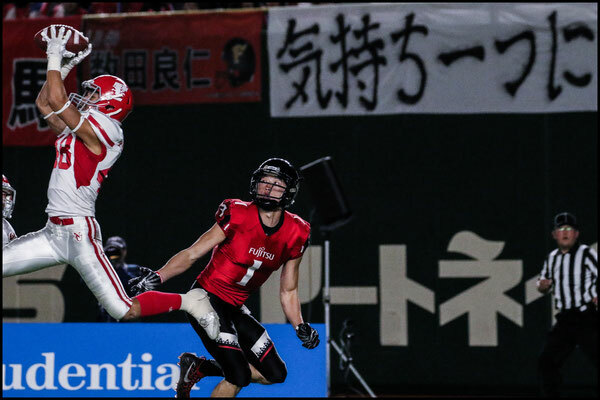 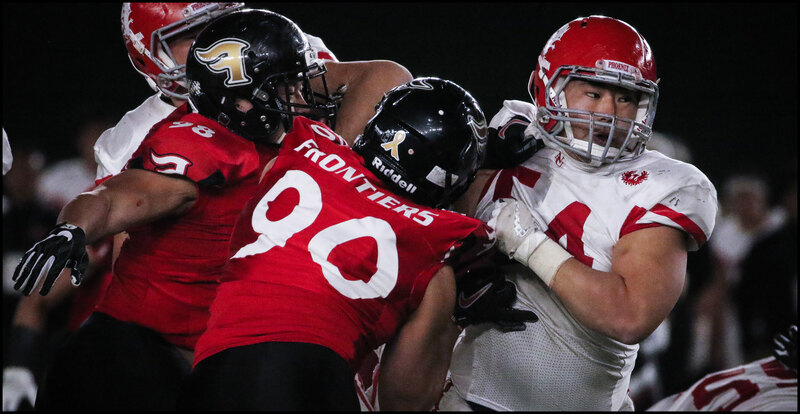 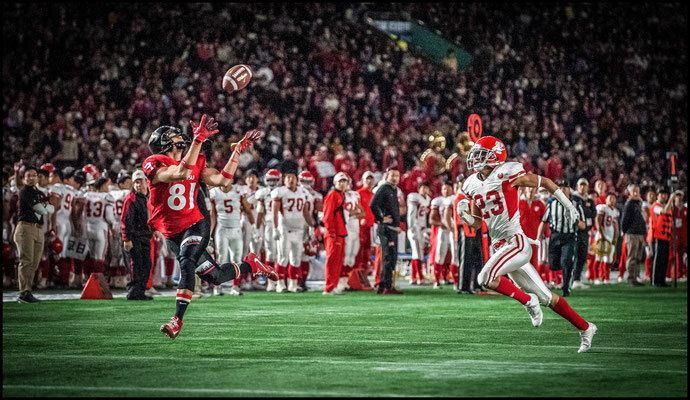 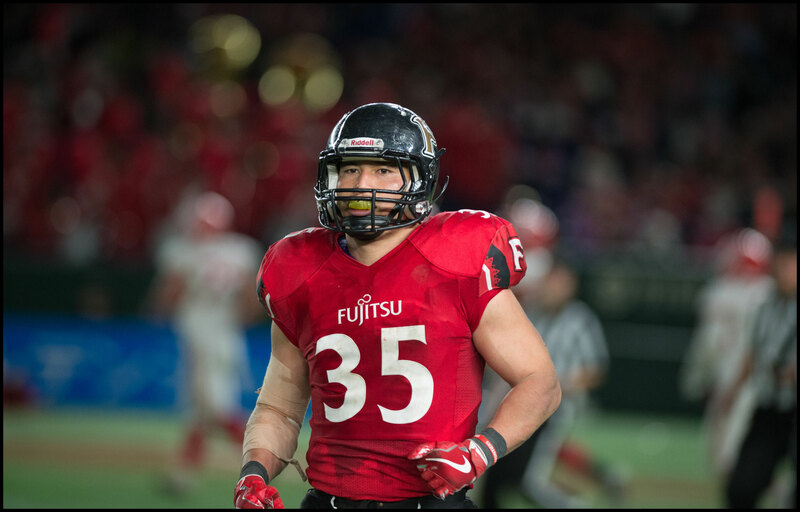 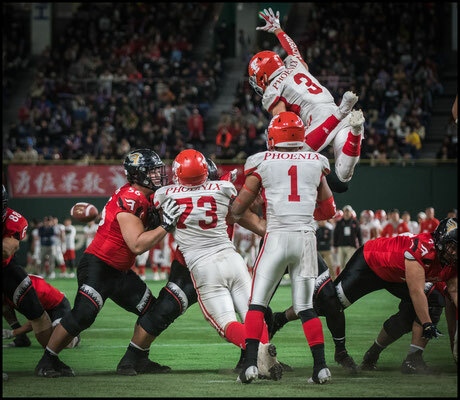 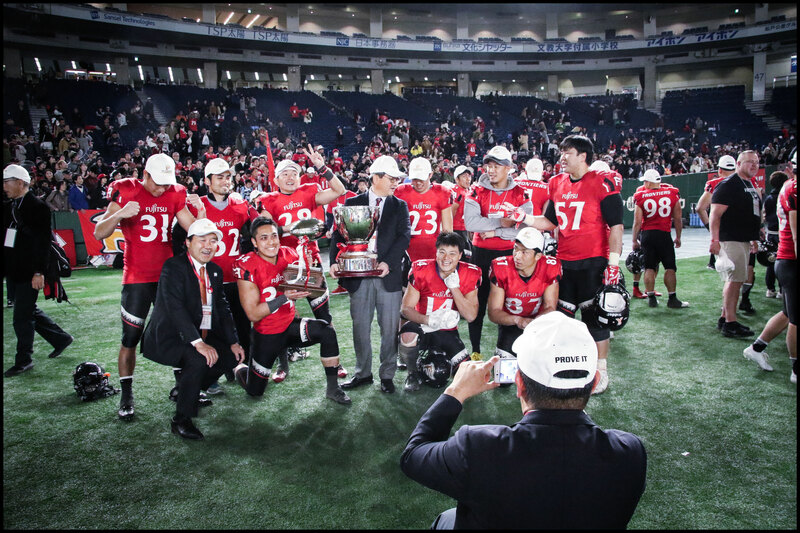 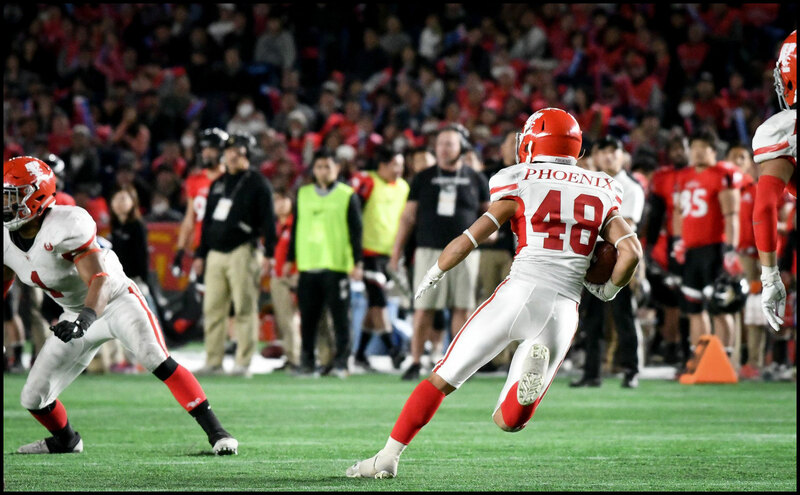 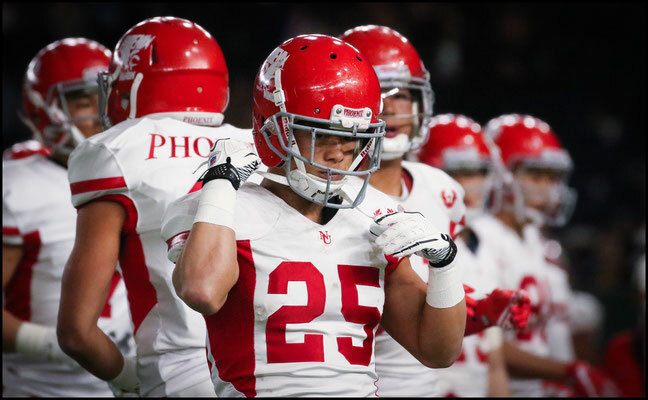 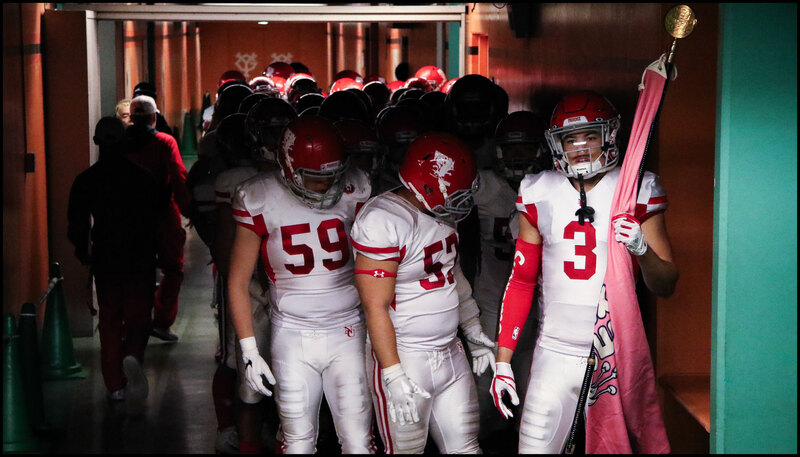 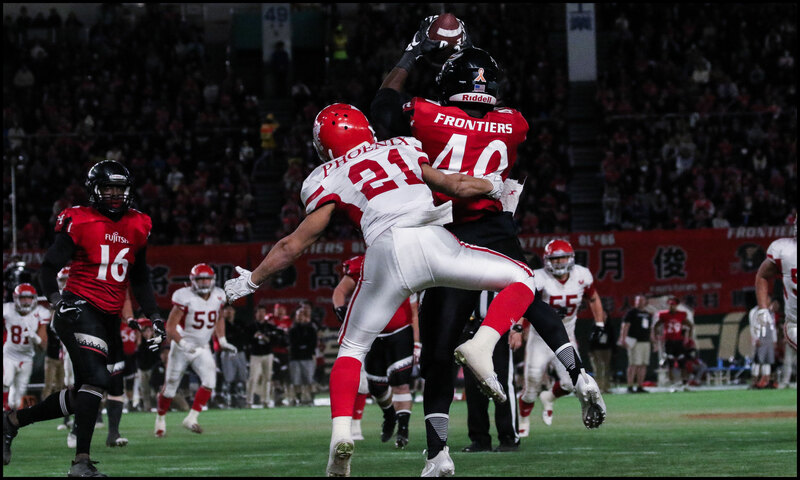 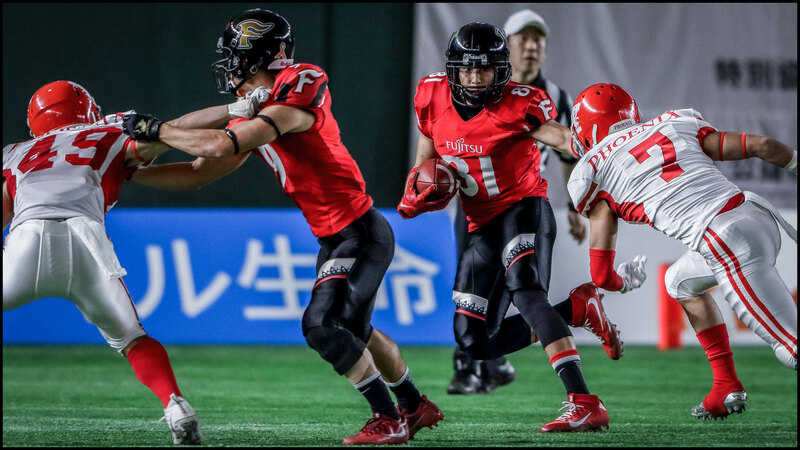 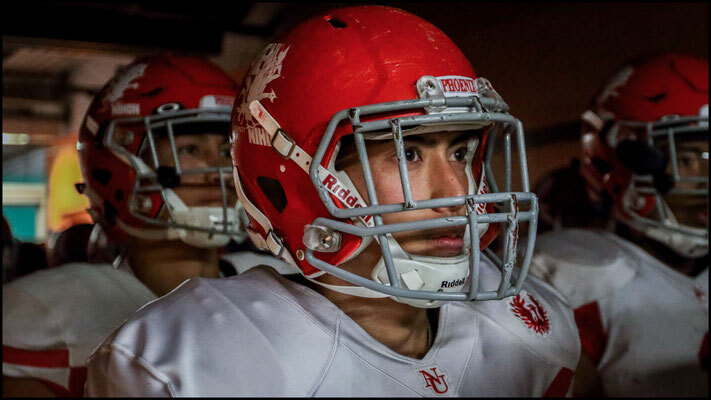 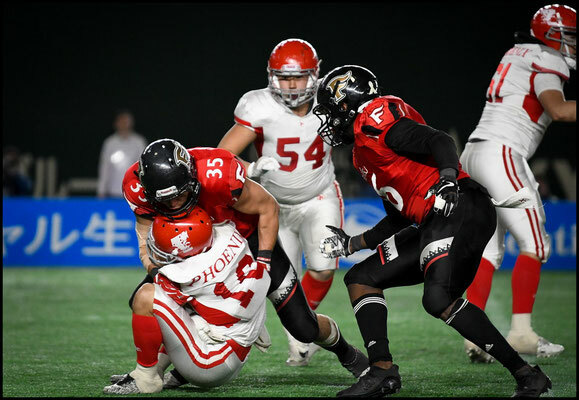 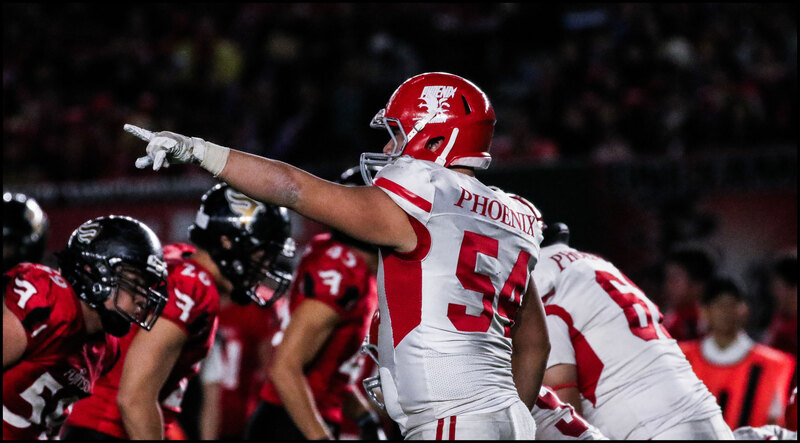 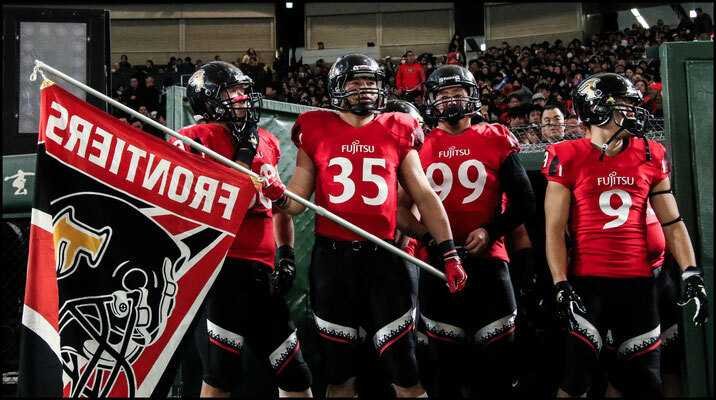 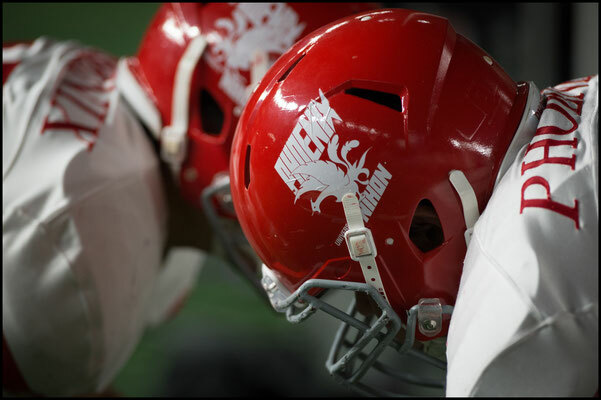 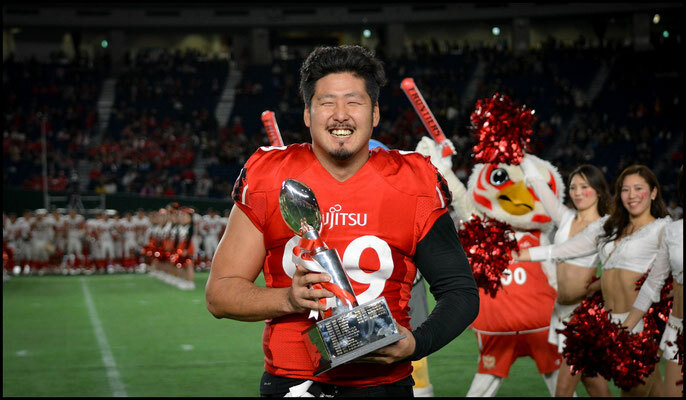 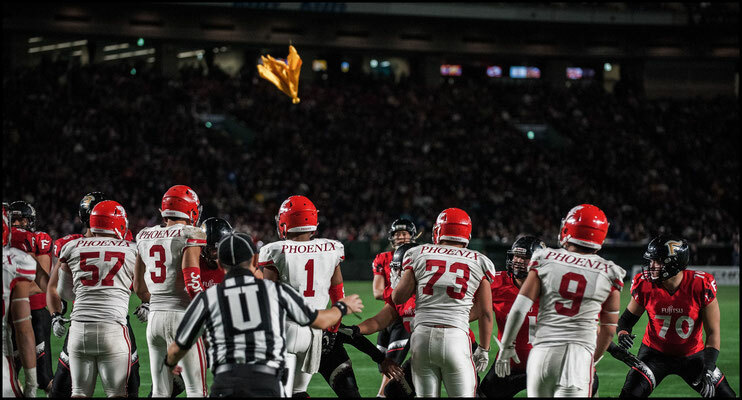 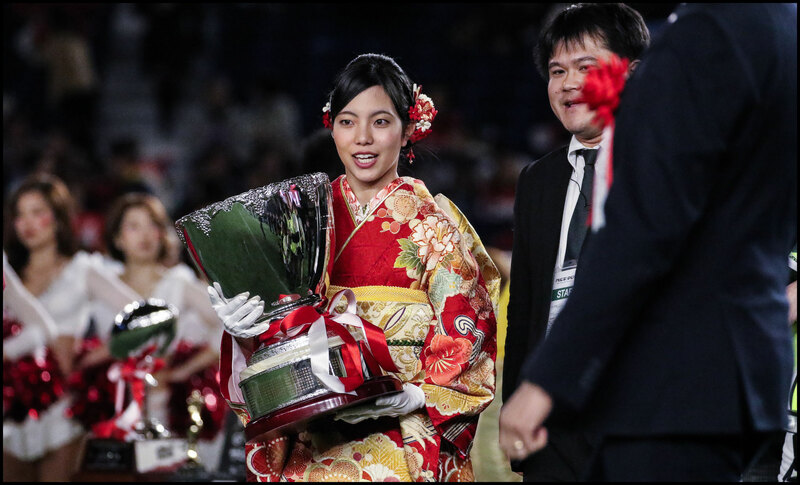 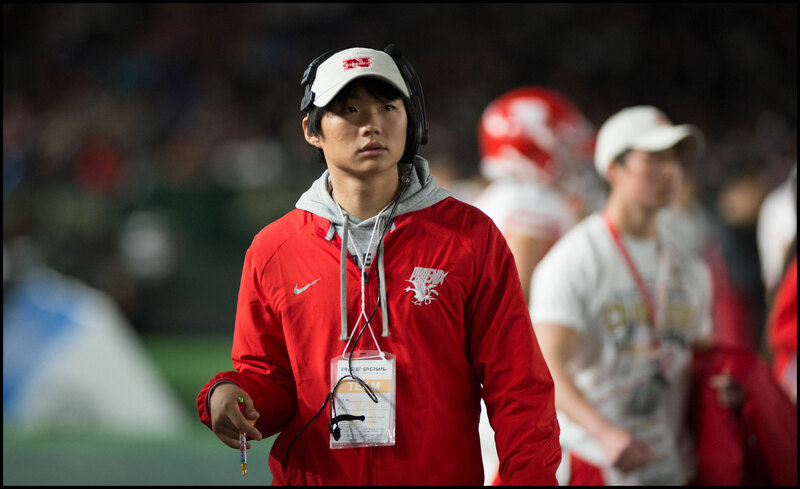 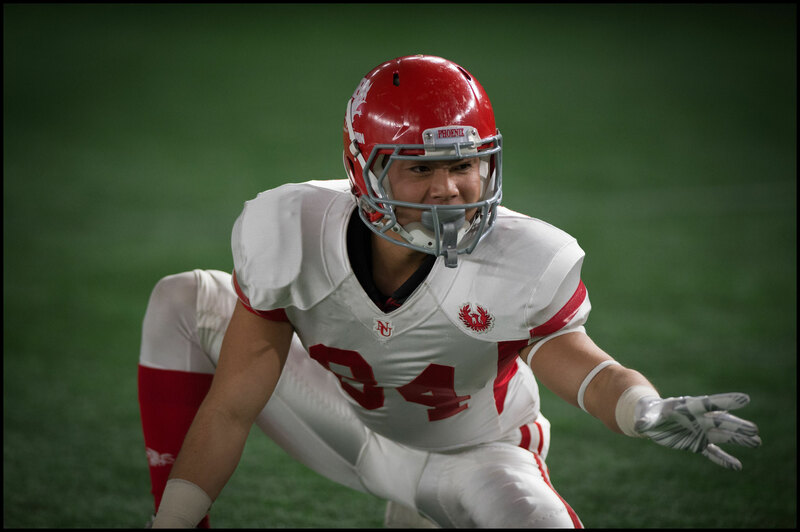 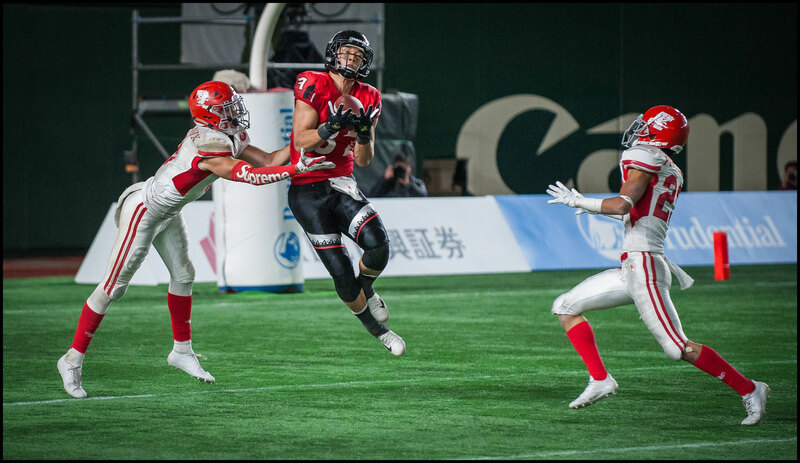 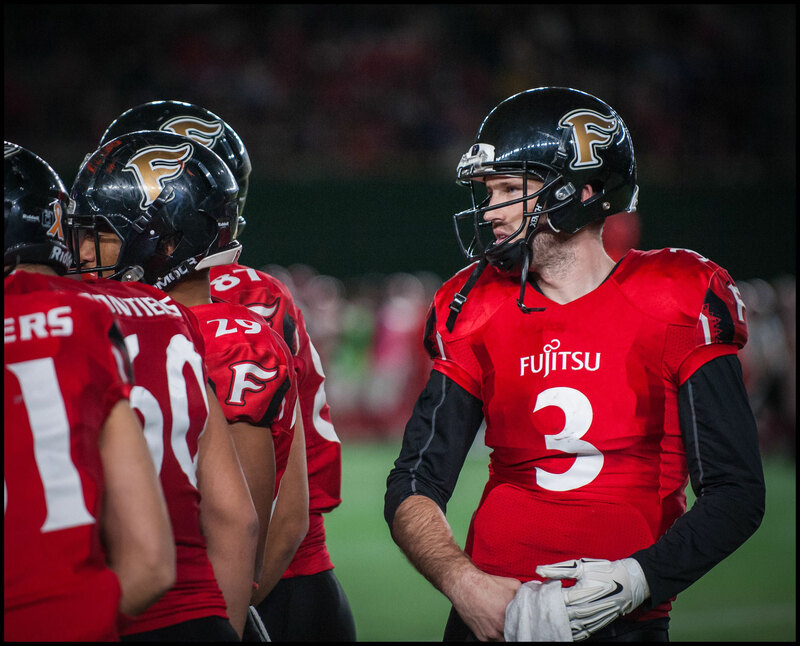 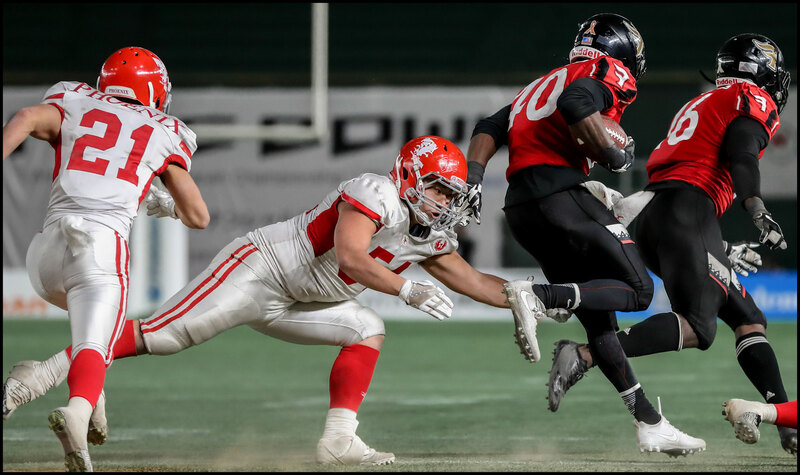 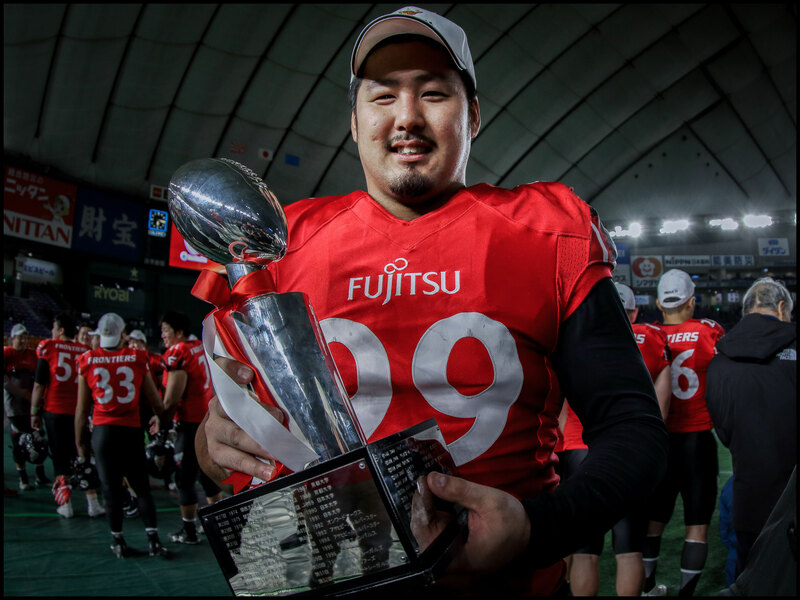 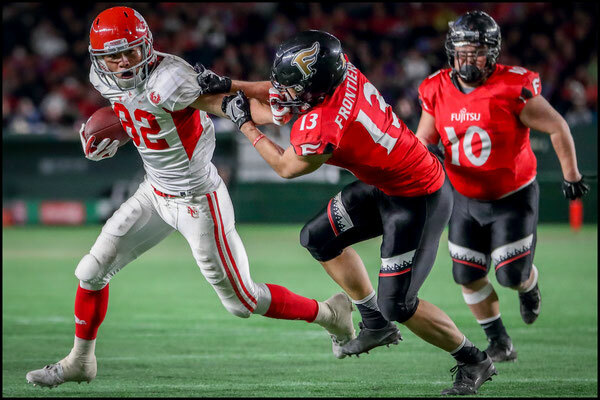 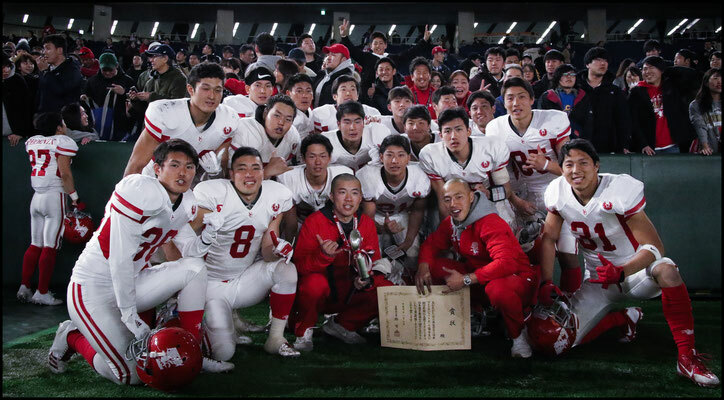 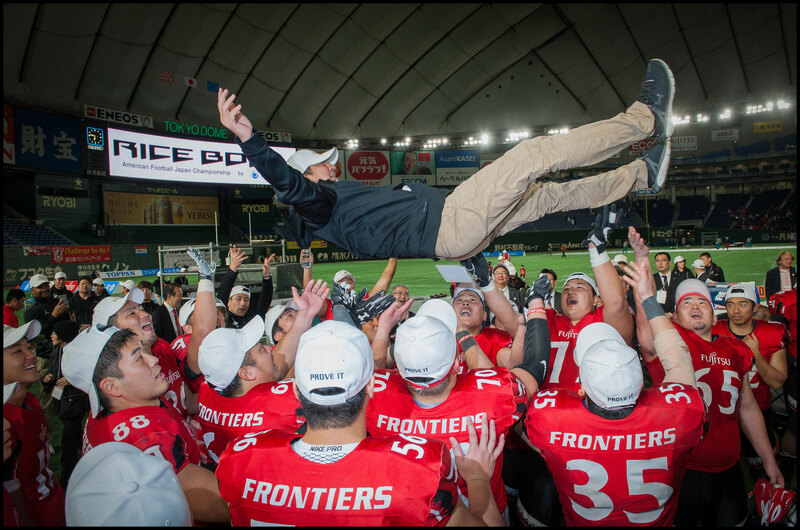 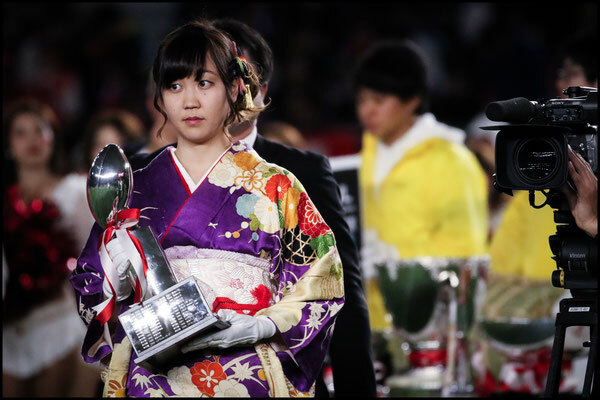 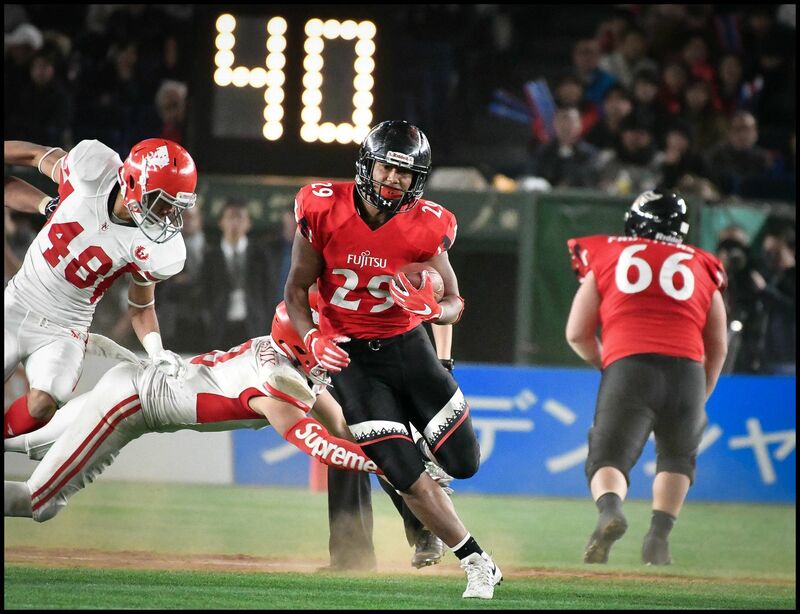 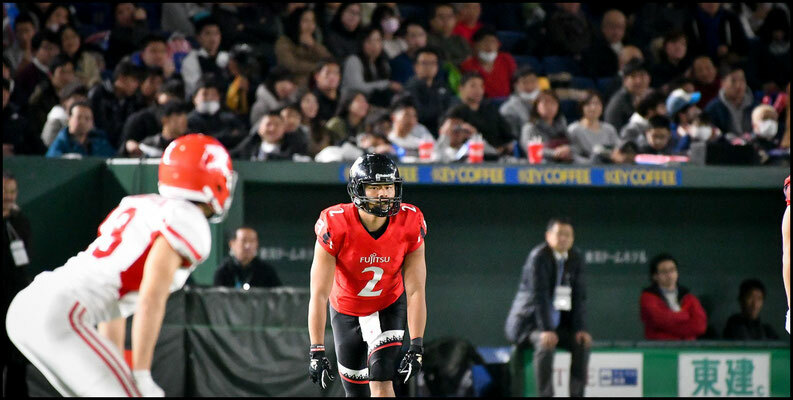 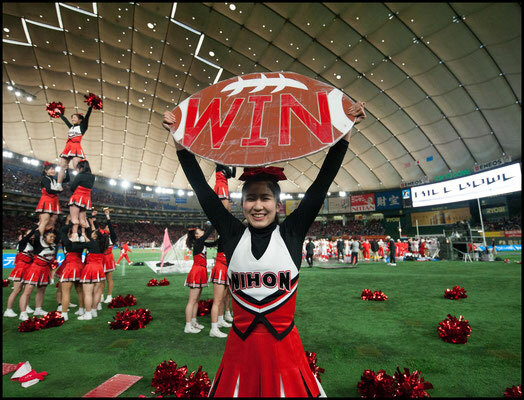 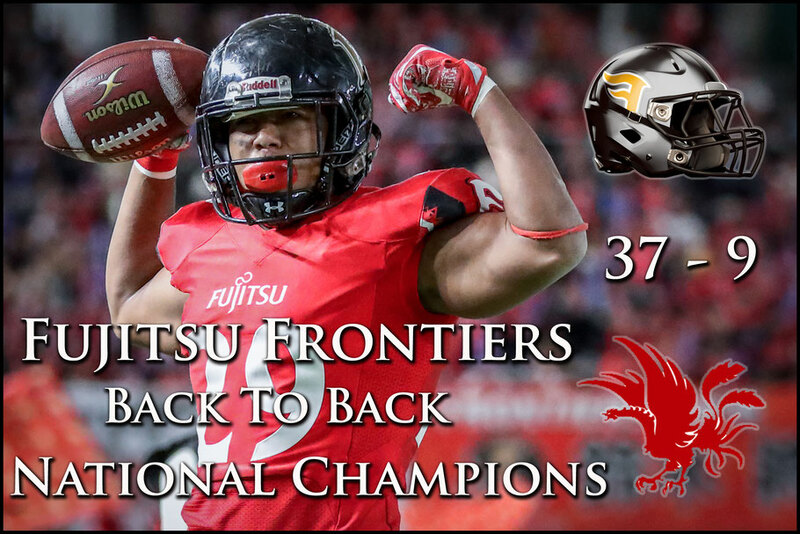 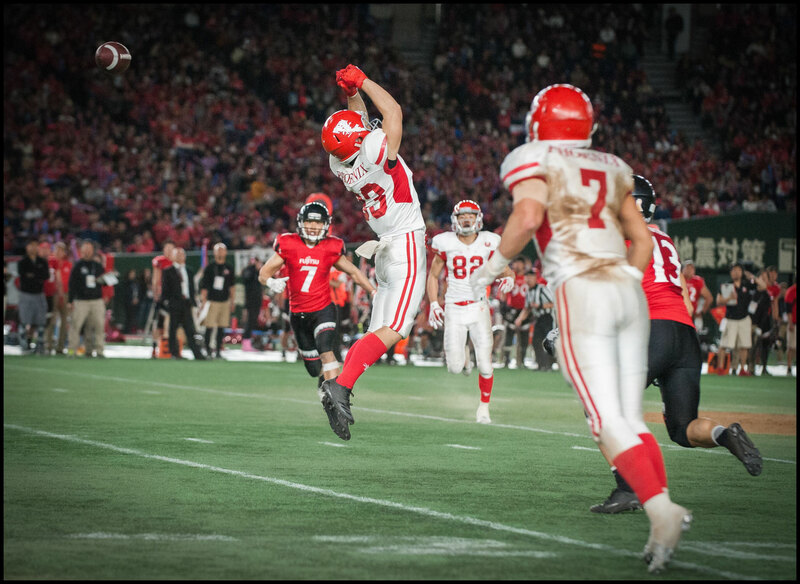 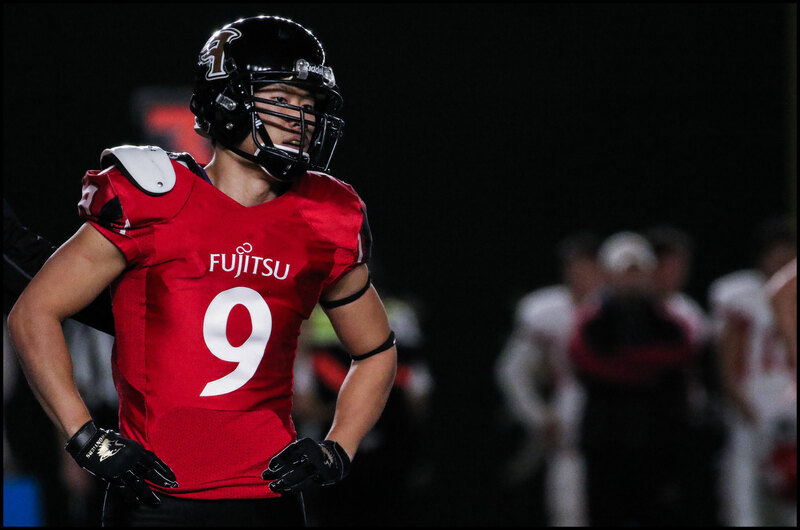 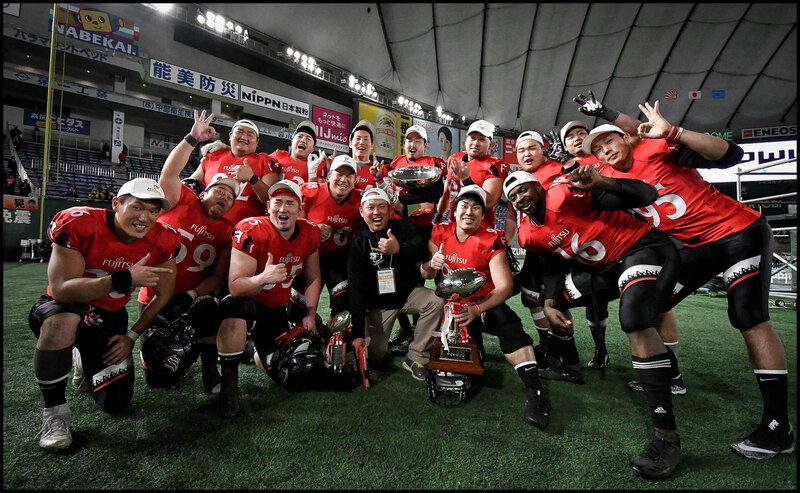 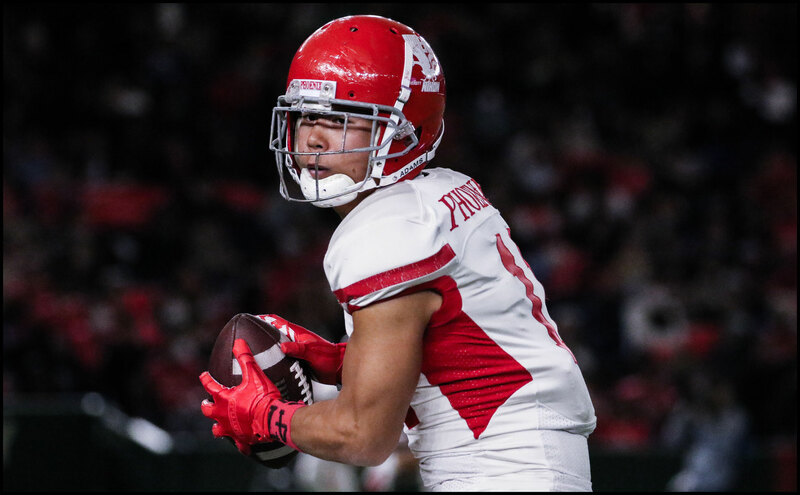 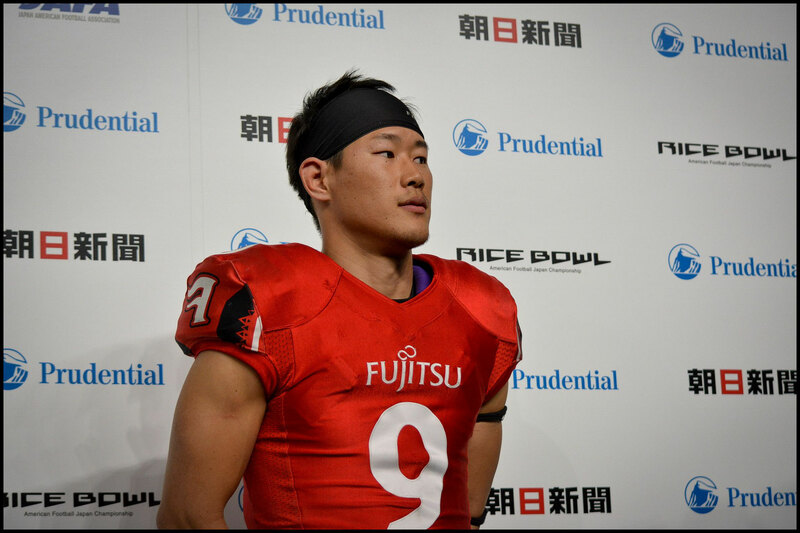 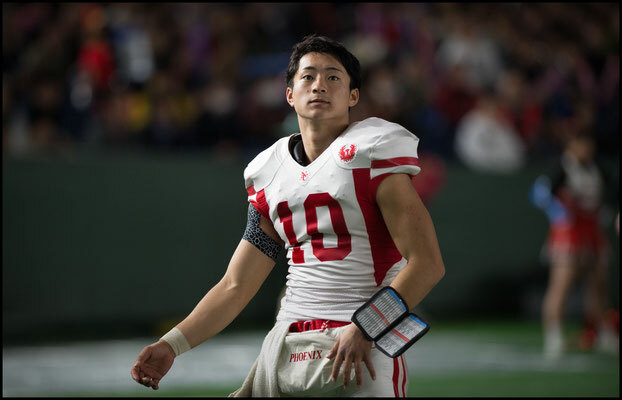 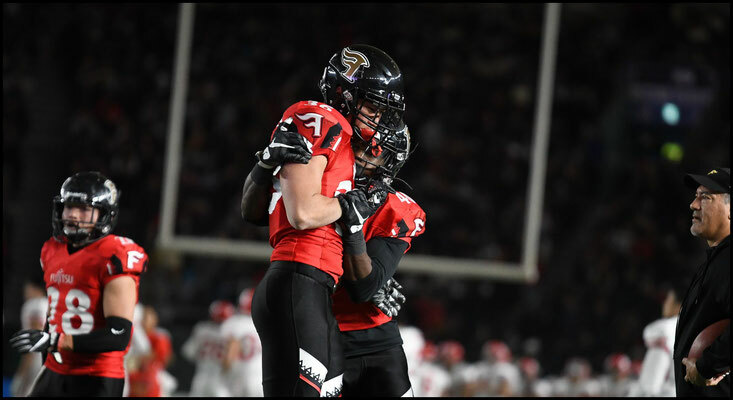 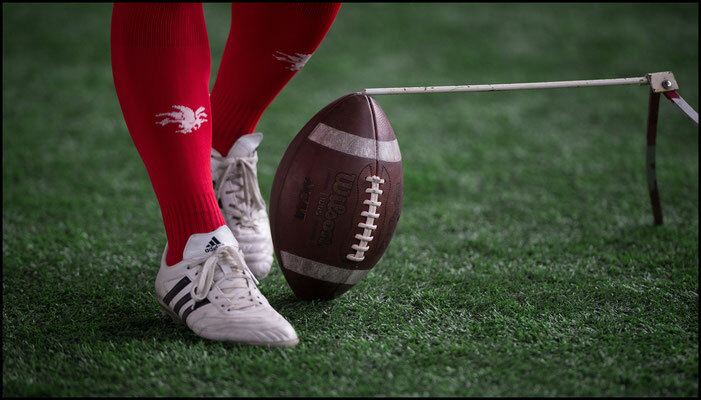 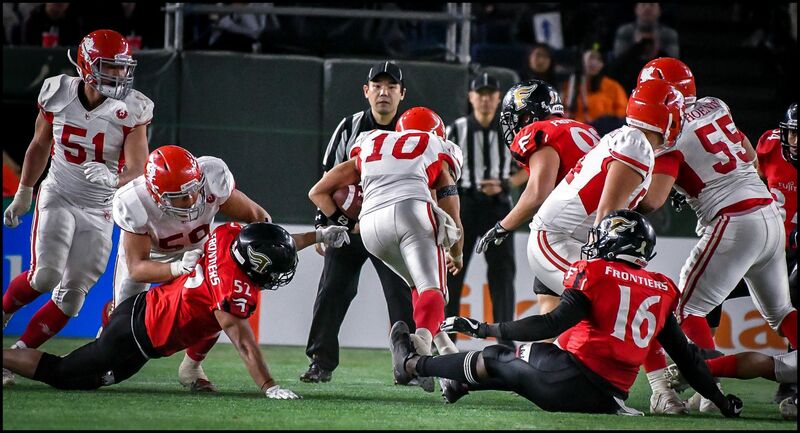 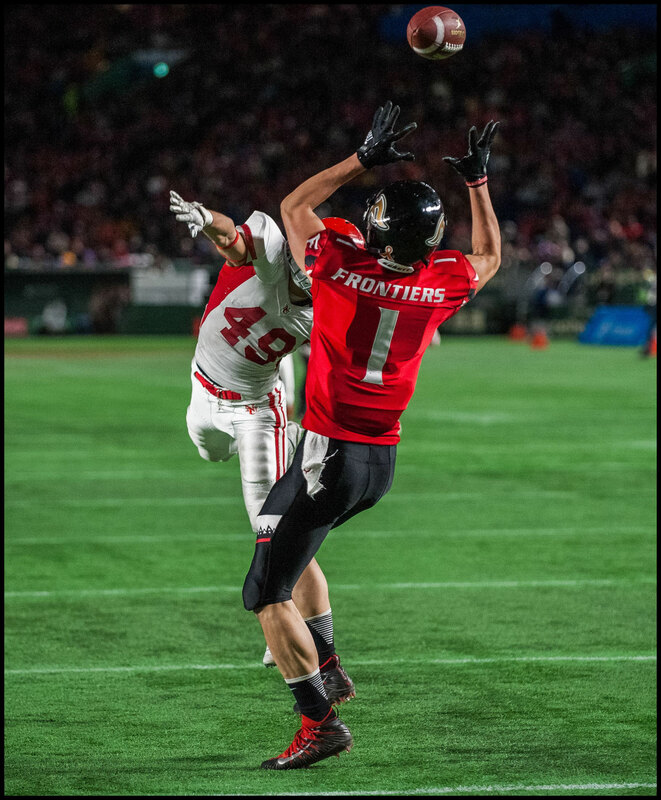 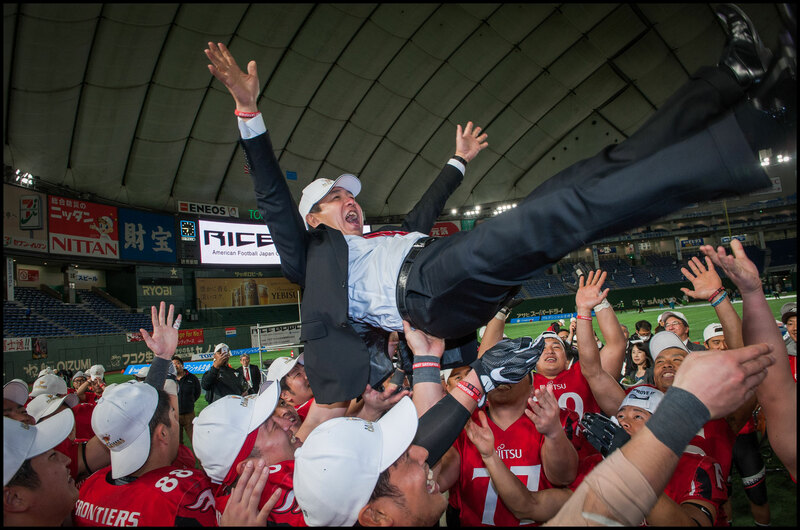 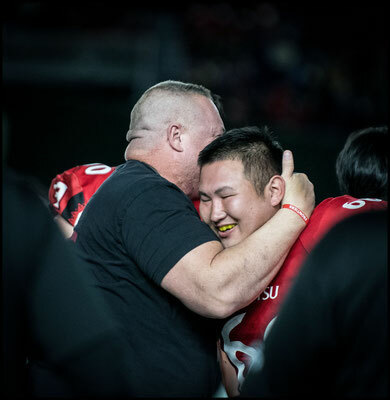 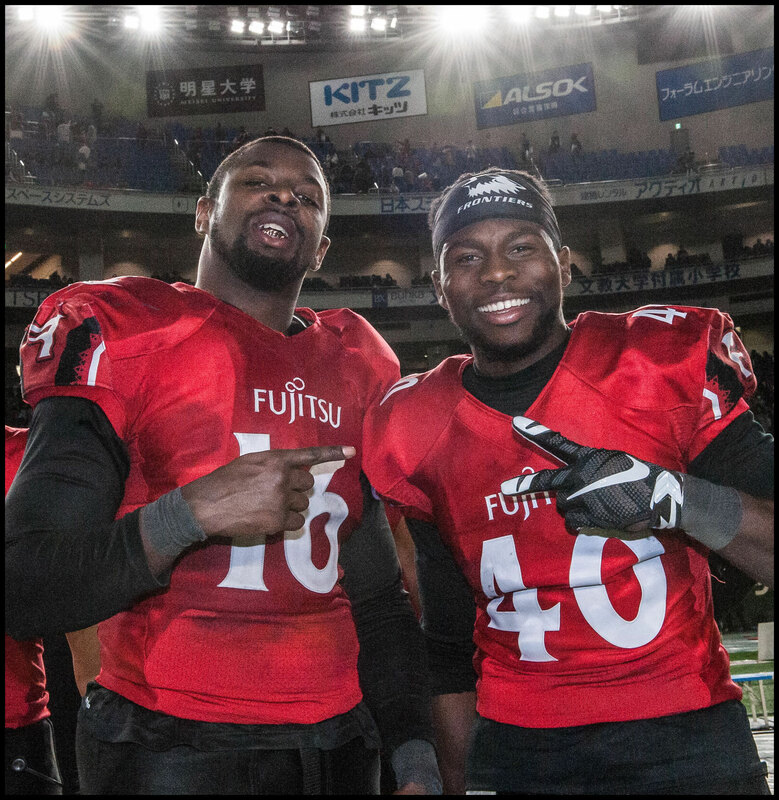 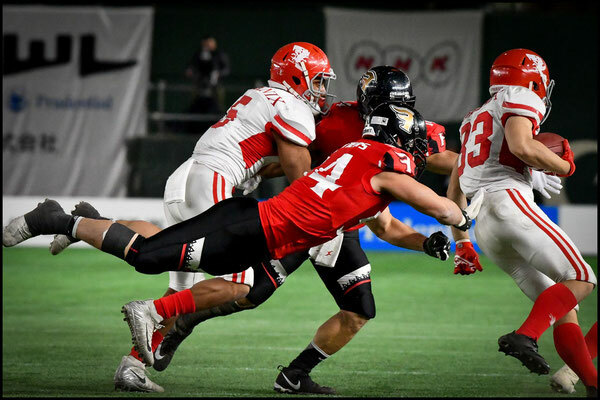 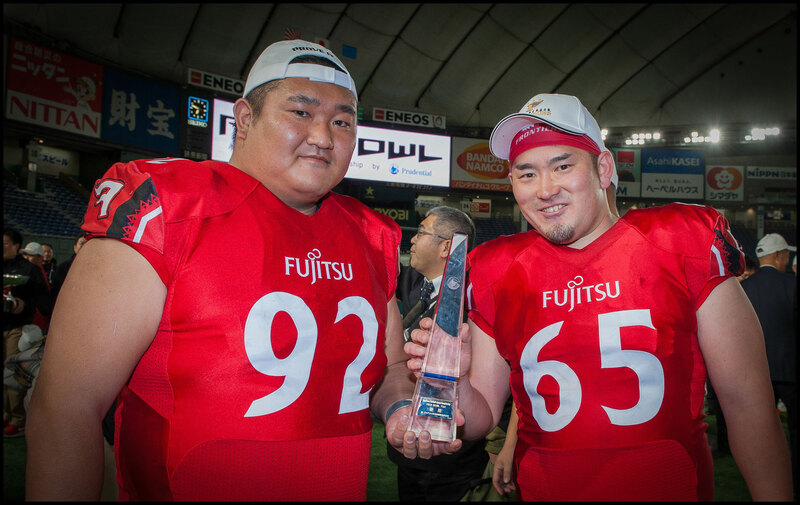 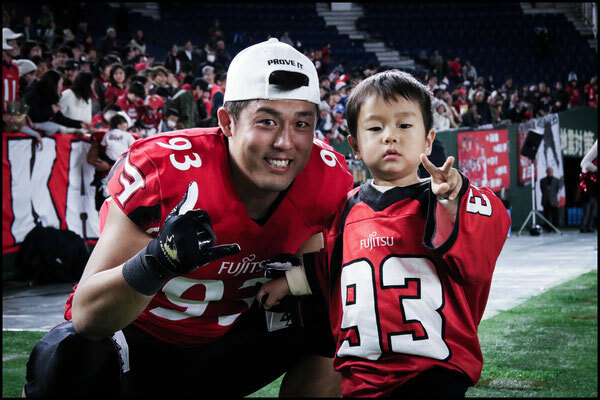 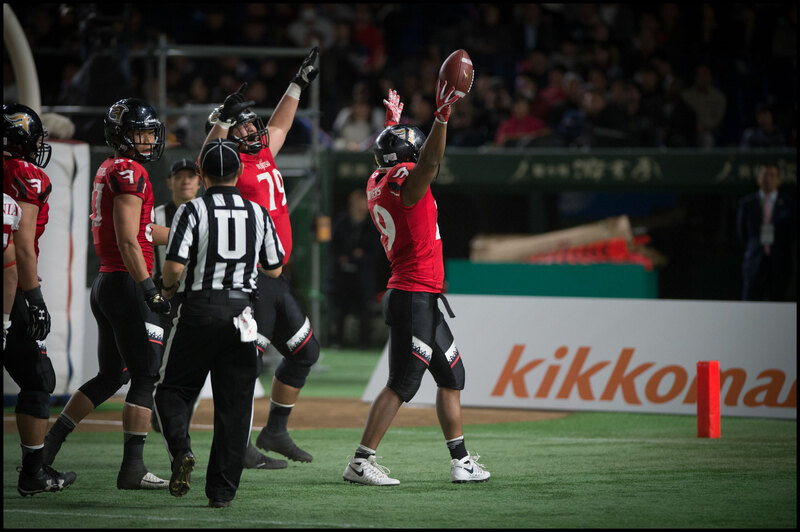 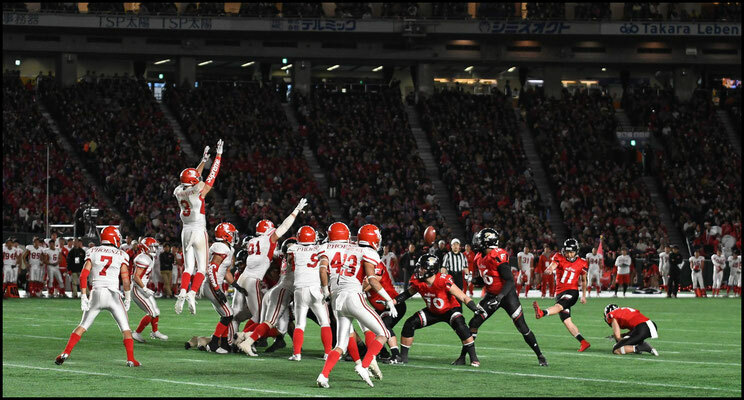 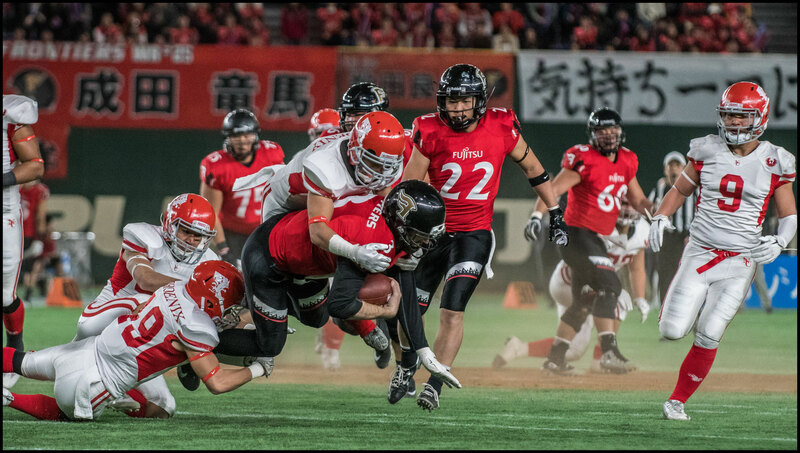 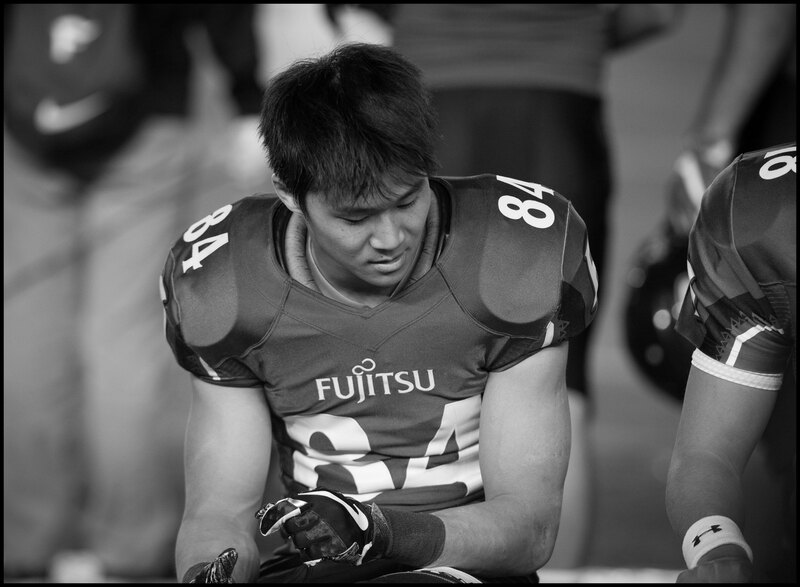 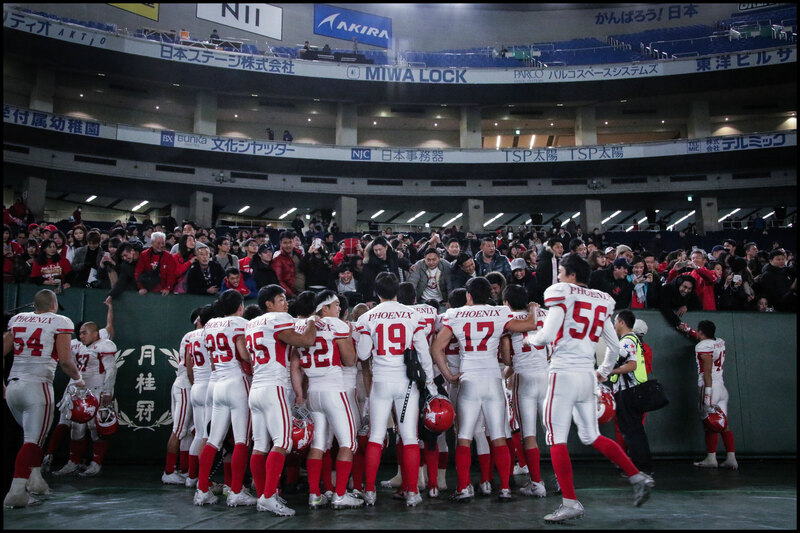 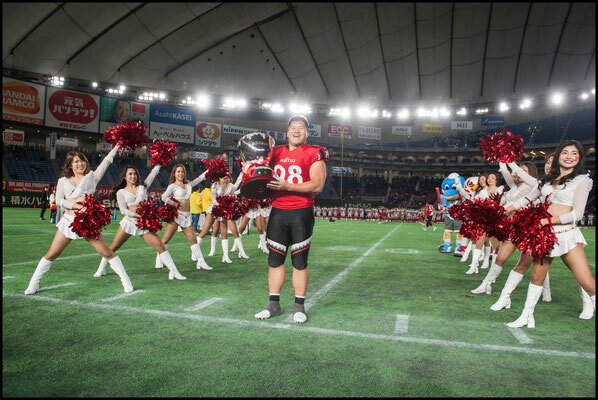 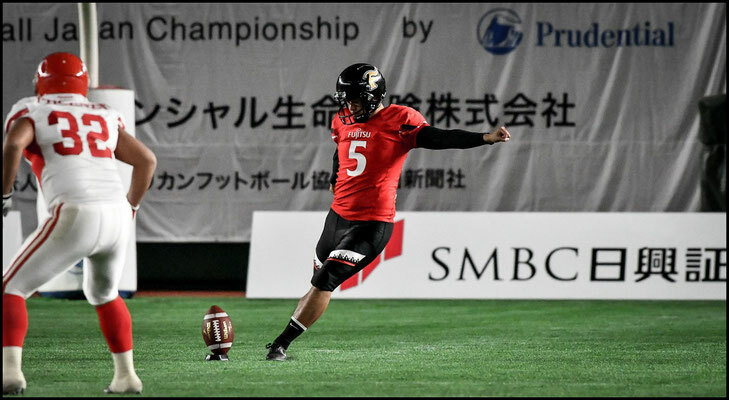 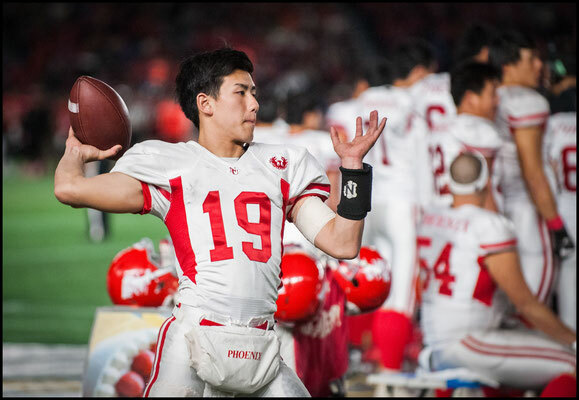 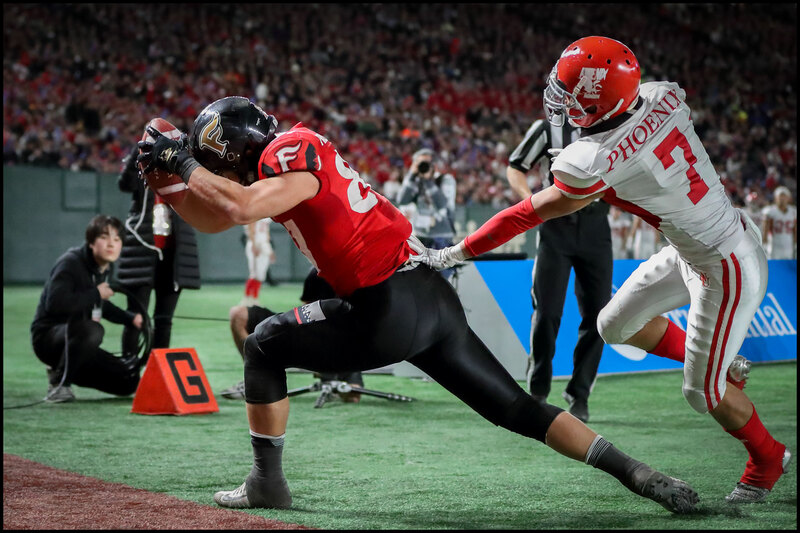 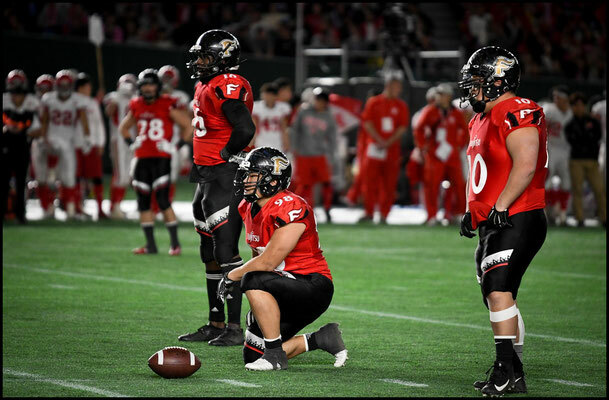 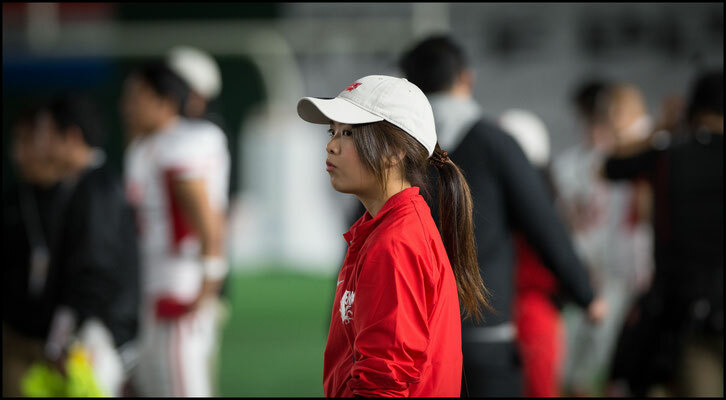 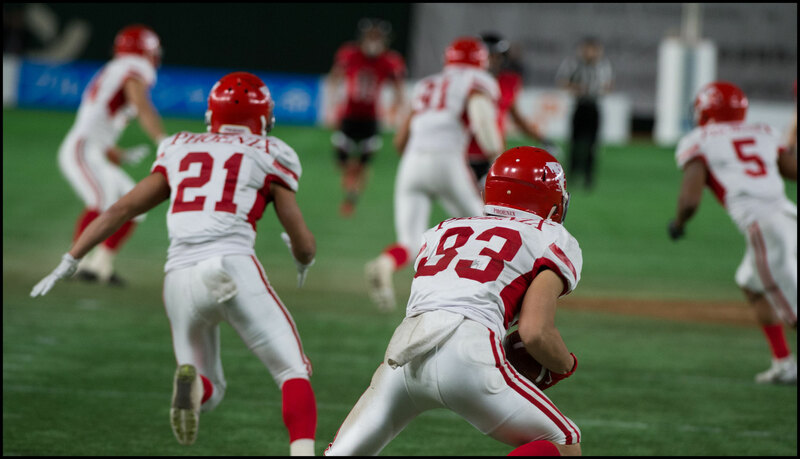 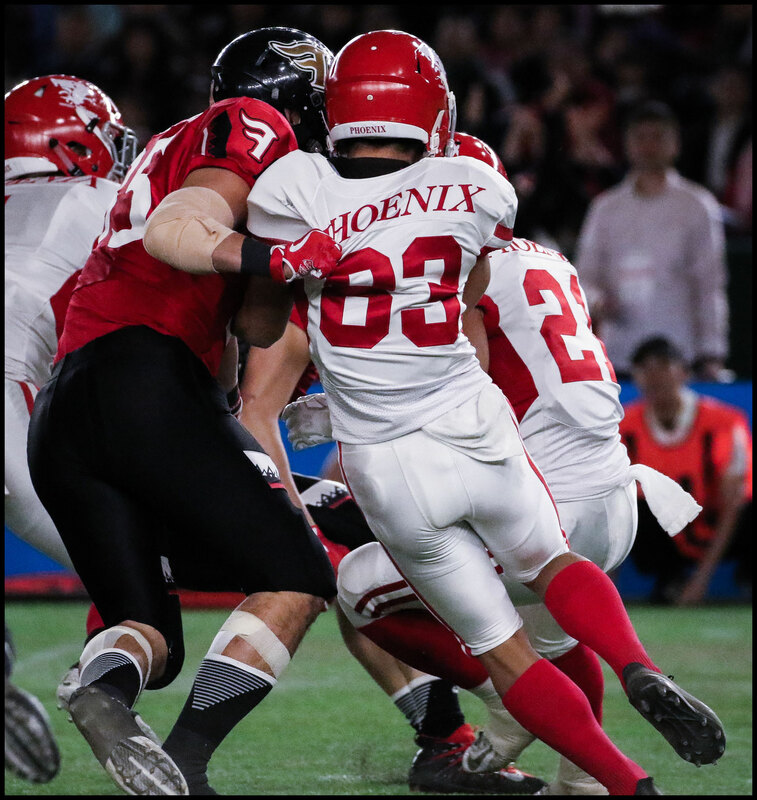 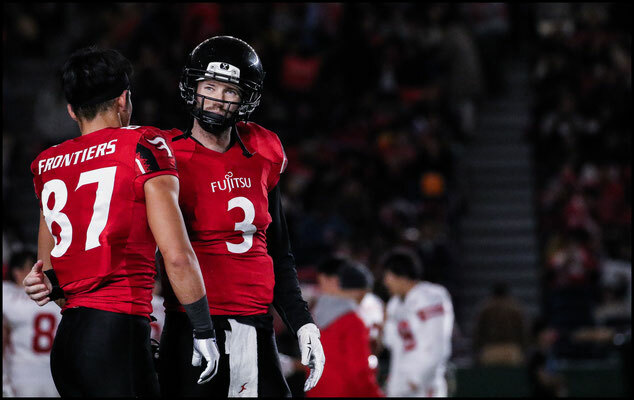 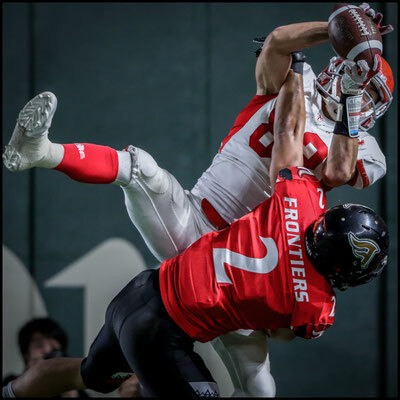 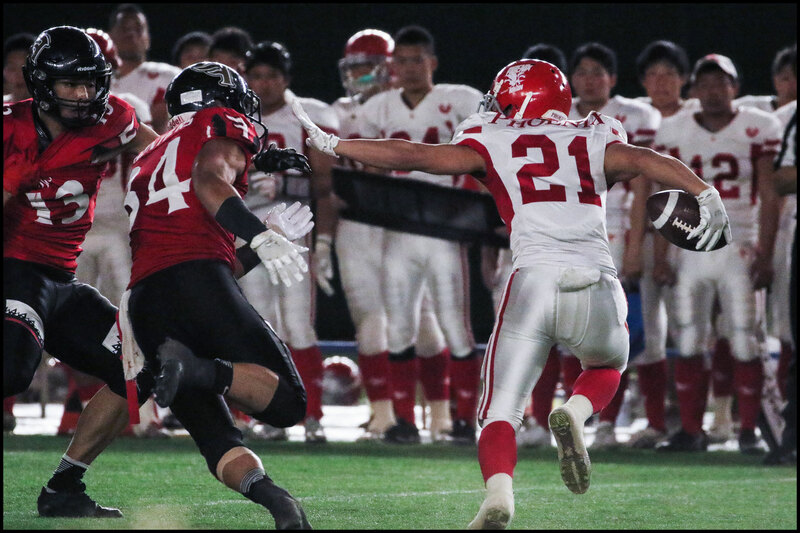 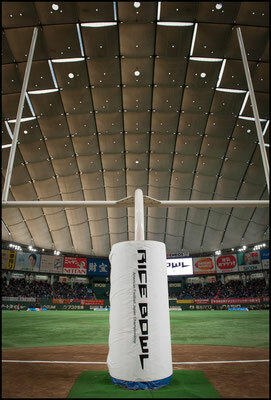 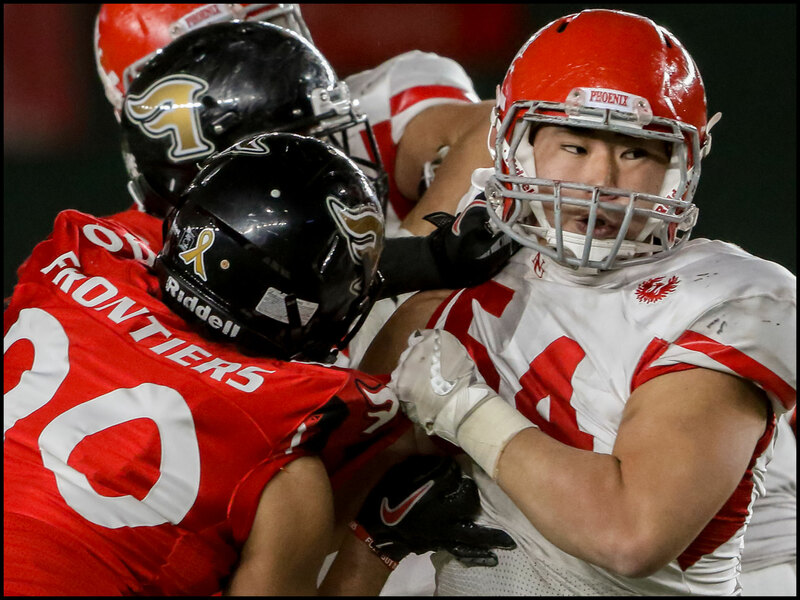 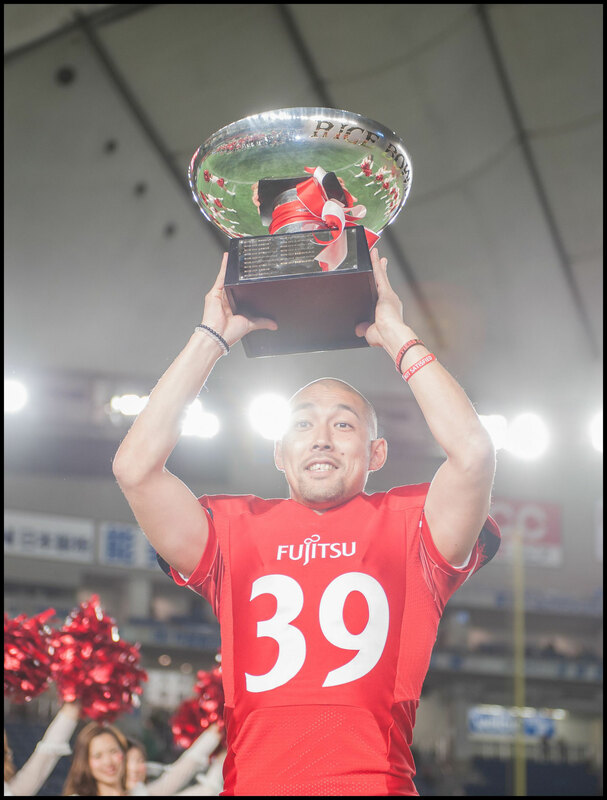 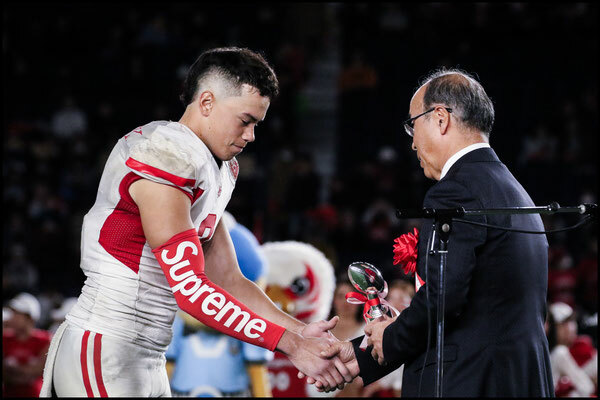 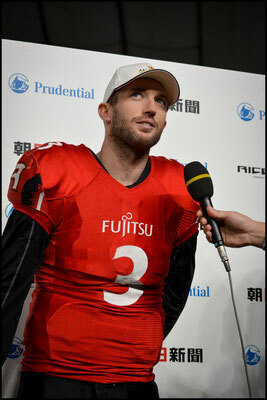 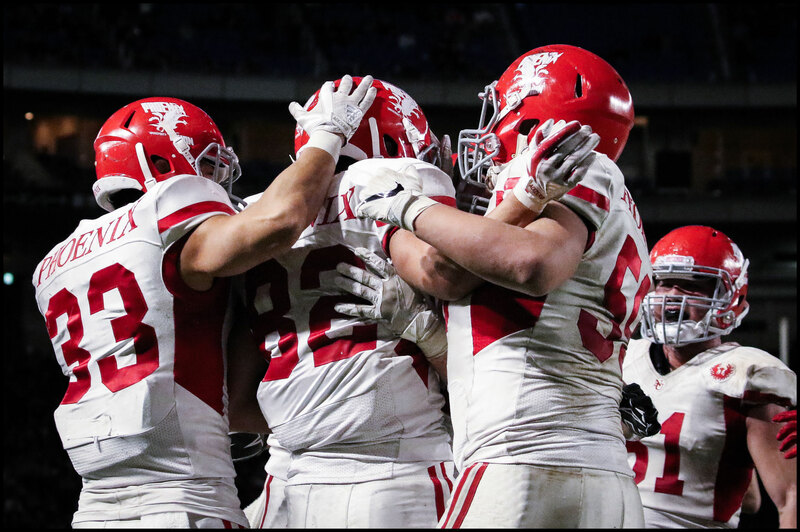 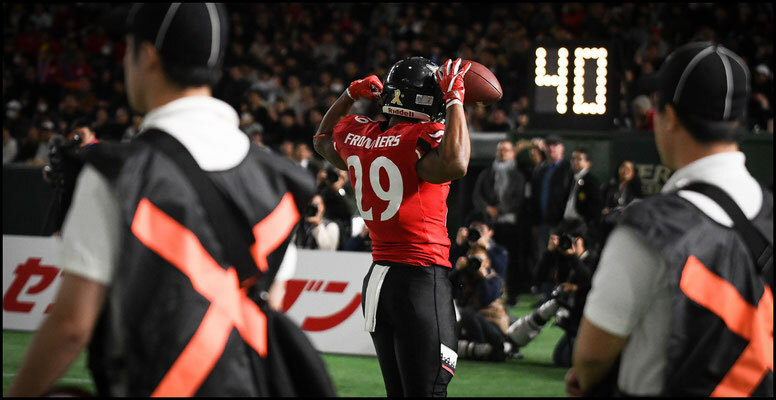 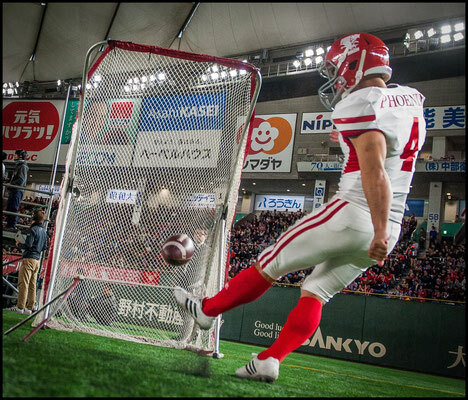 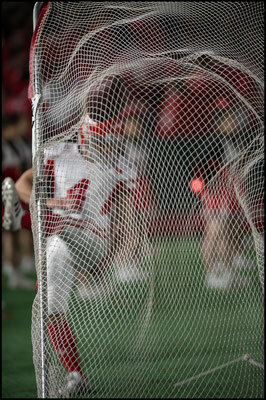 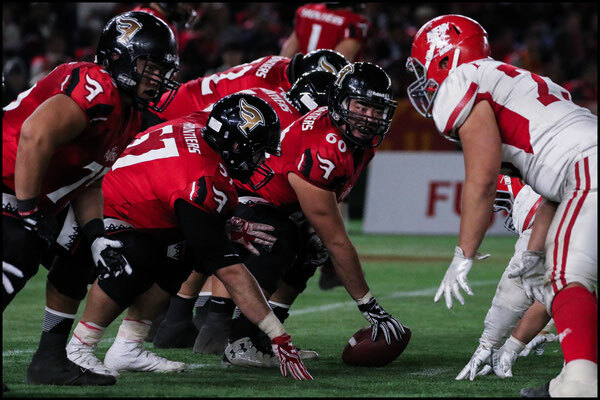 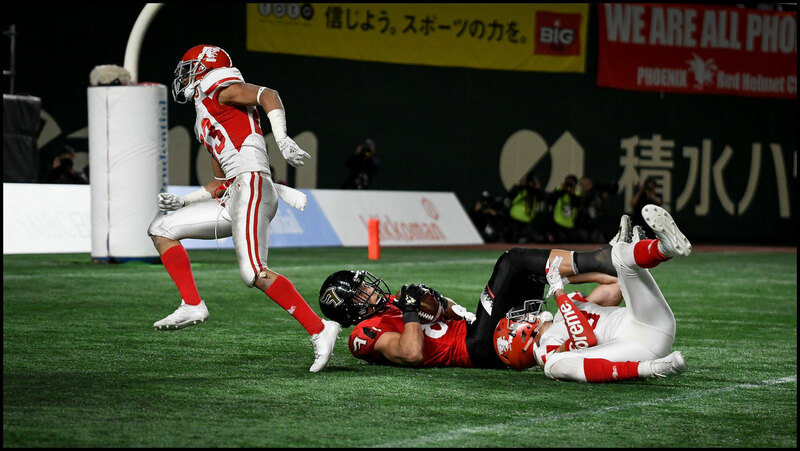 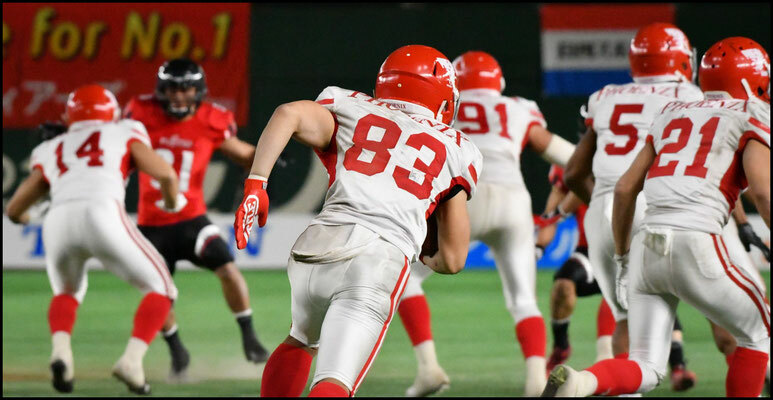 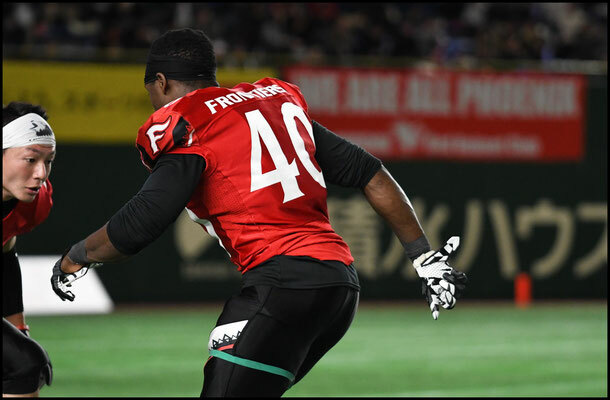 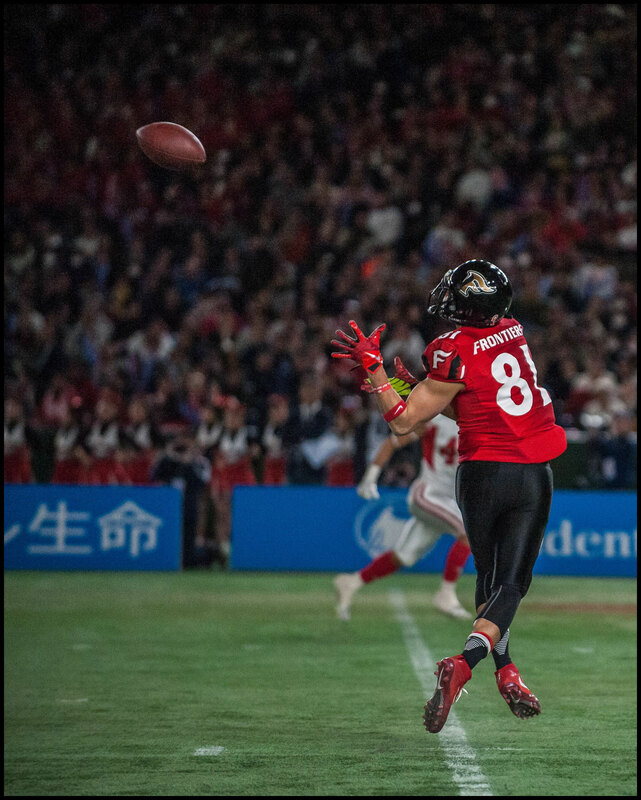 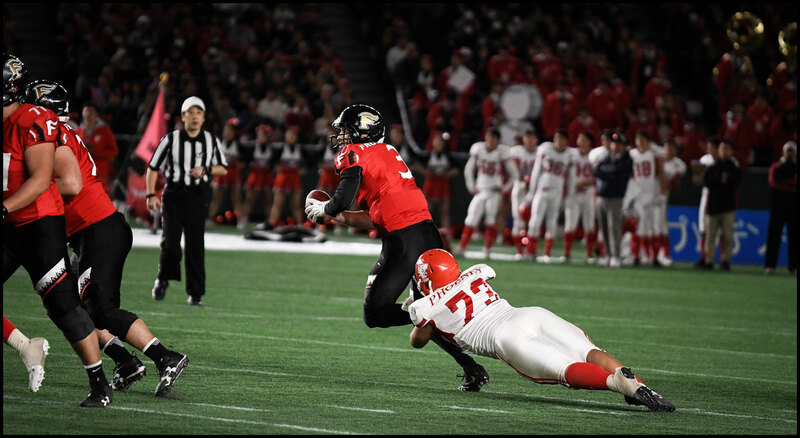 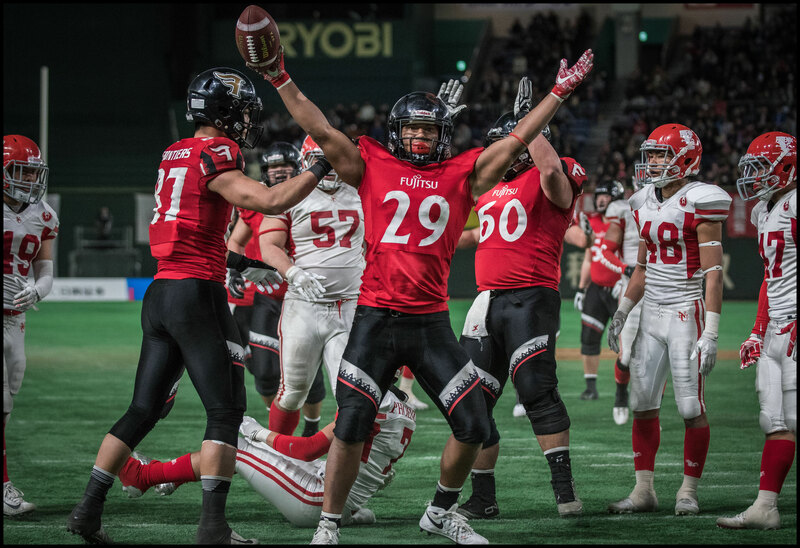 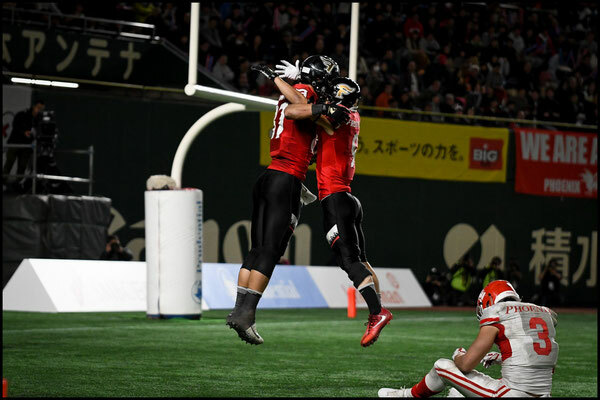 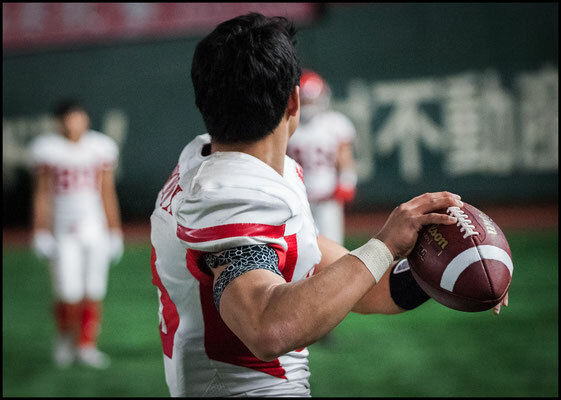 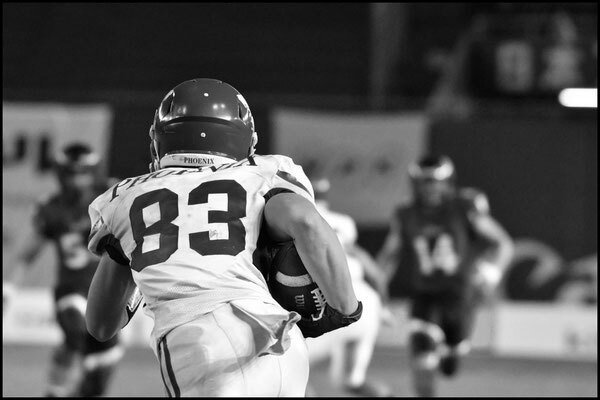 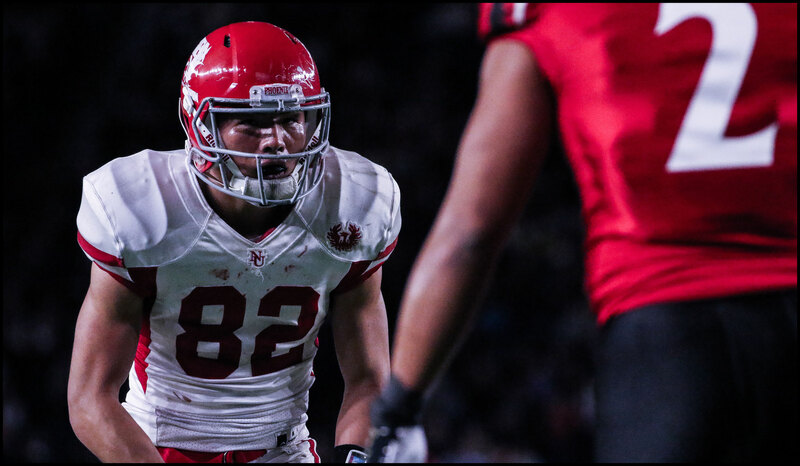 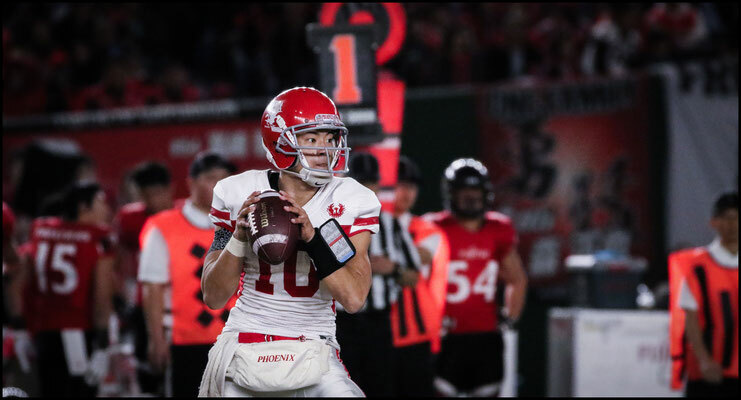 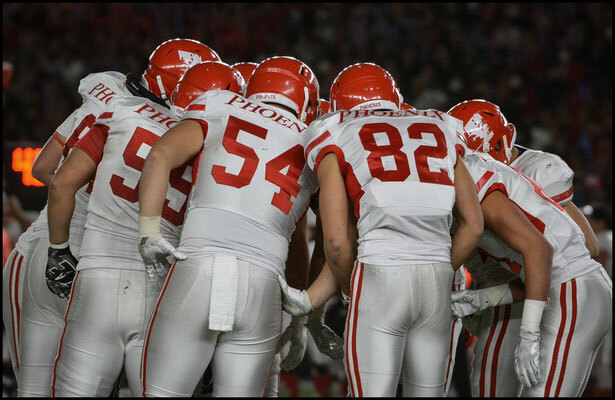 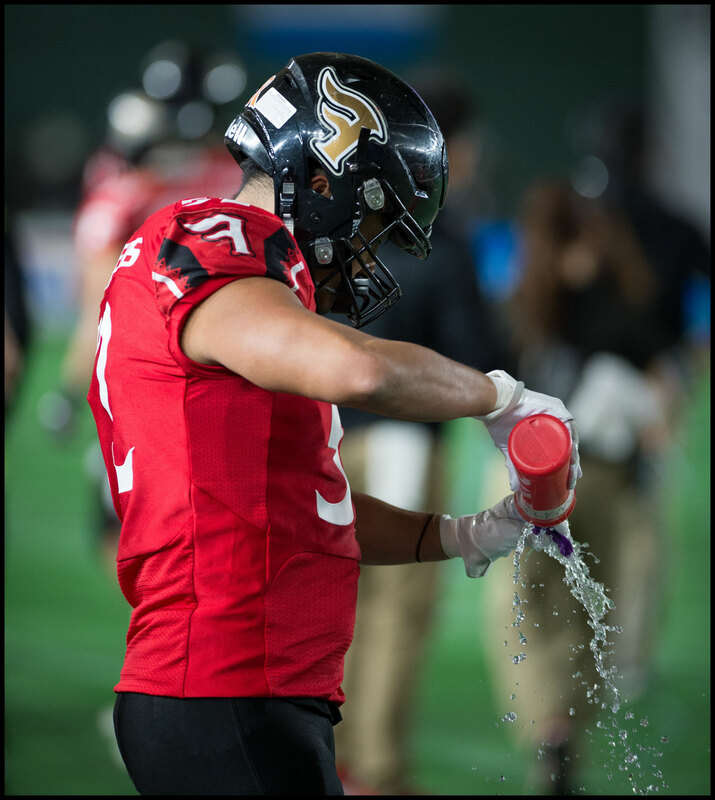 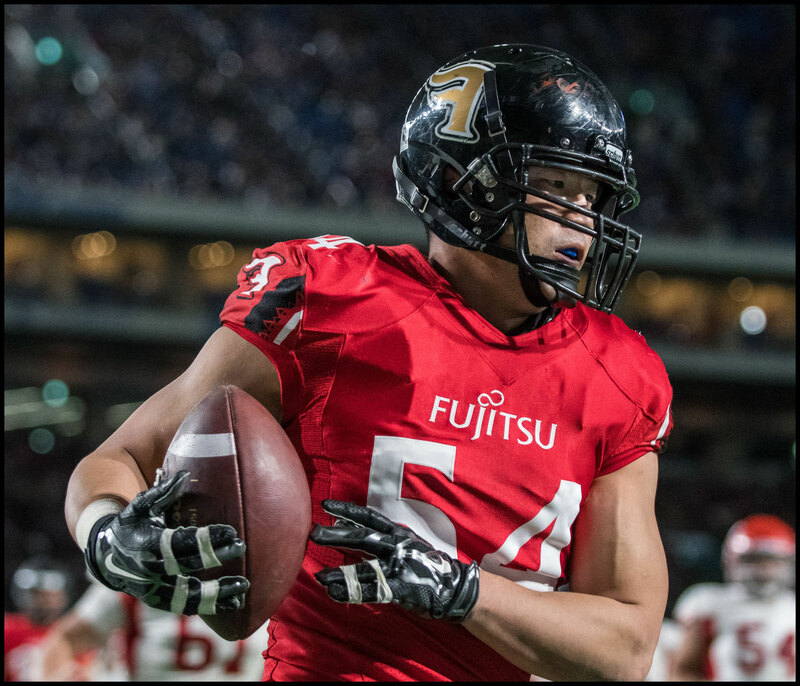 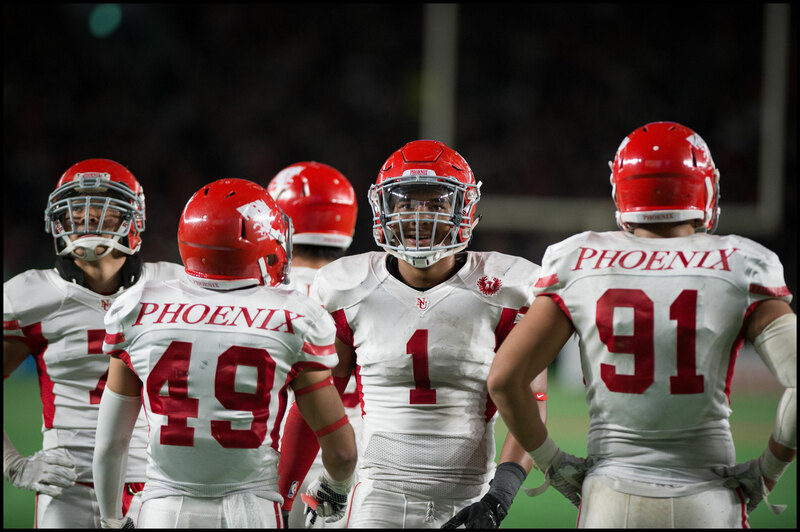 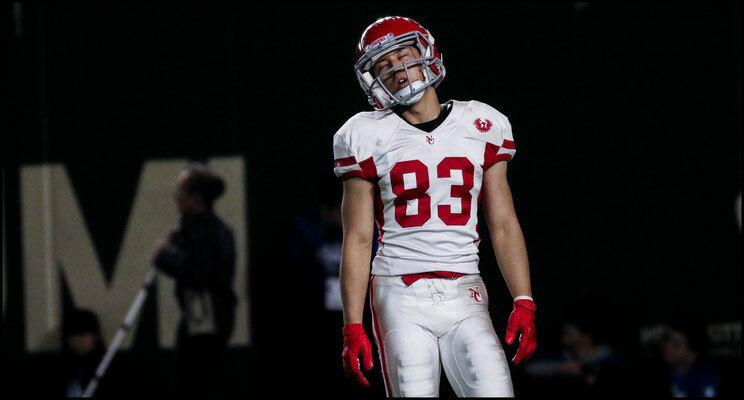 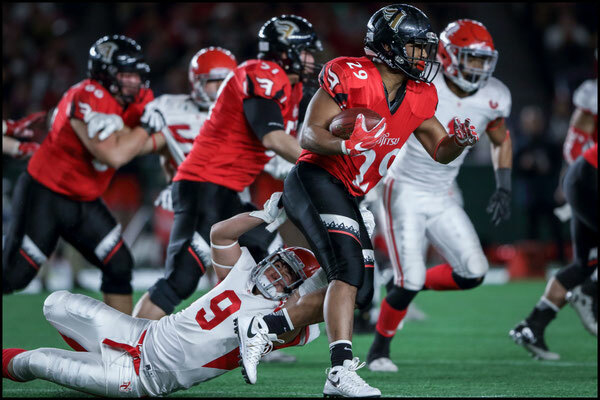 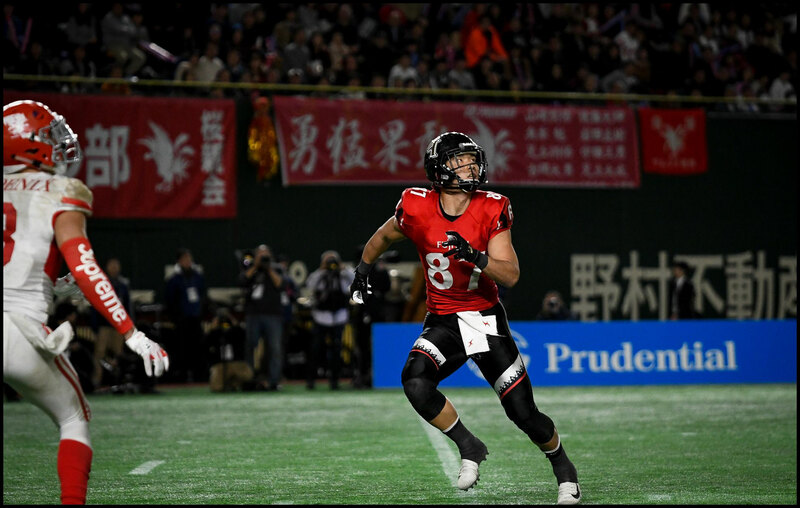 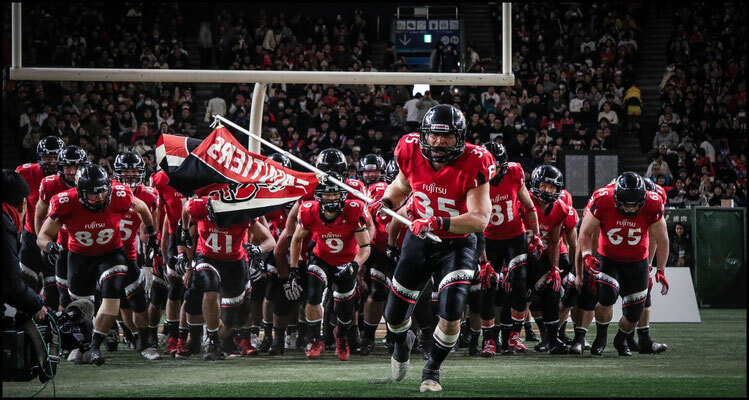 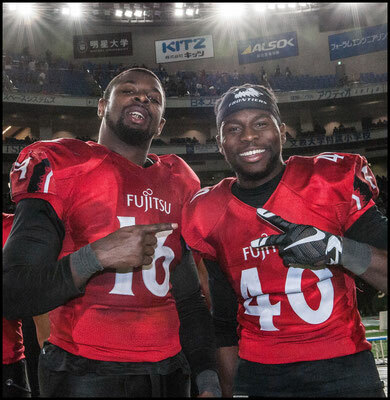 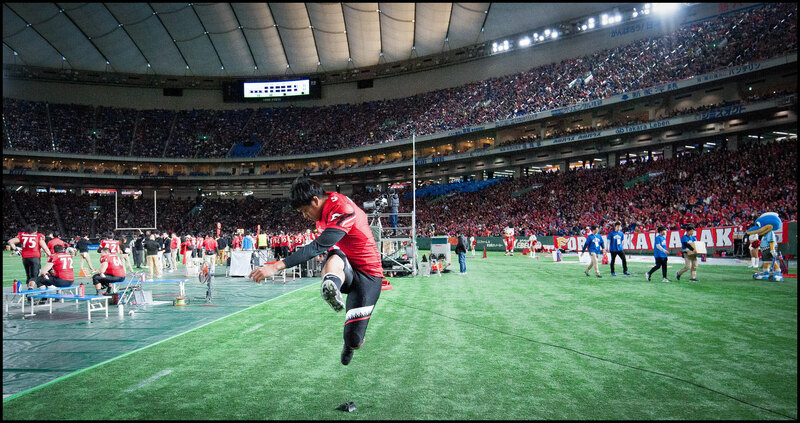 Fujitsu Frontiers retained their national championship with a 39 – 7 defeat of Nihon University Phoenix in the Rice Bowl. 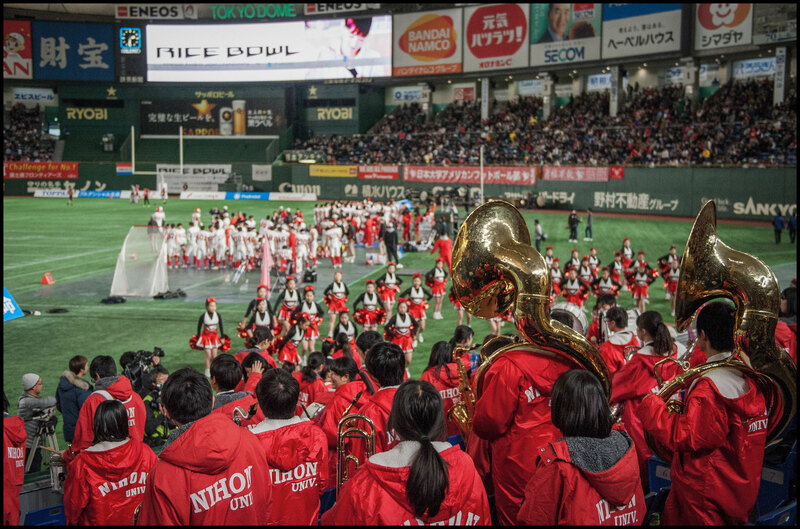 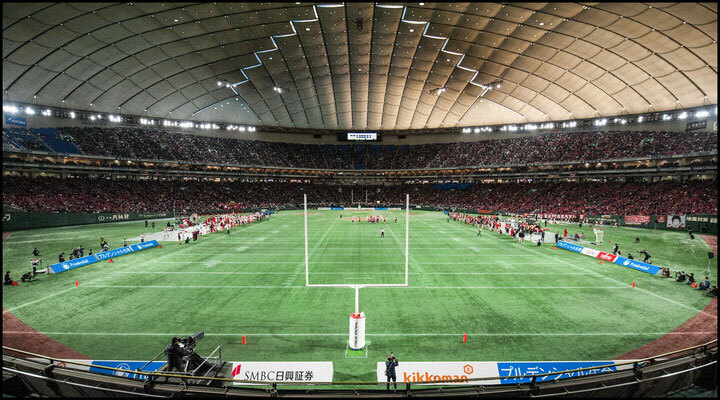 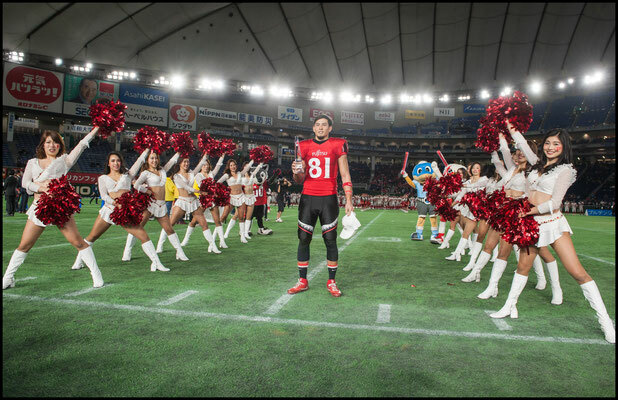 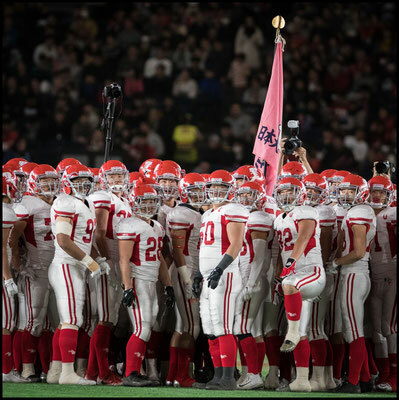 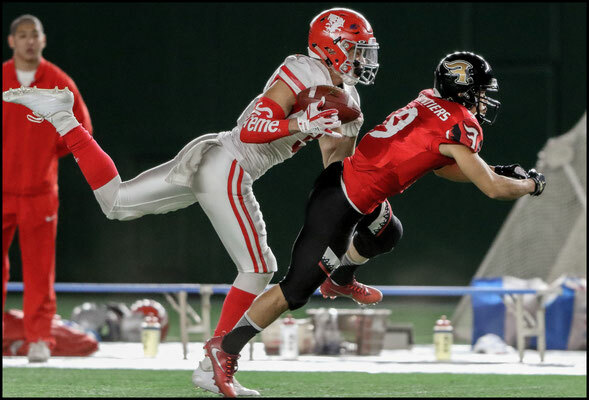 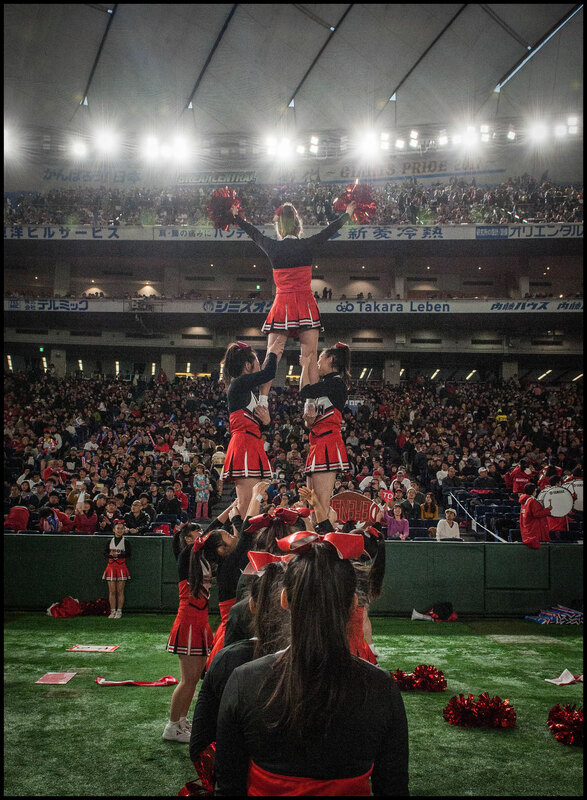 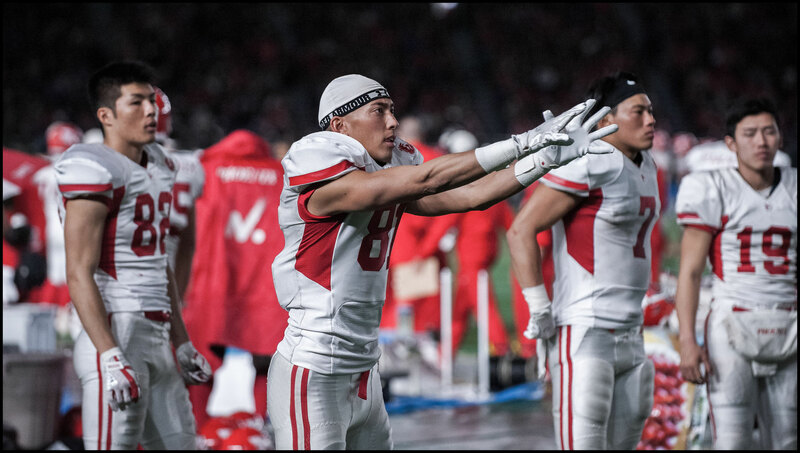 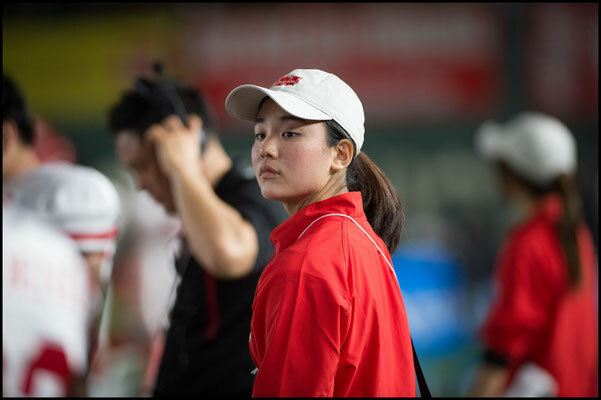 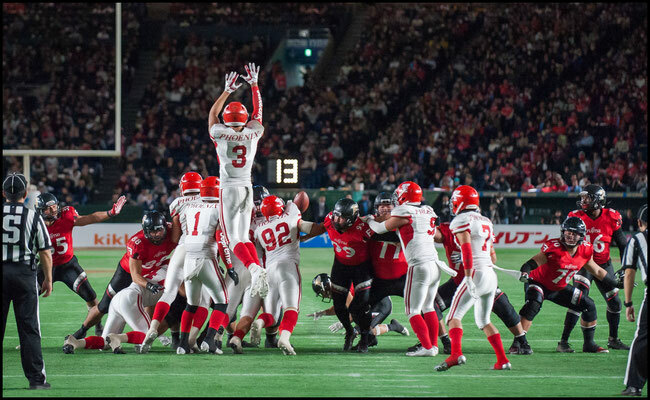 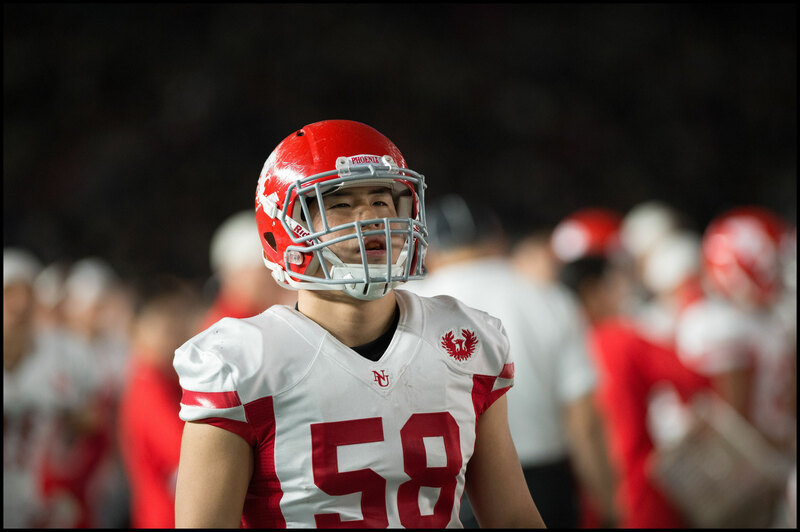 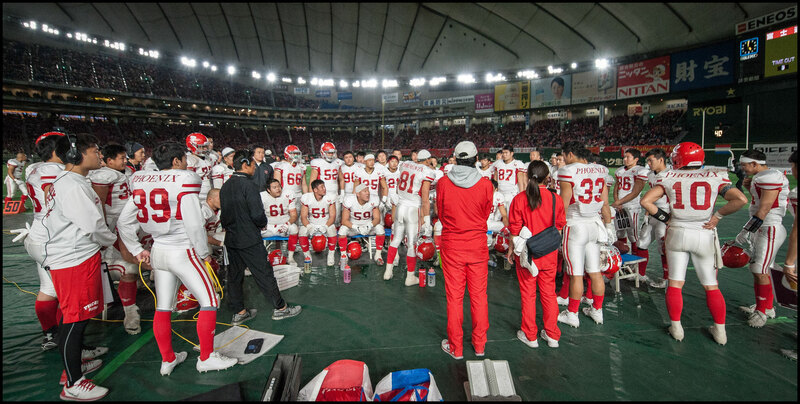 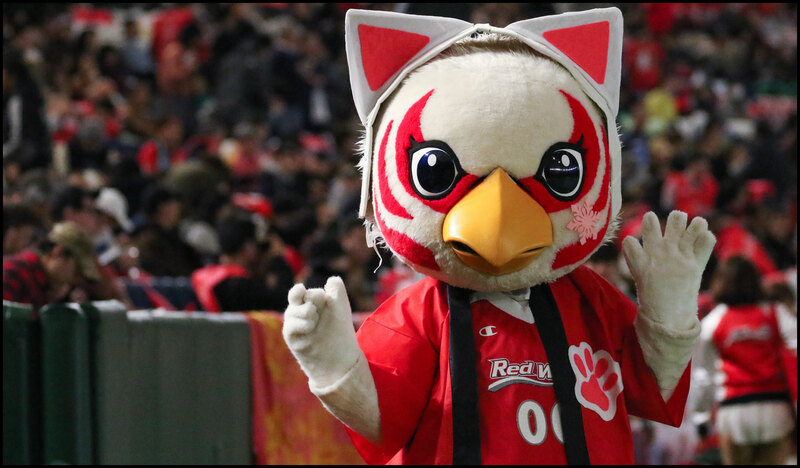 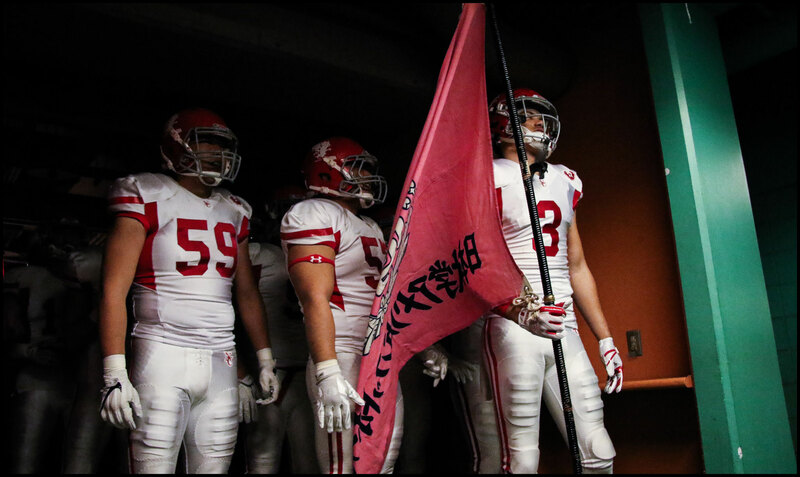 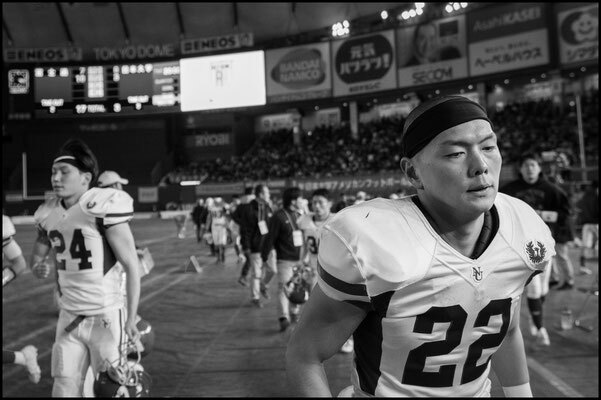 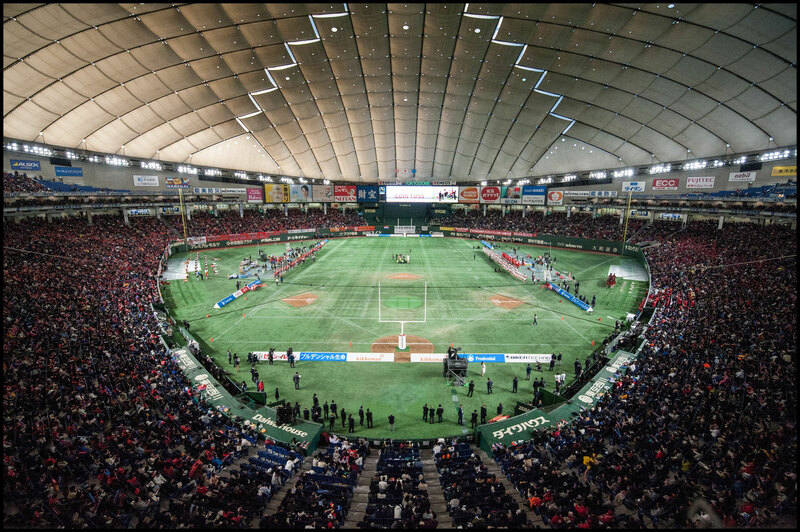 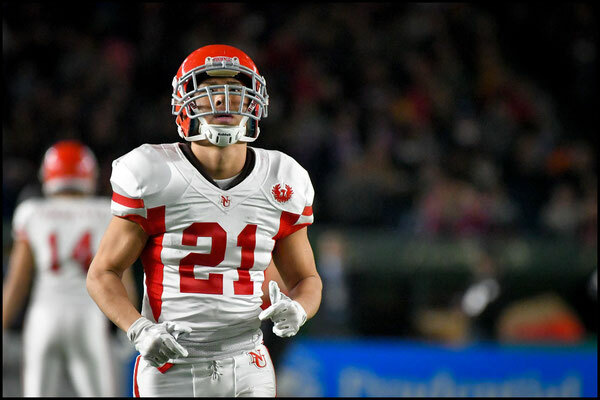 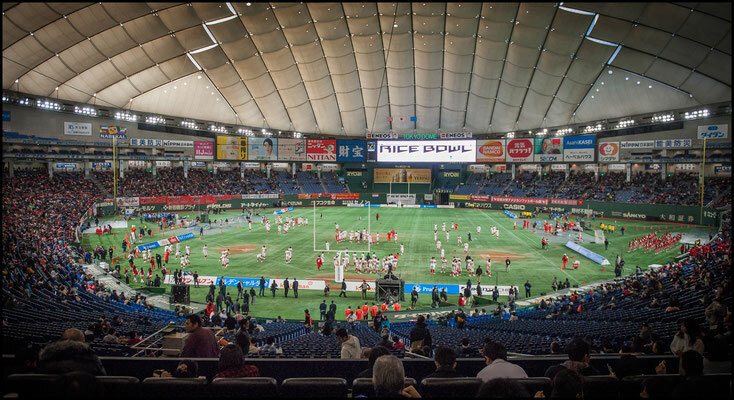 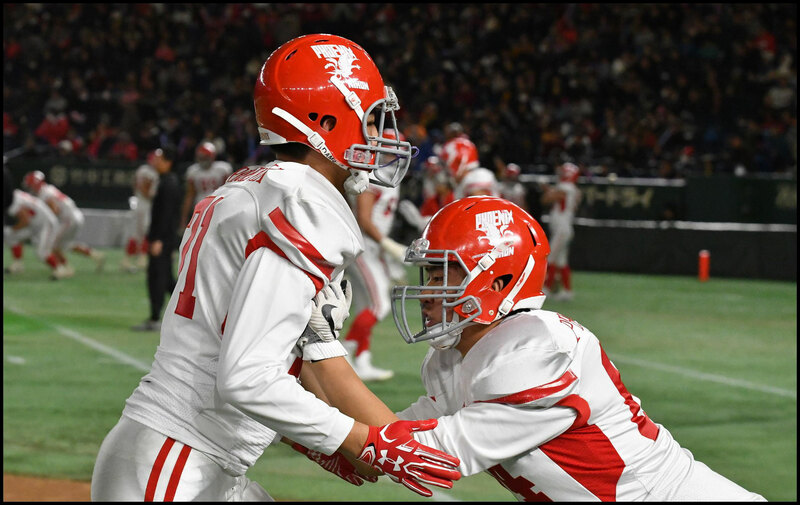 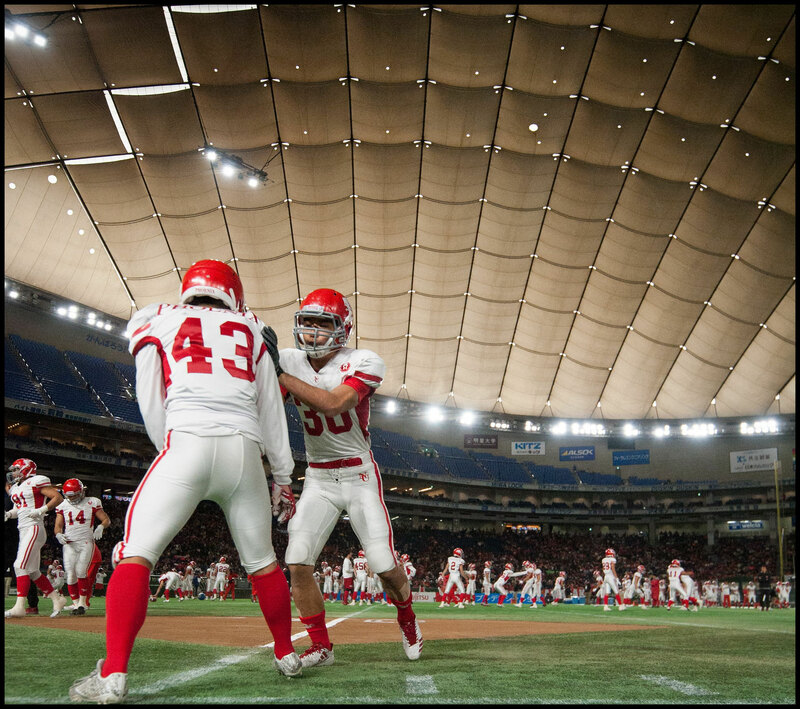 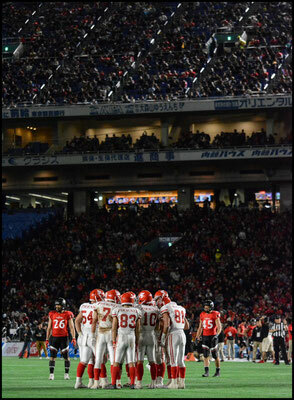 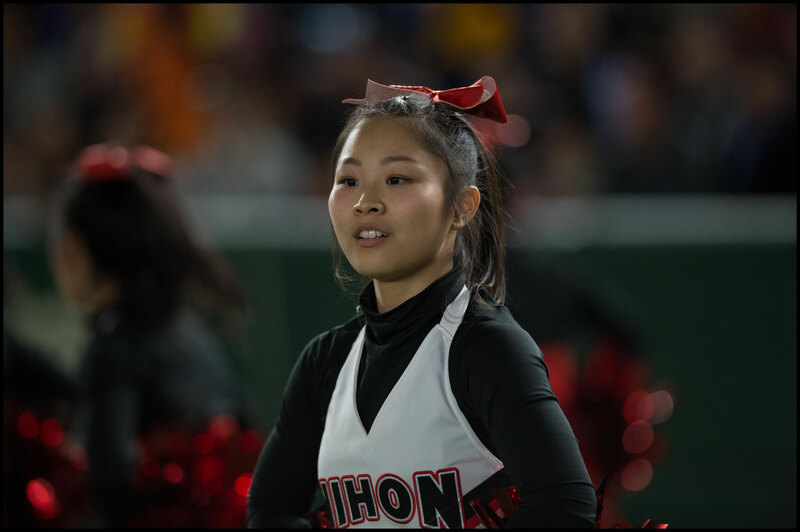 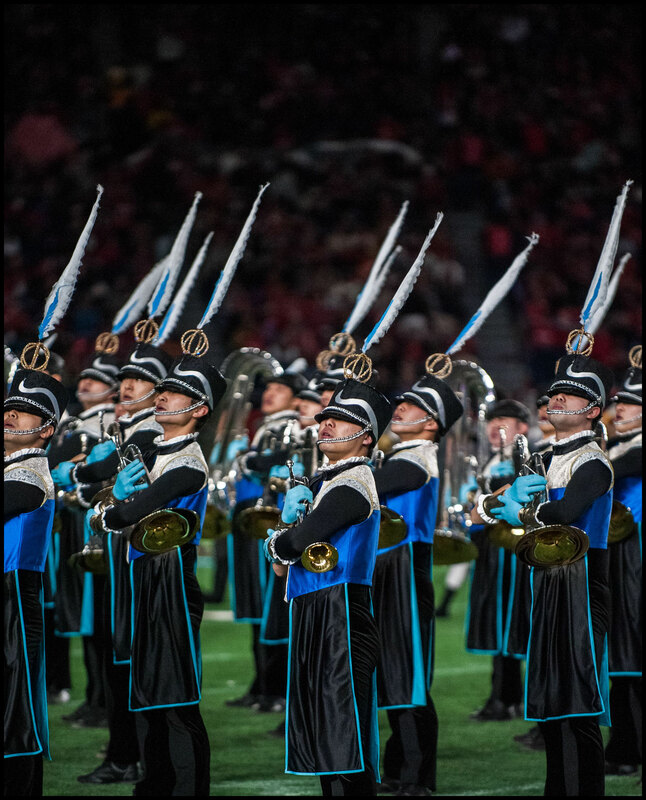 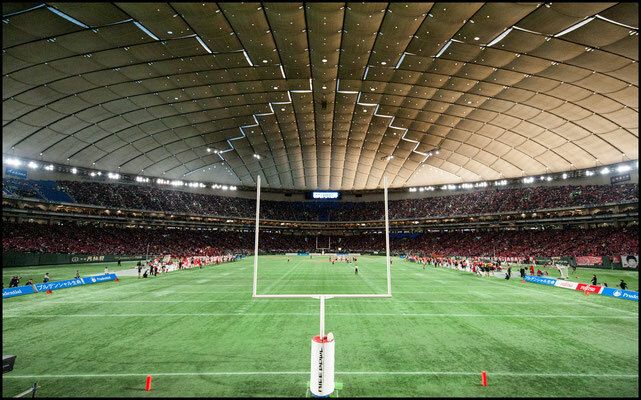 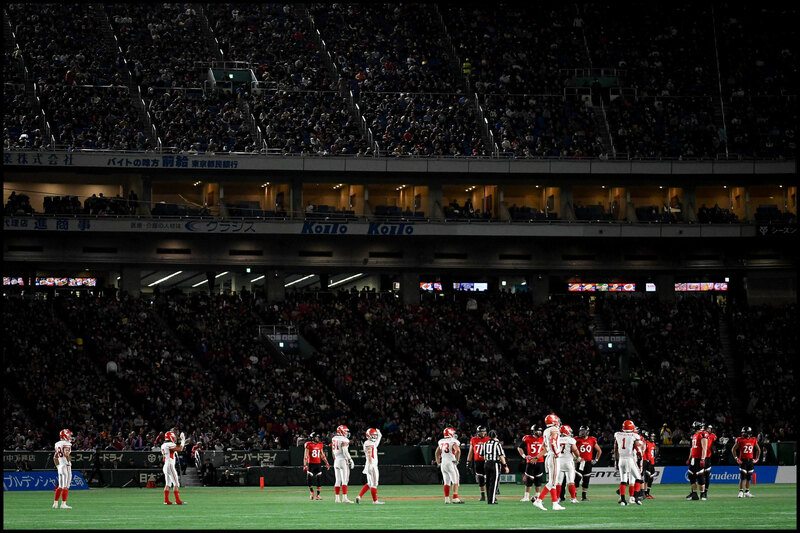 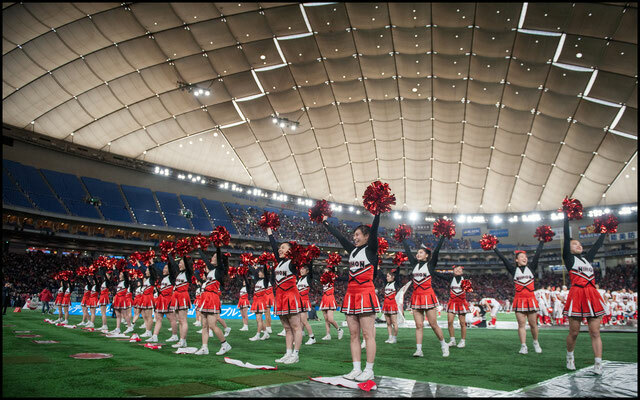 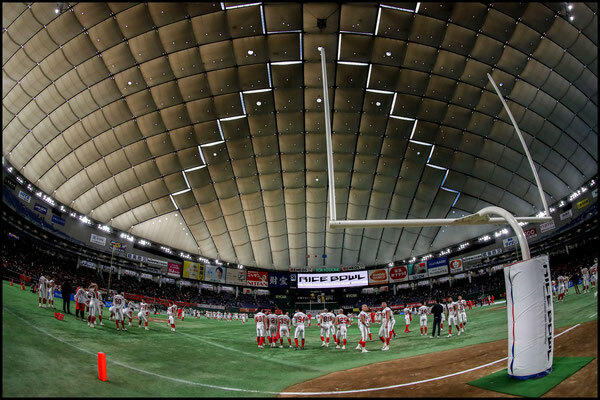 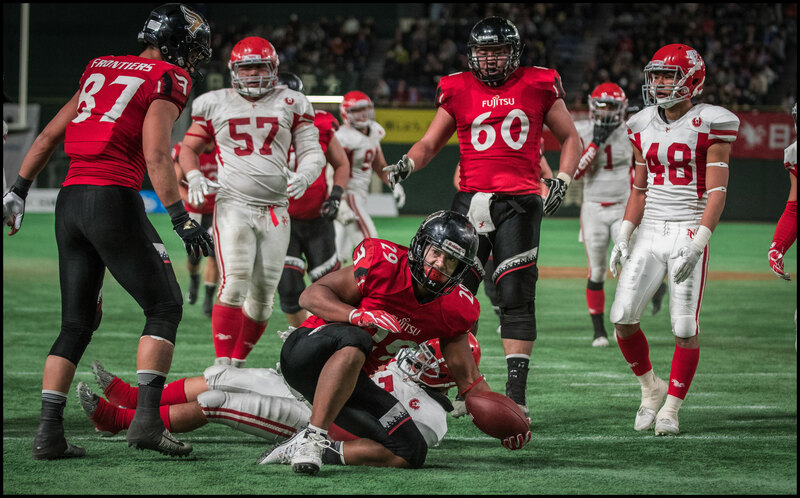 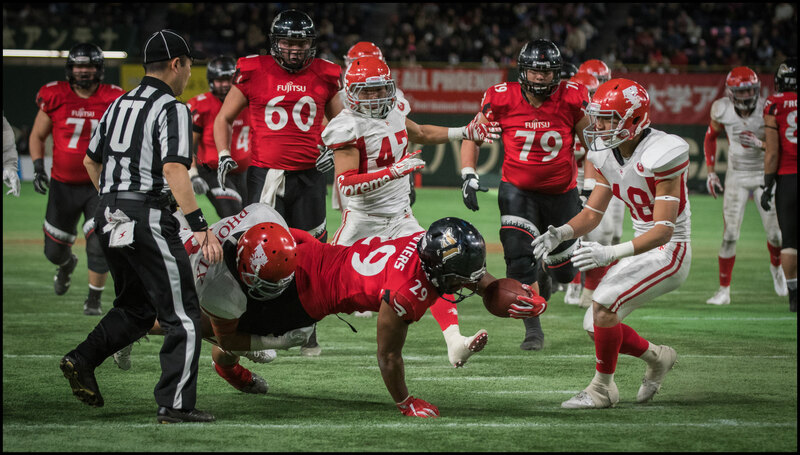 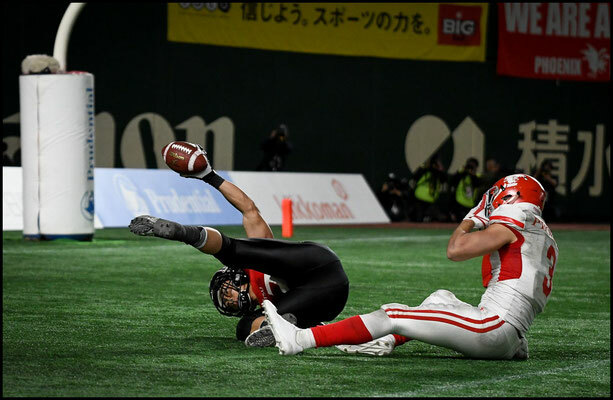 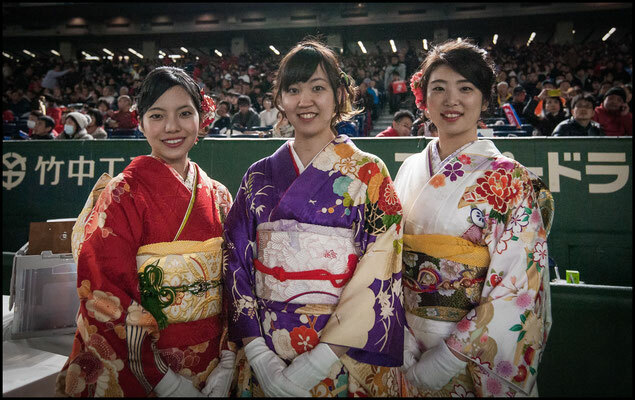 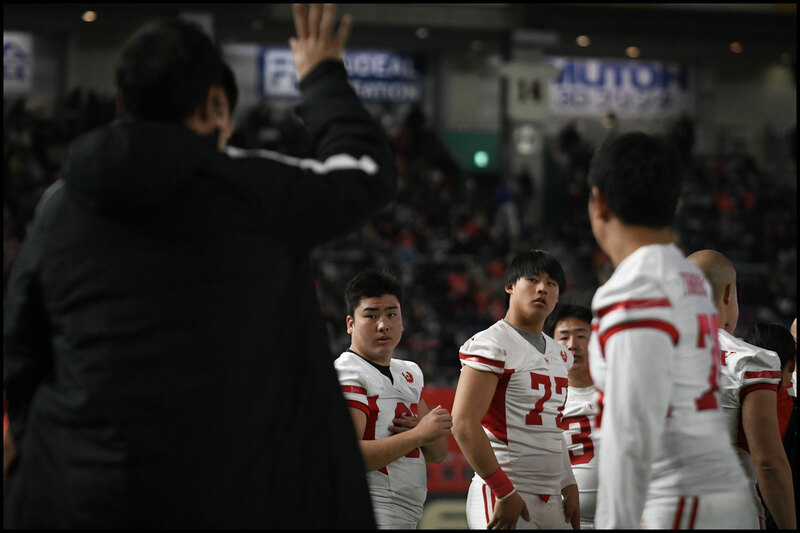 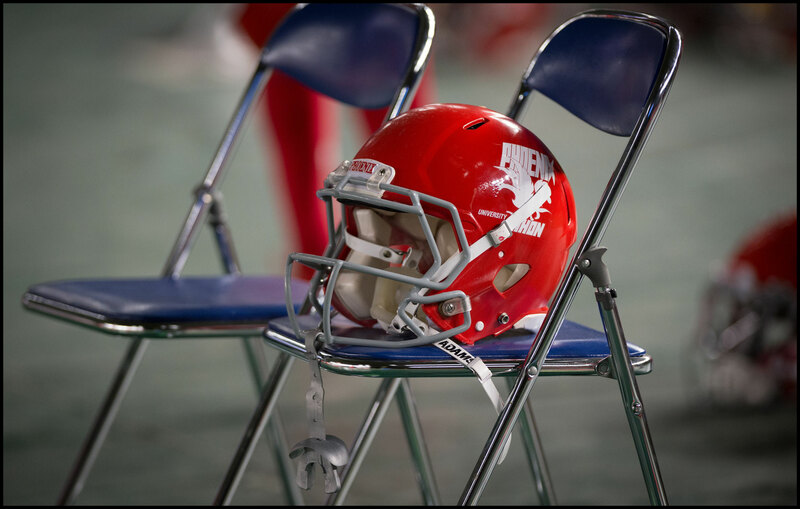 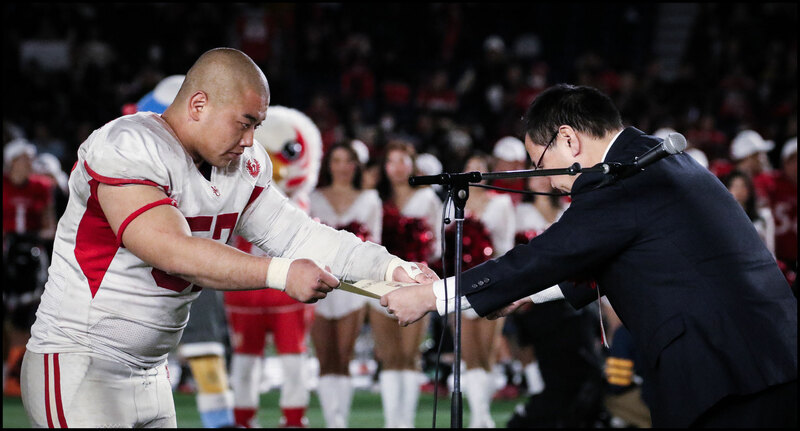 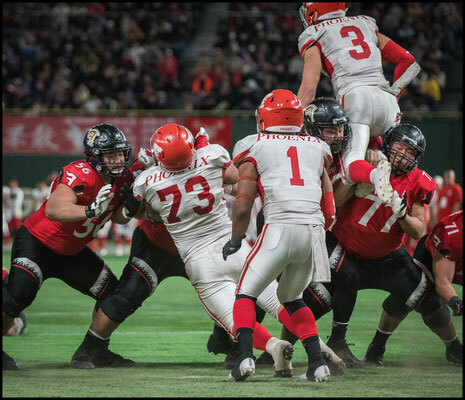 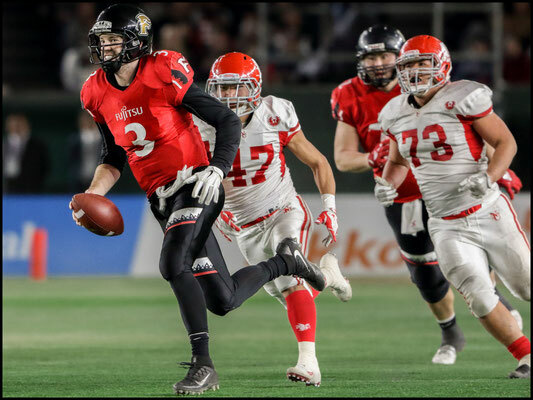 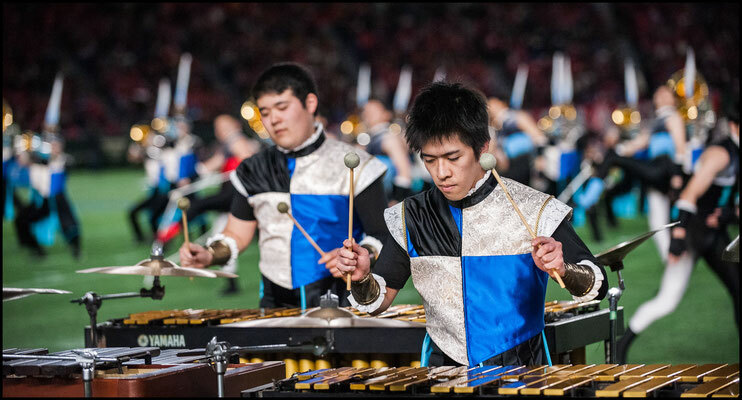 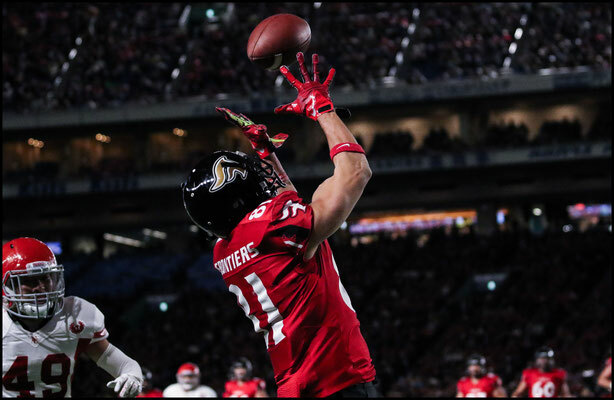 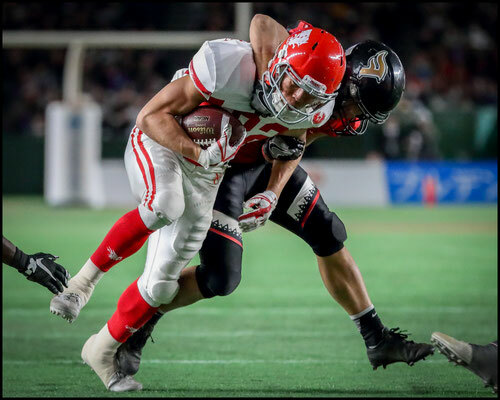 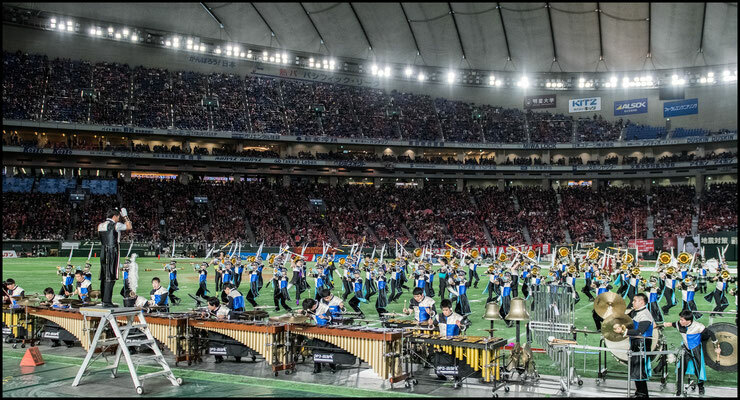 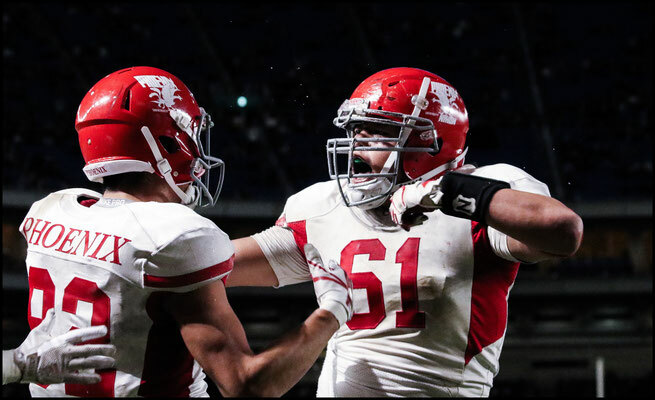 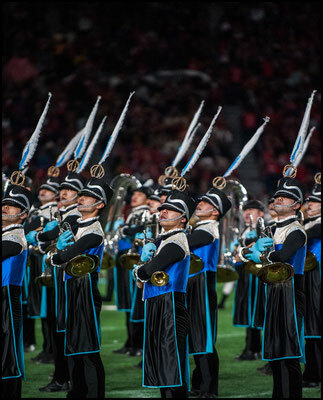 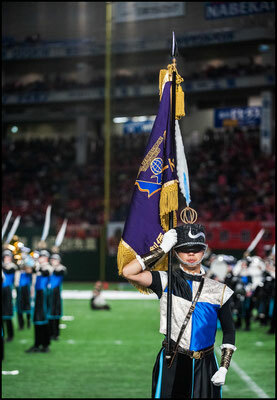 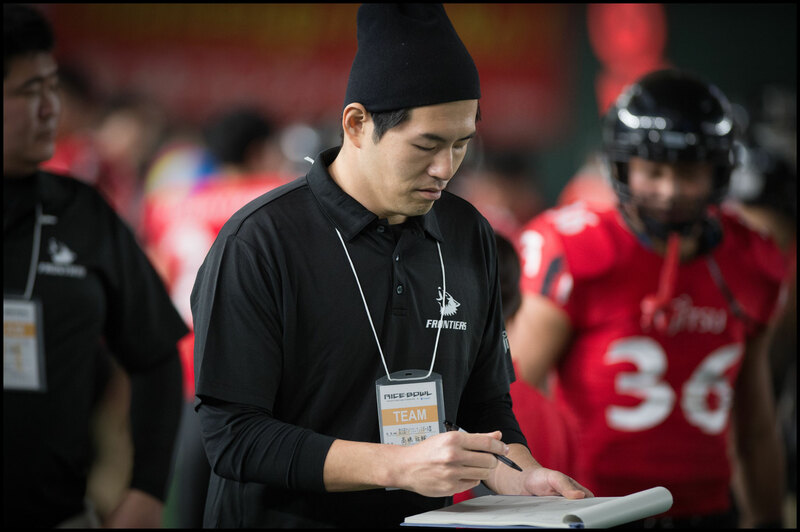 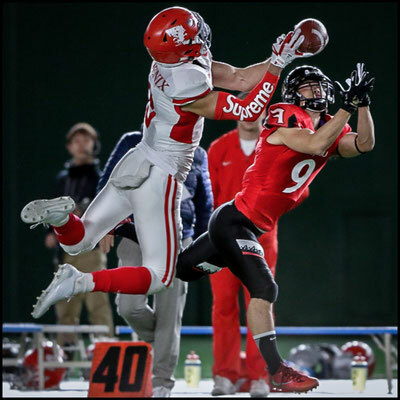 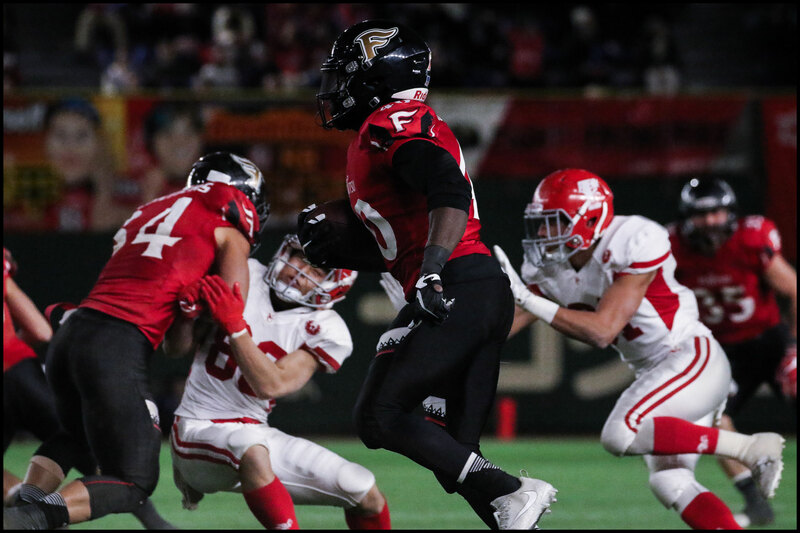 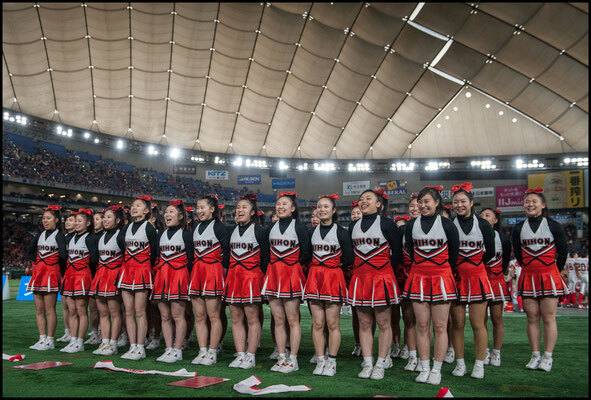 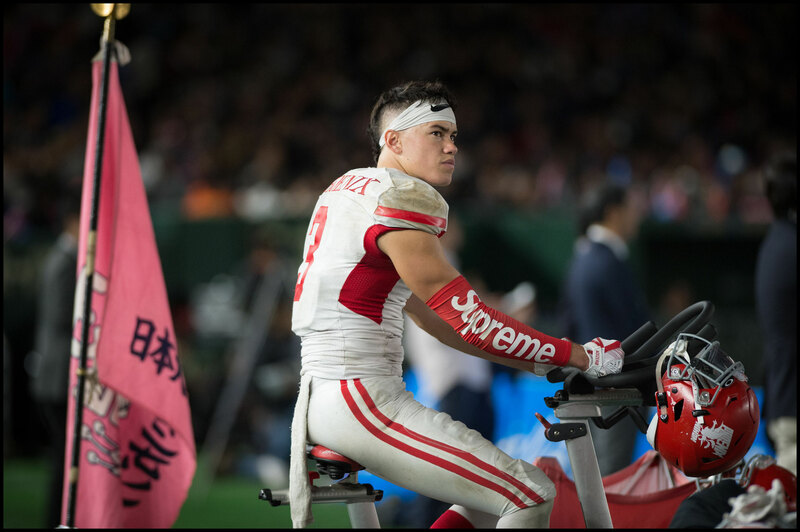 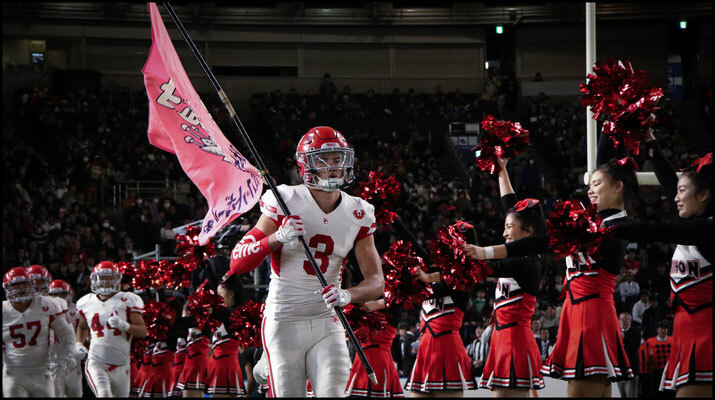 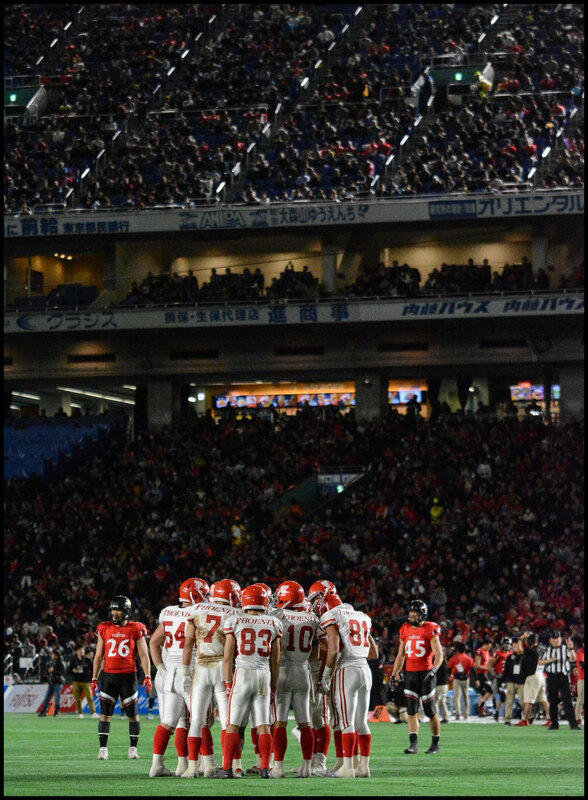 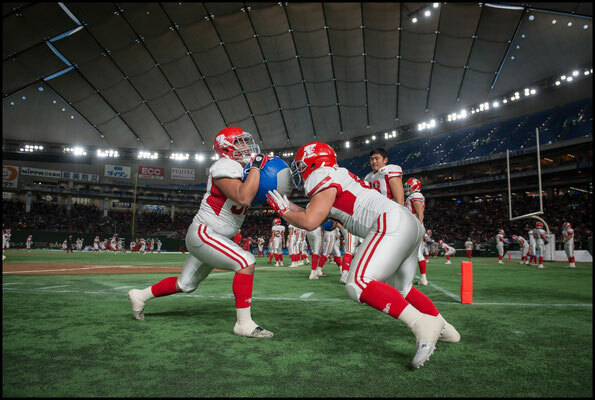 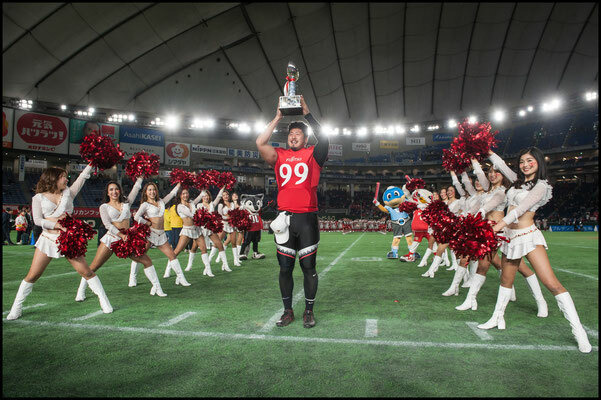 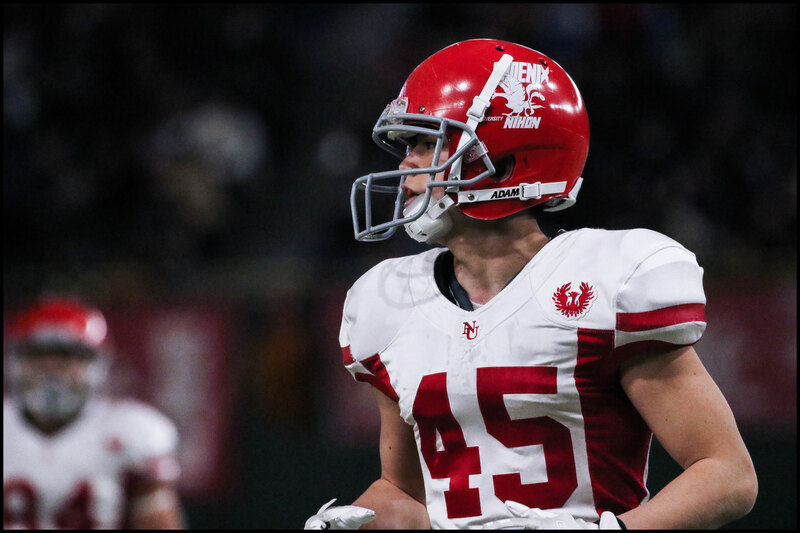 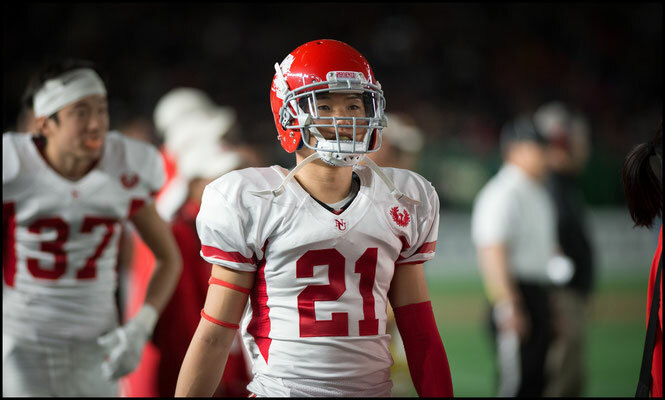 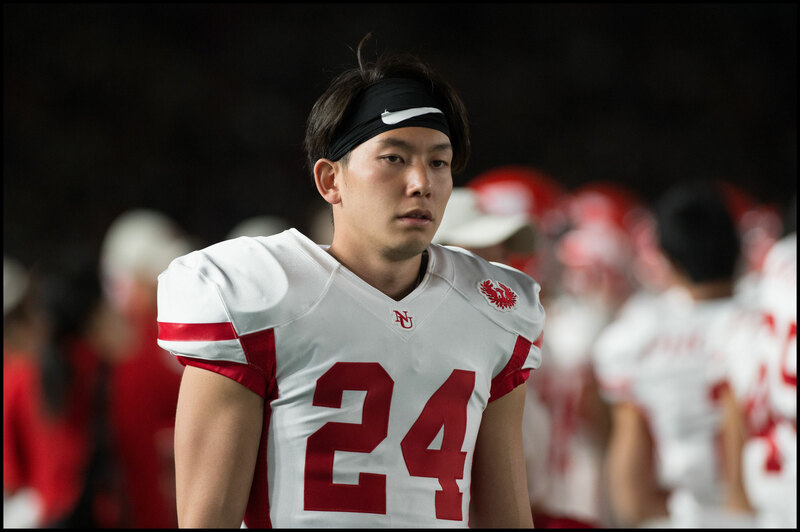 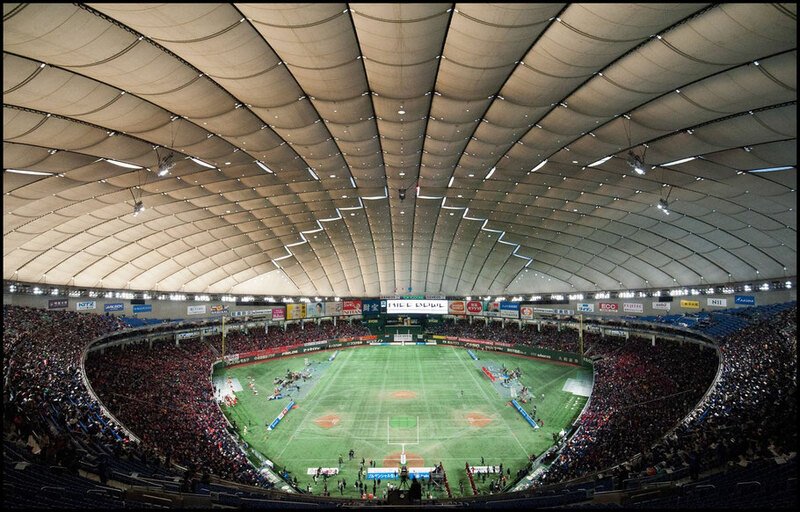 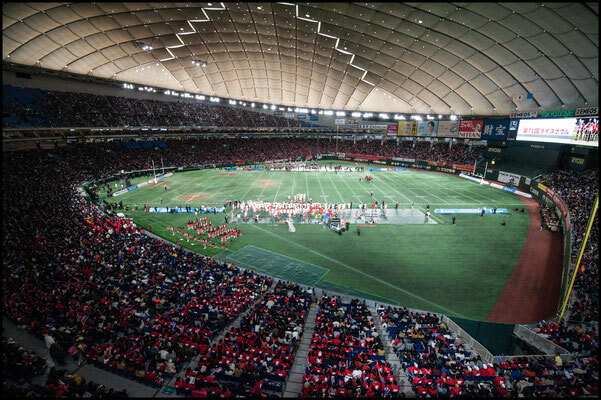 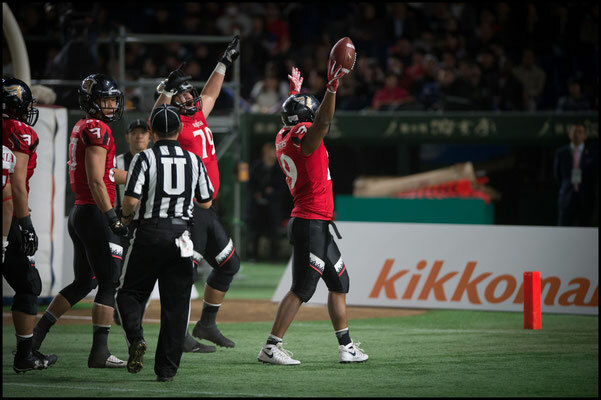 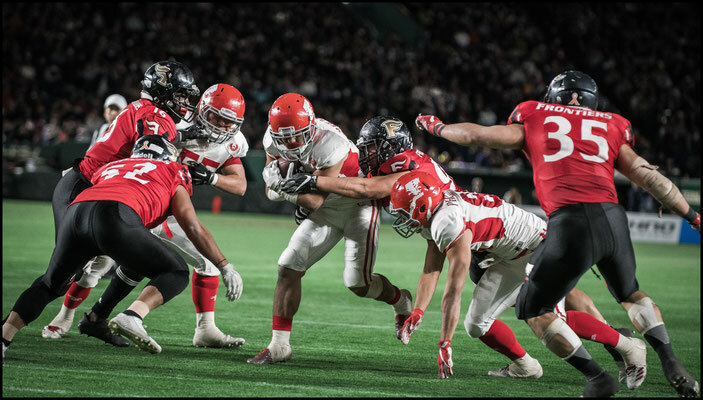 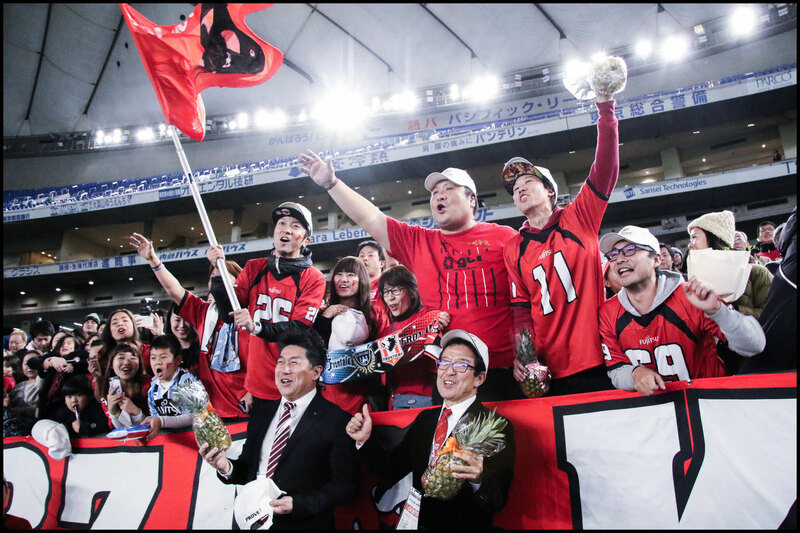 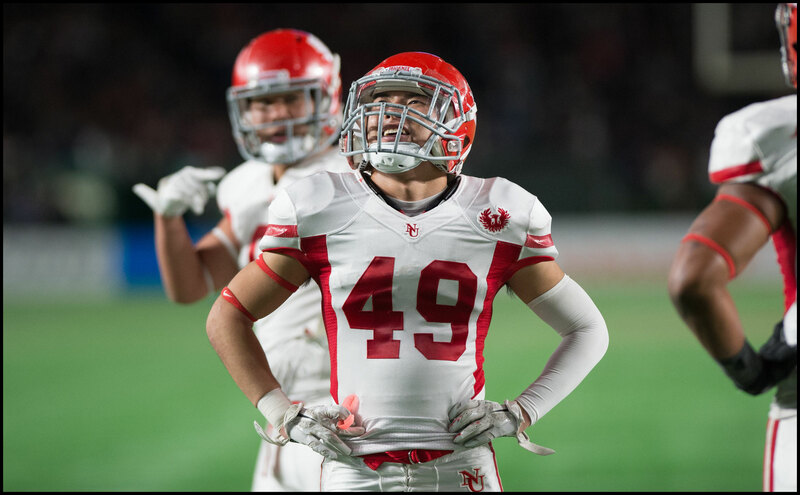 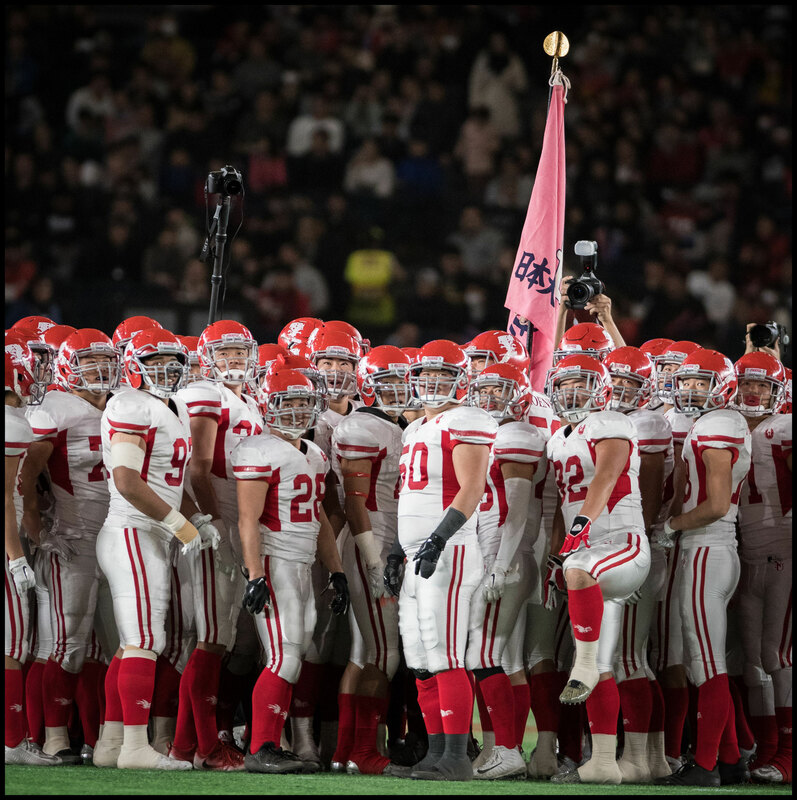 The game held at Tokyo Dome on Jan 3rd saw more than 35,000 people show up to witness the Kanto colligate powerhouse’s first appearance in the title game in 27 years. The students gave a good account of themselves, going toe-to-toe with the champions for long stretches. 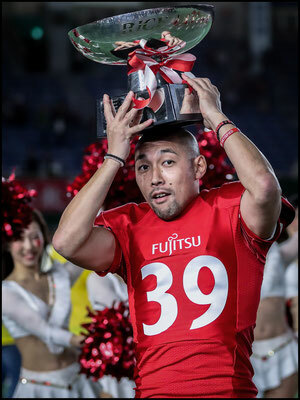 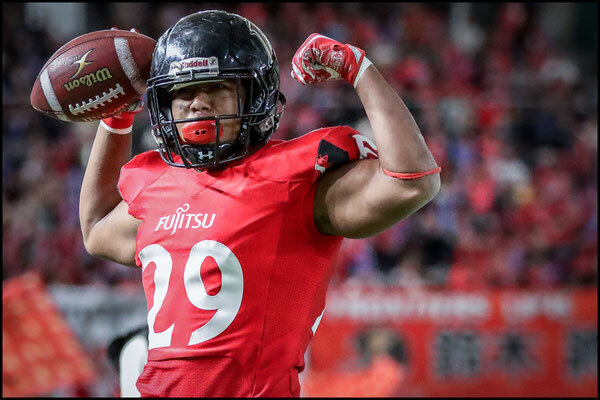 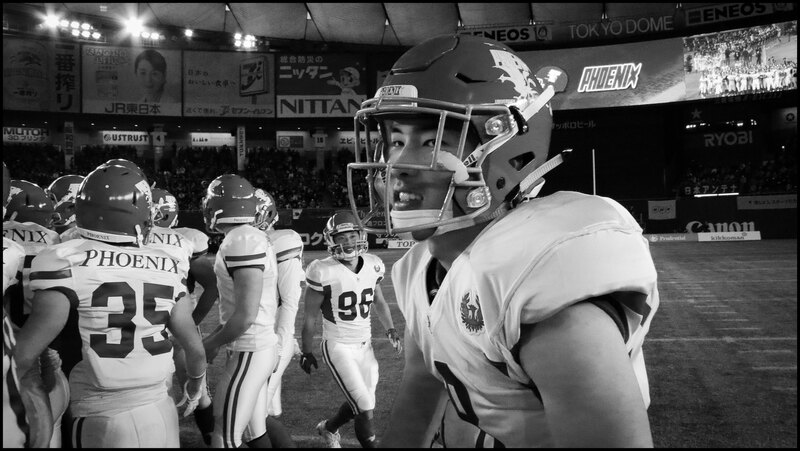 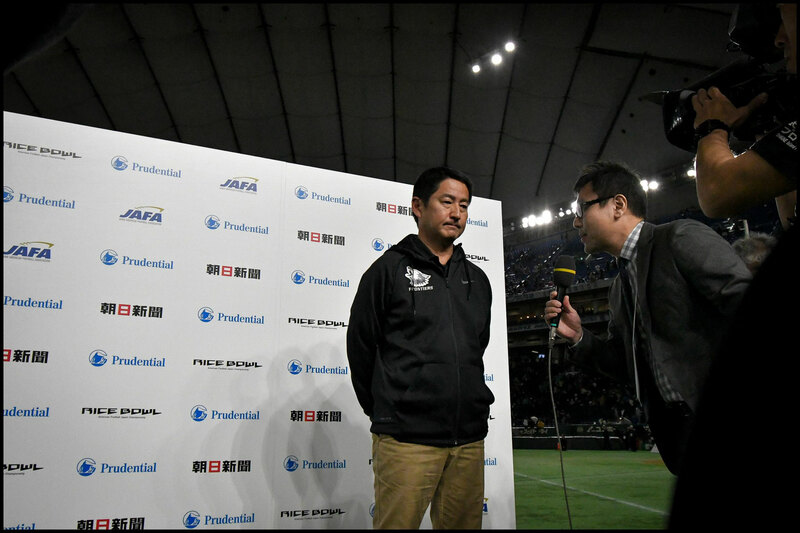 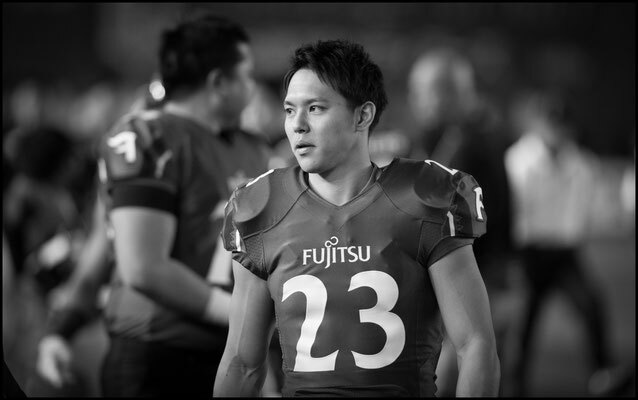 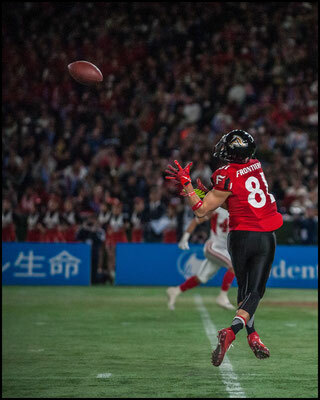 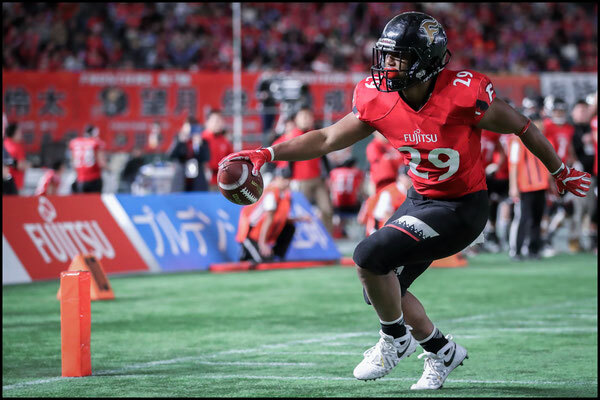 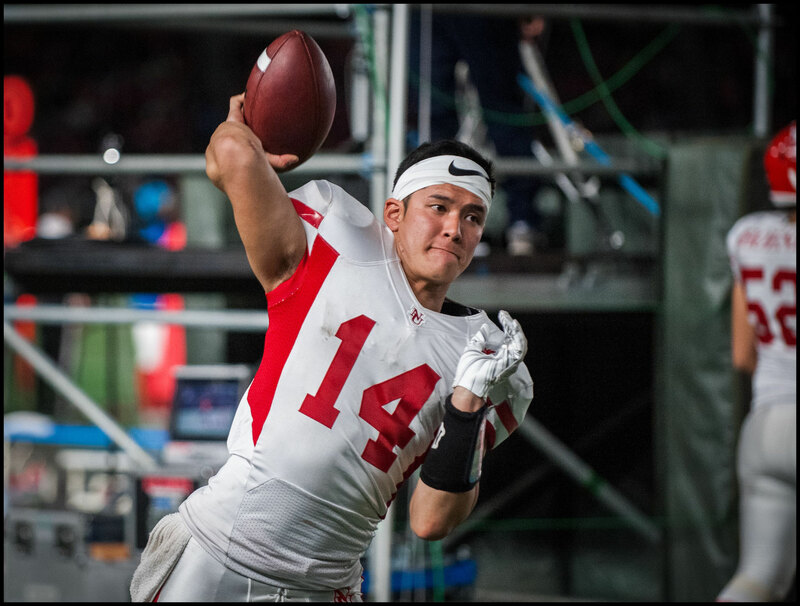 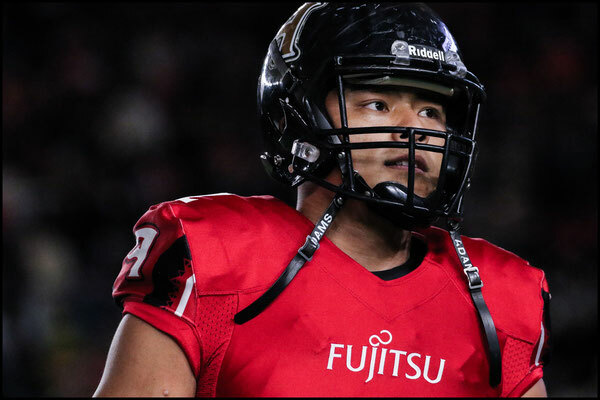 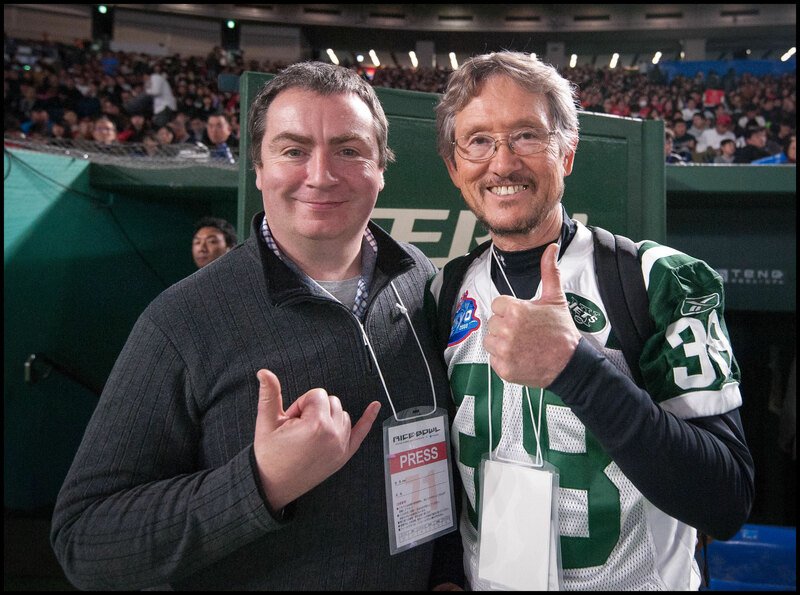 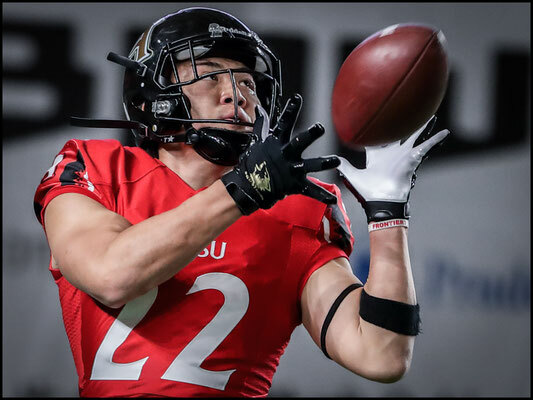 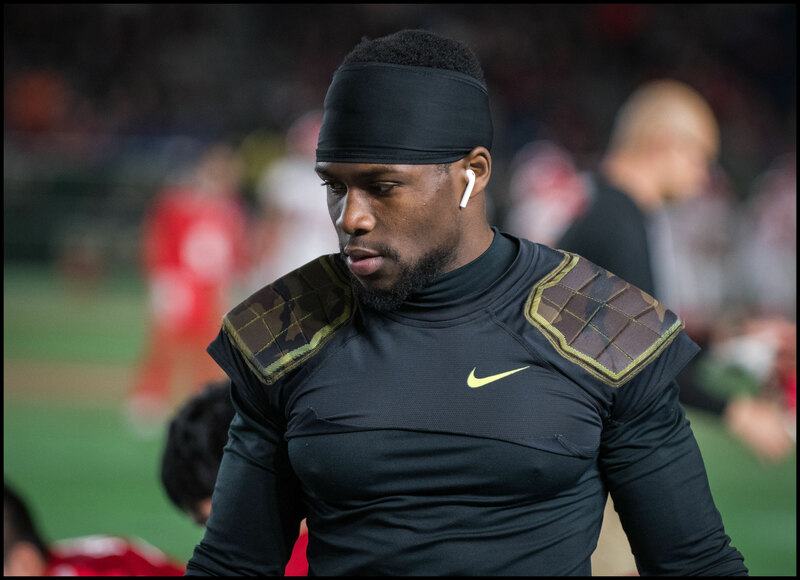 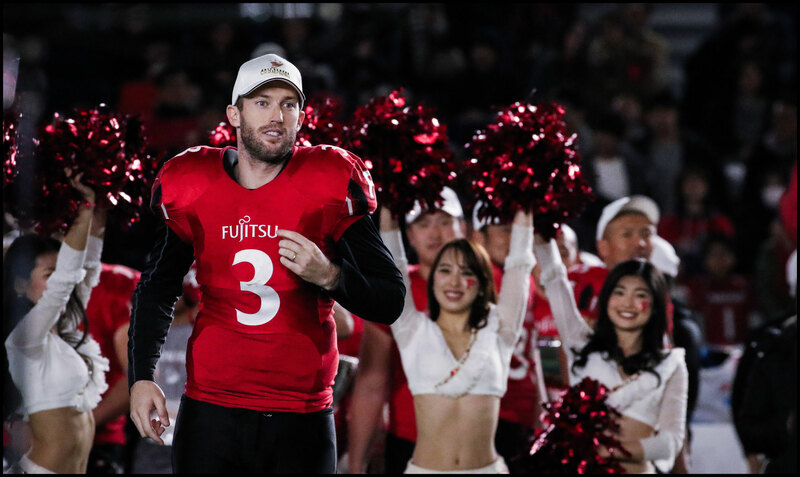 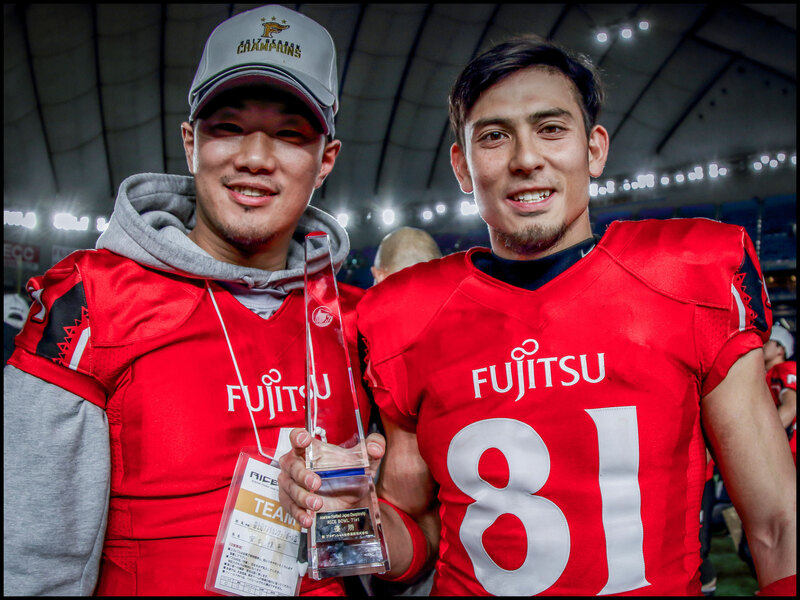 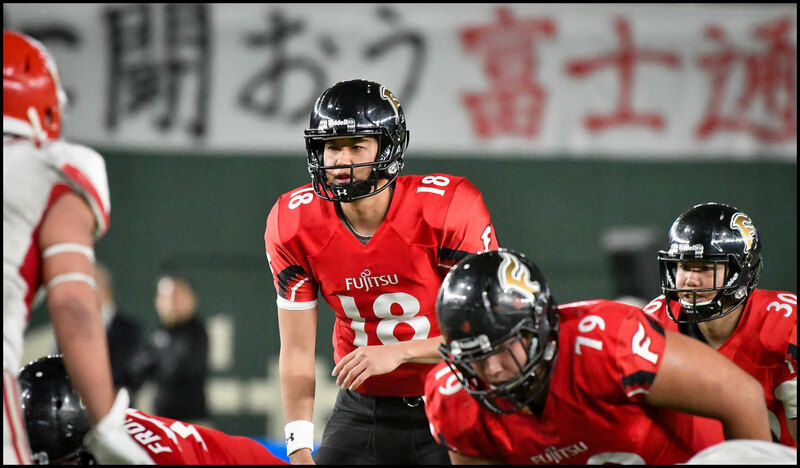 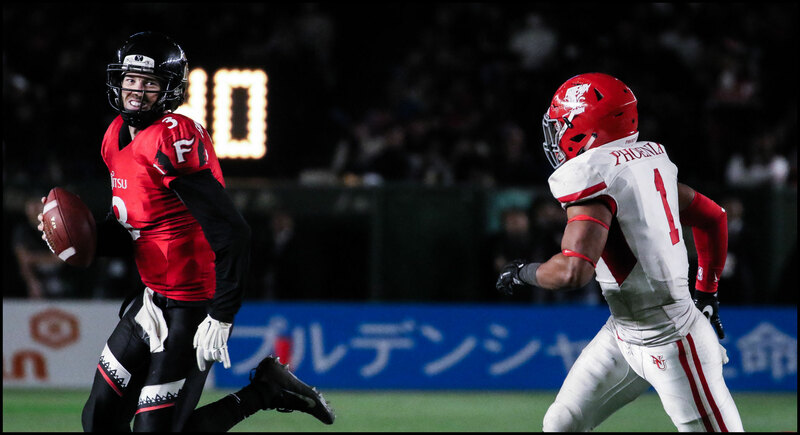 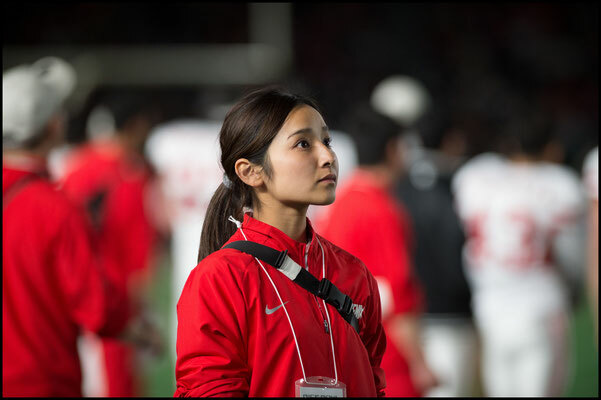 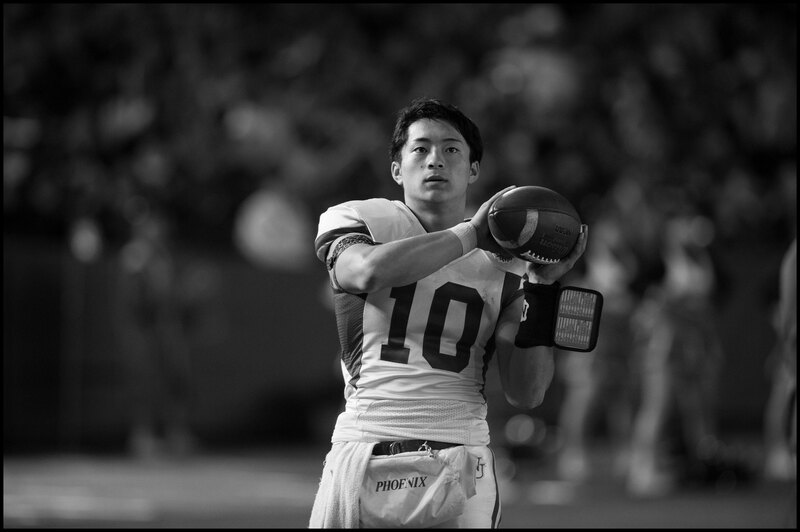 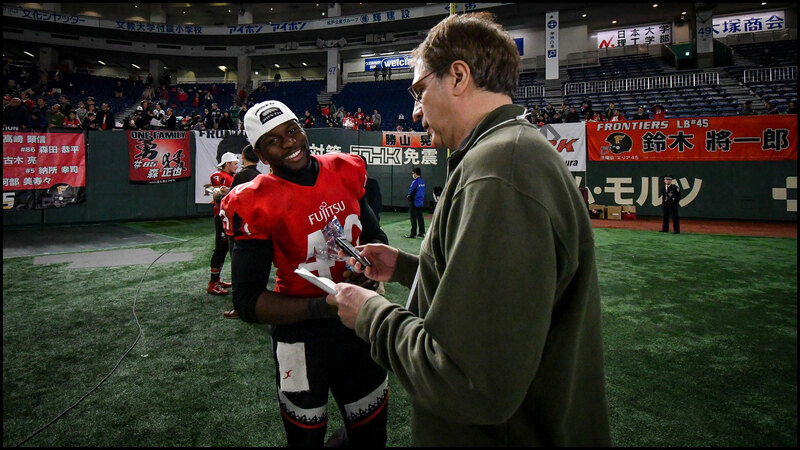 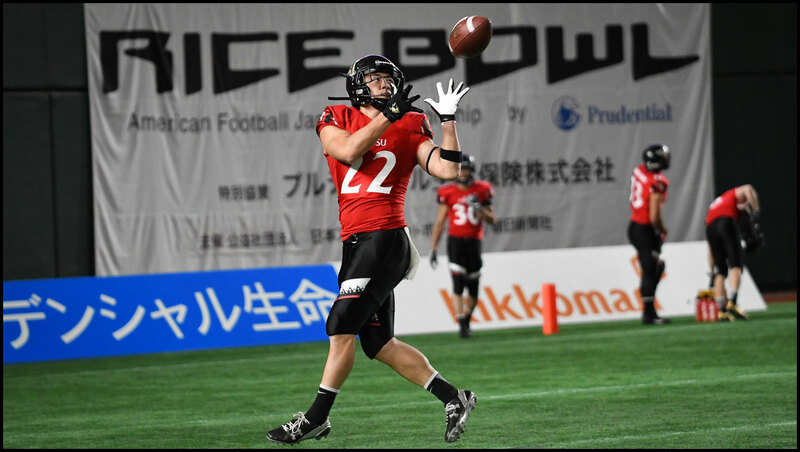 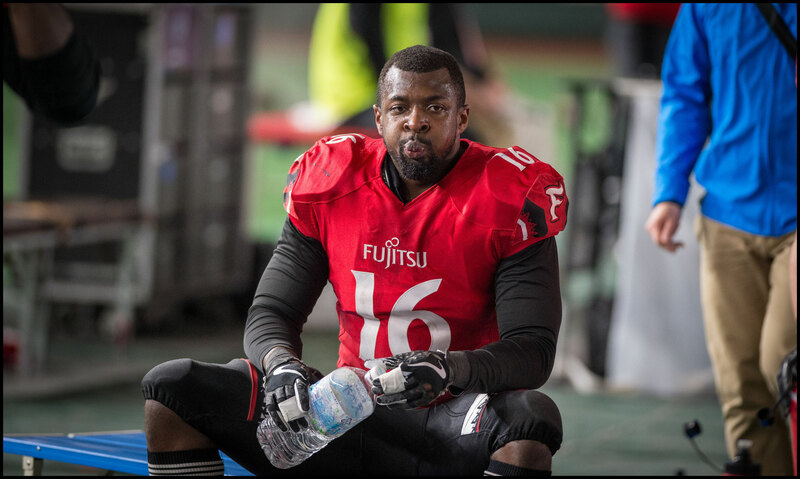 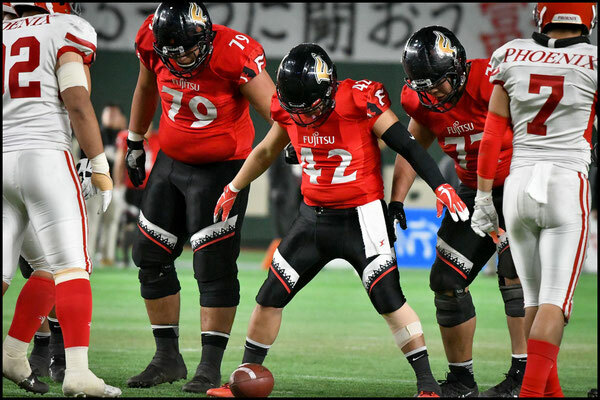 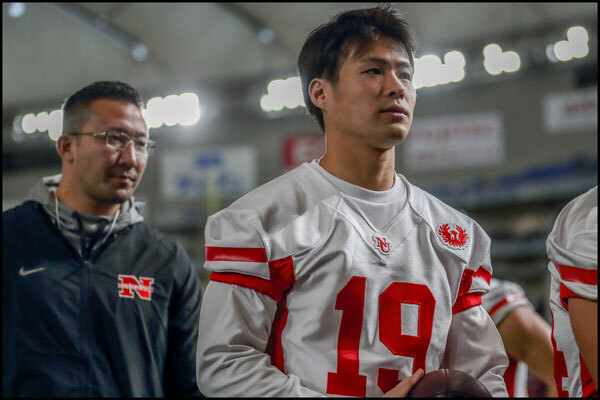 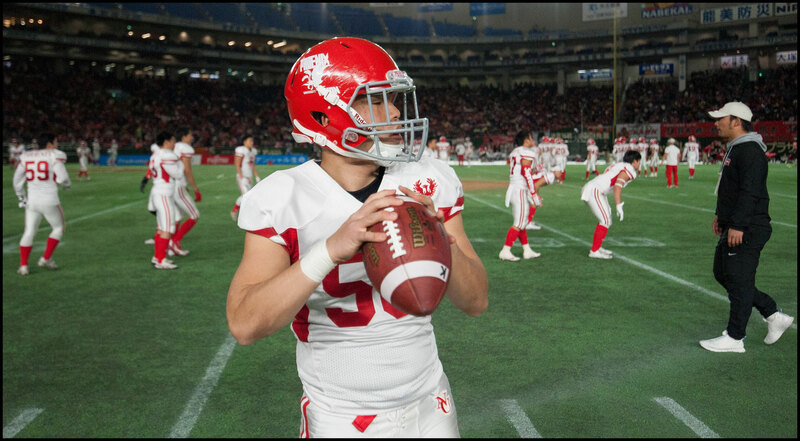 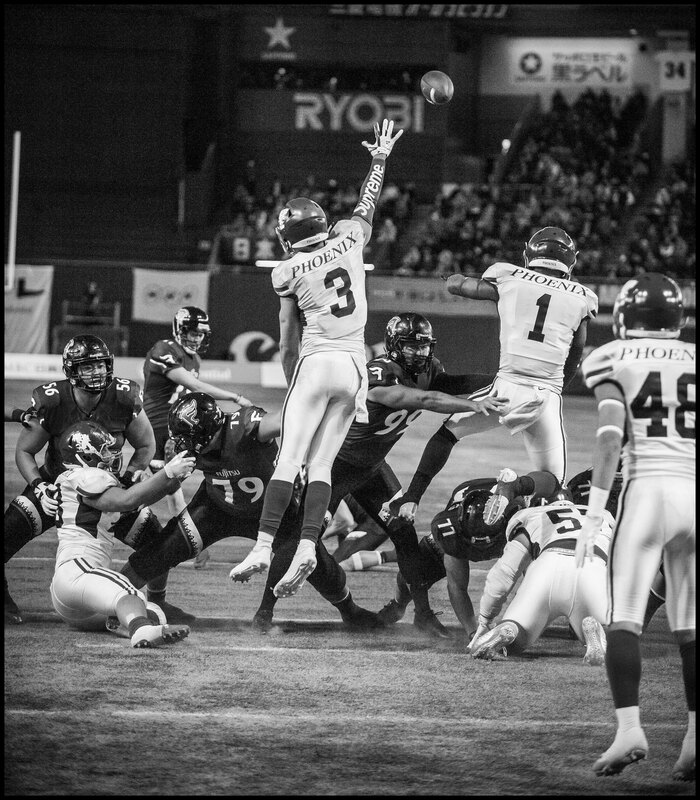 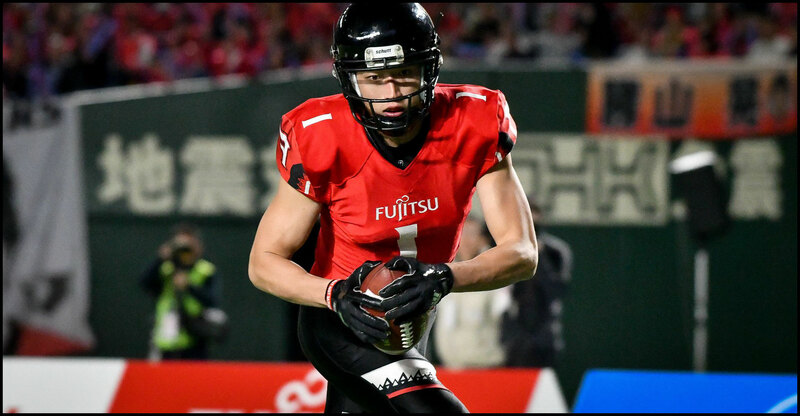 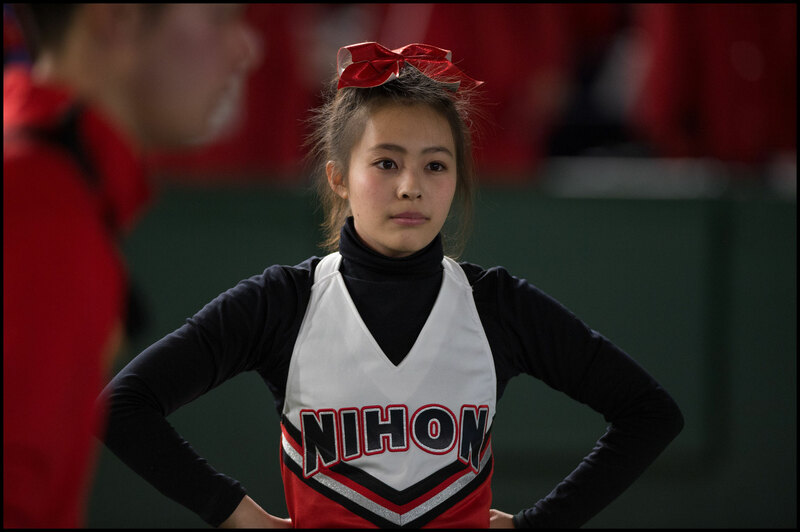 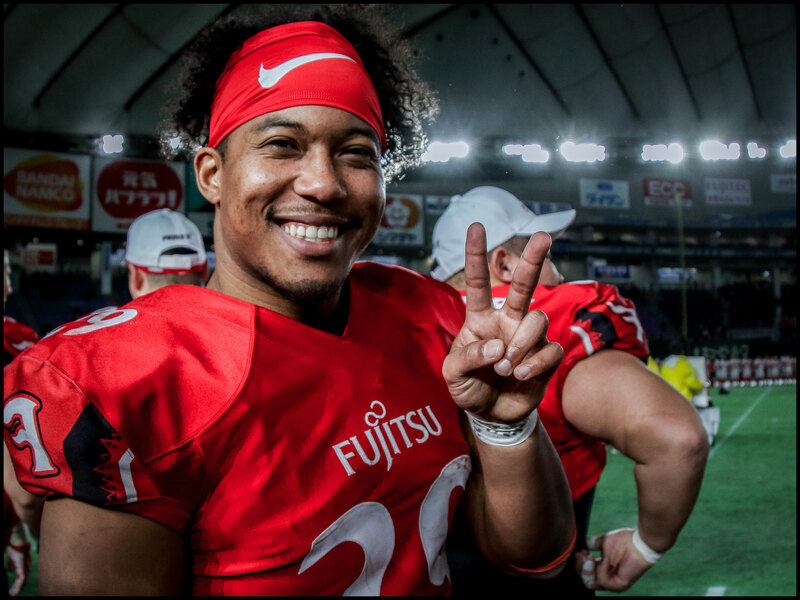 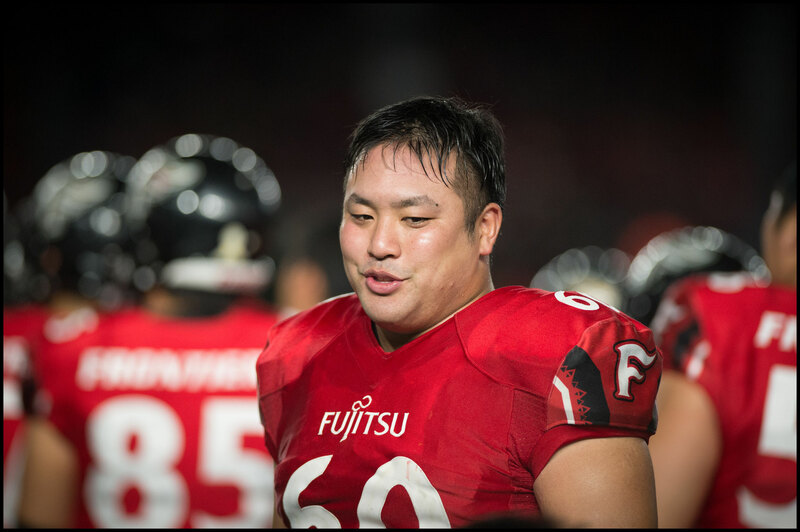 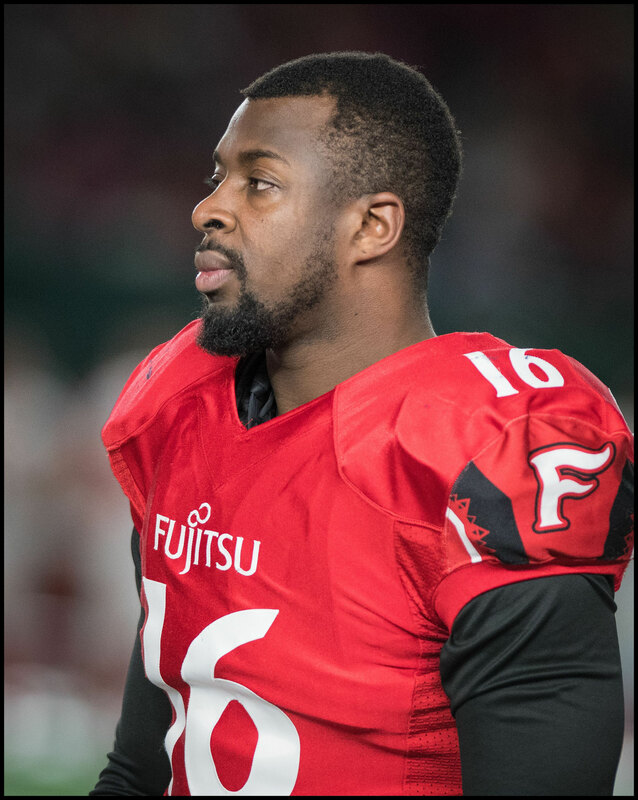 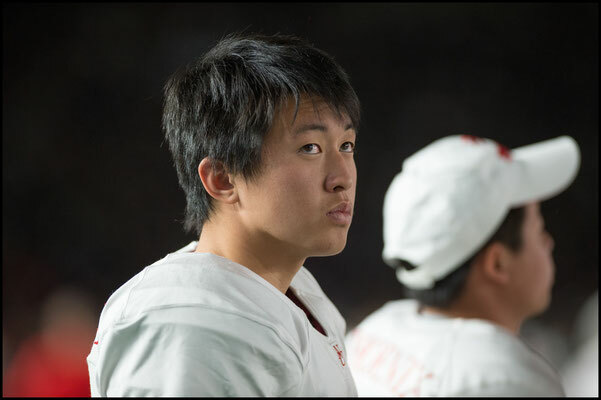 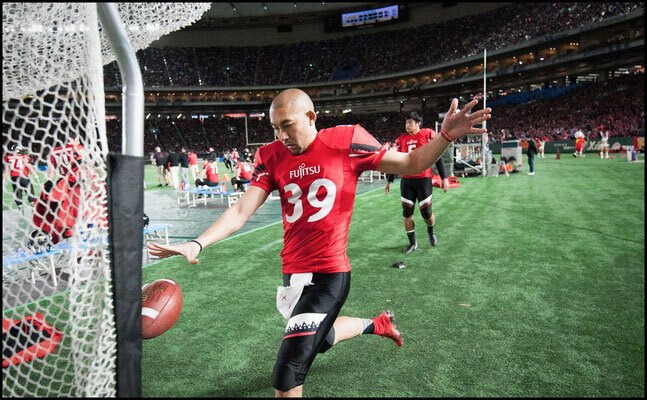 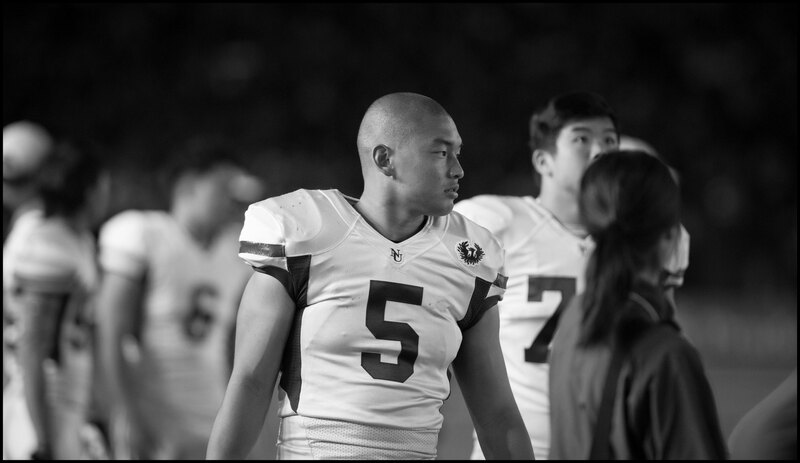 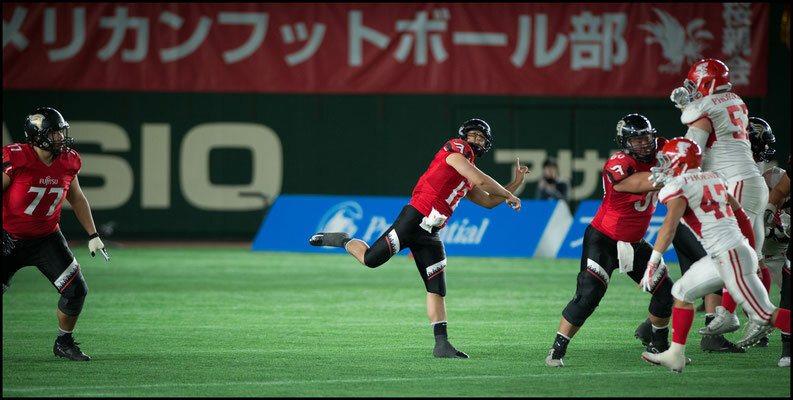 Given that Fujitsu had blown out a strong IBM Big Blue side 63 - 23 in the Japan X Bowl, the fact that Nichidai was able to hold Frontiers to just four TDs is commendable. 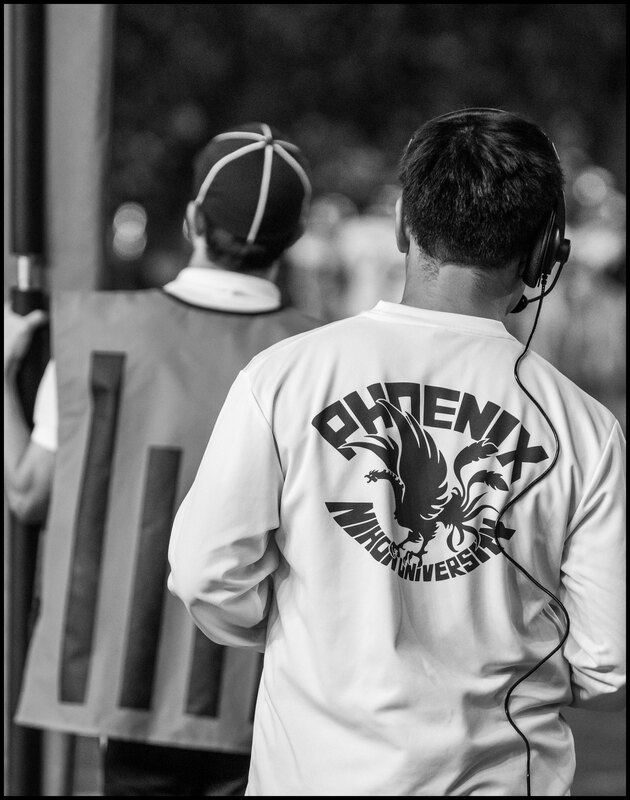 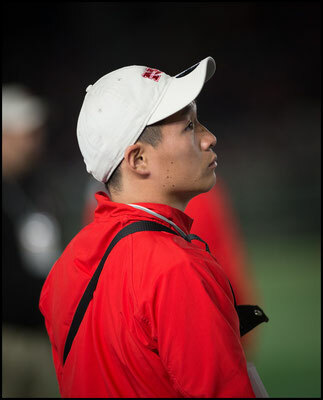 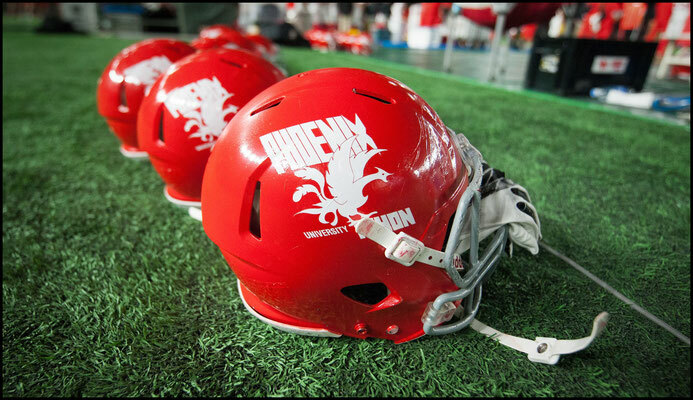 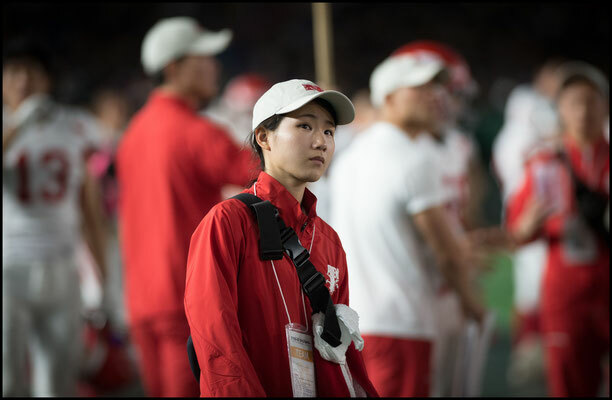 Despite Phoenix having a 4-0 record in the Rice Bowl going into the game, few expected the university side to win. 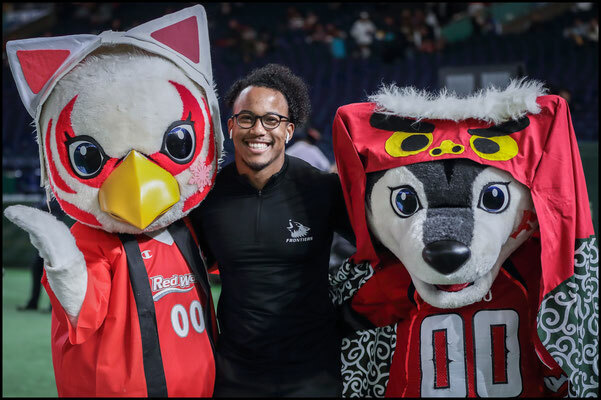 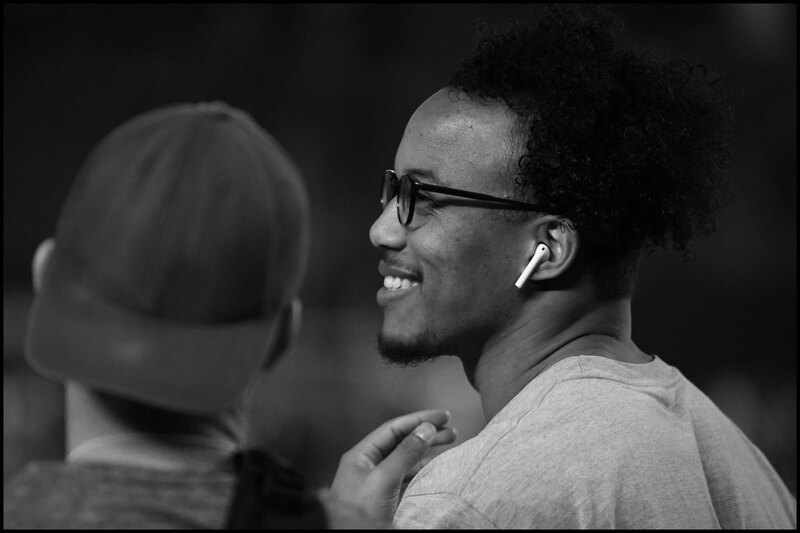 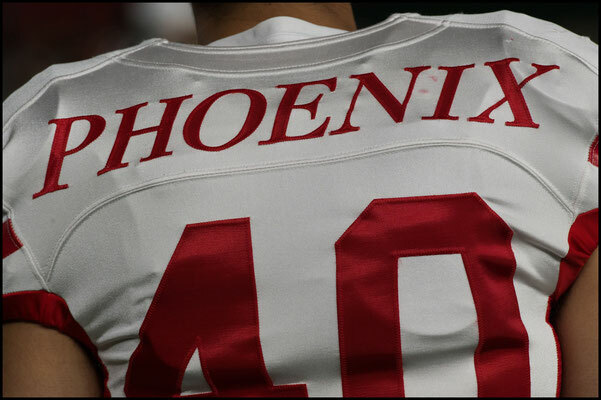 In the almost three decades since Phoenix’s last appearance, XLeague teams, powered by top US talent both on and off the field, have pulled away from the colleges. 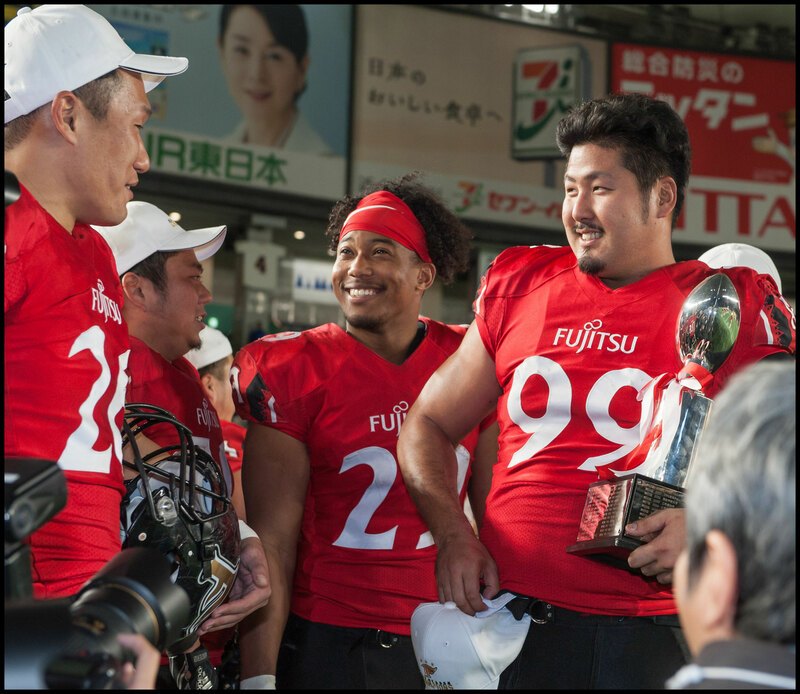 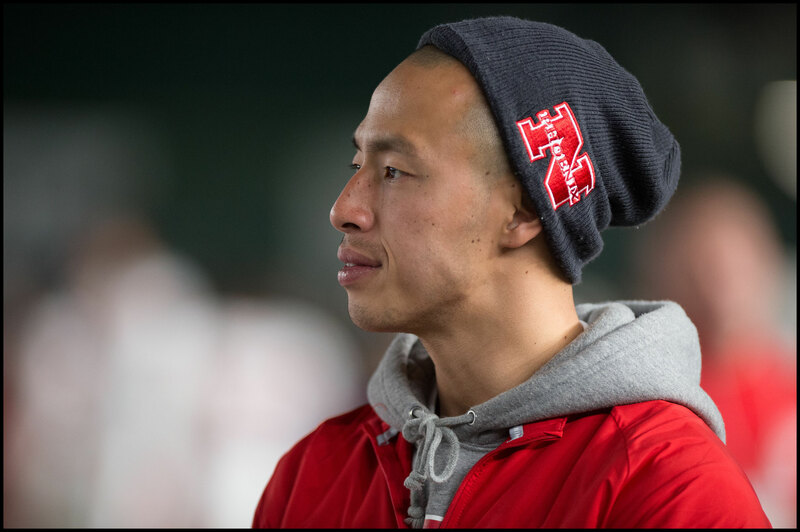 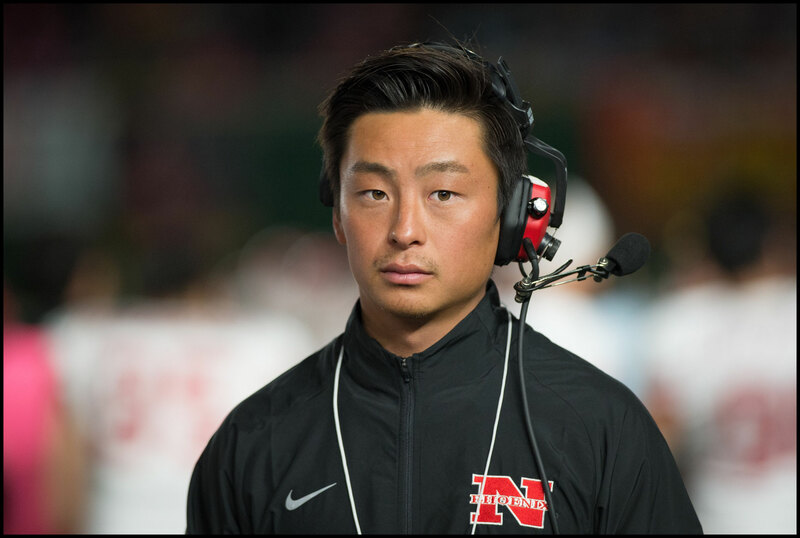 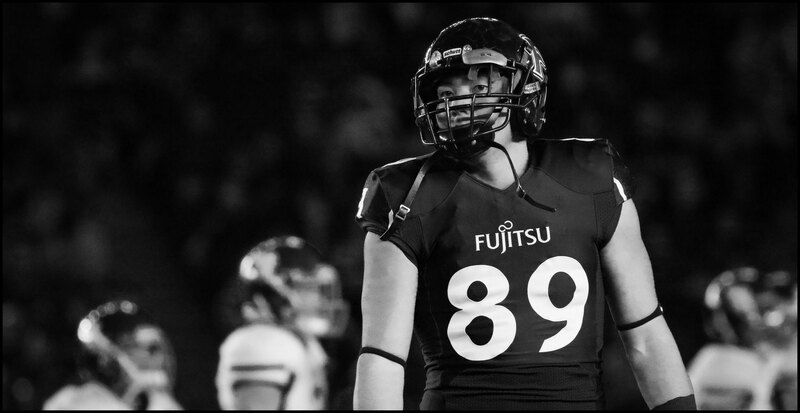 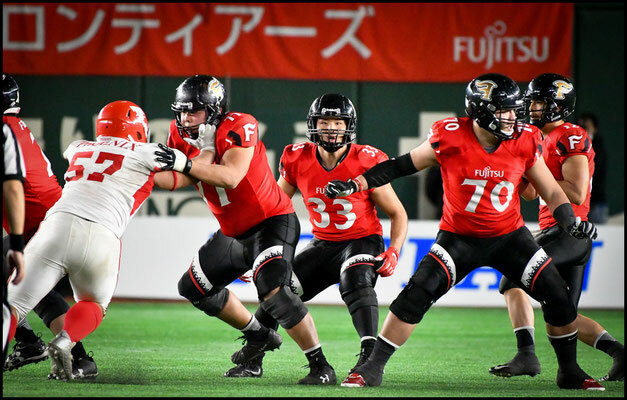 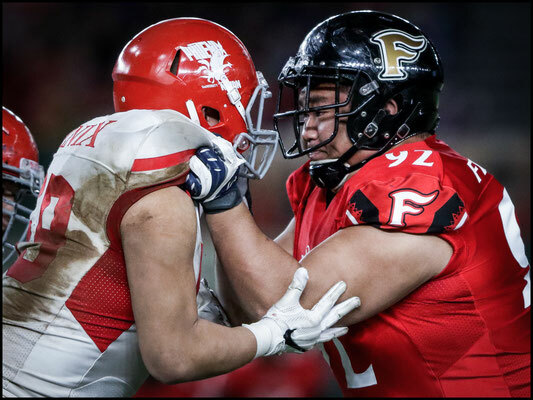 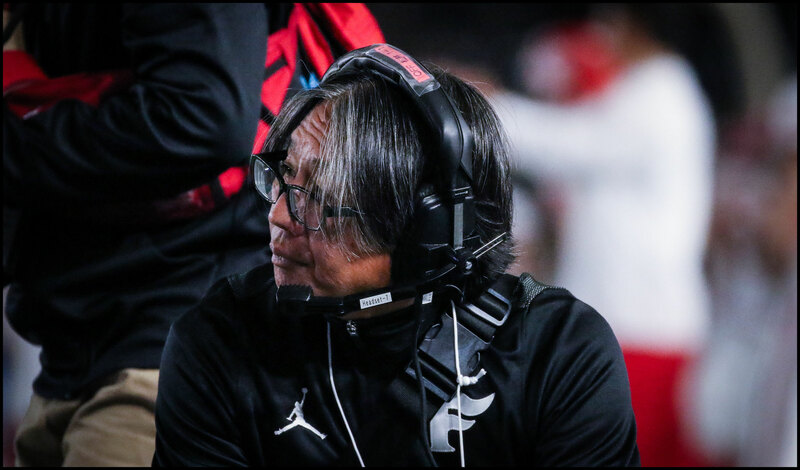 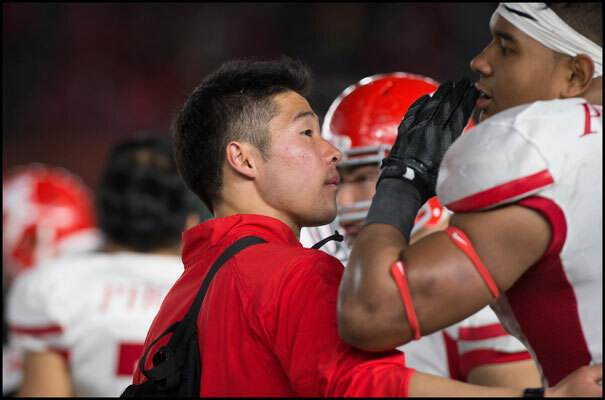 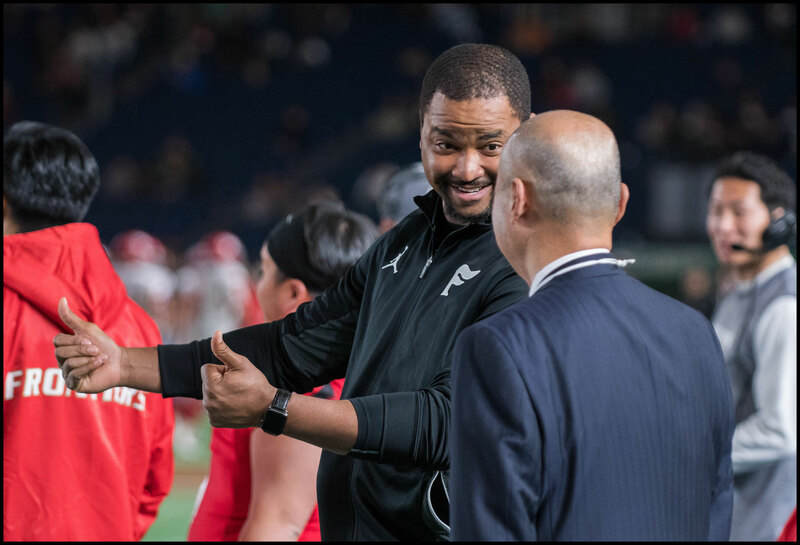 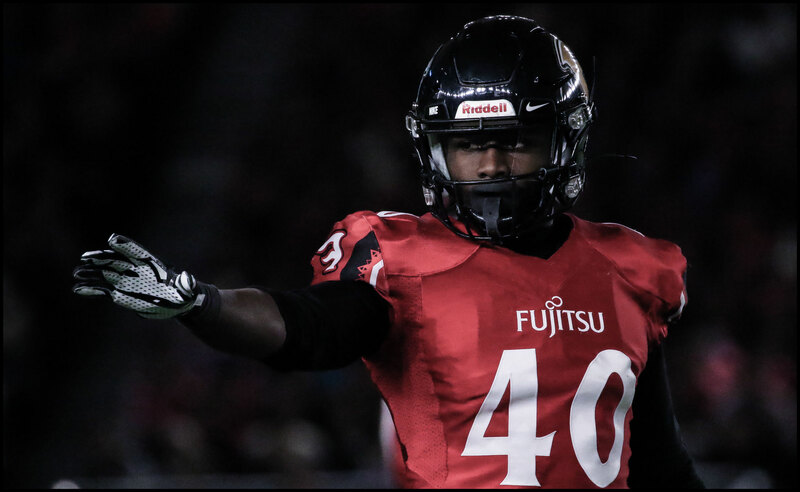 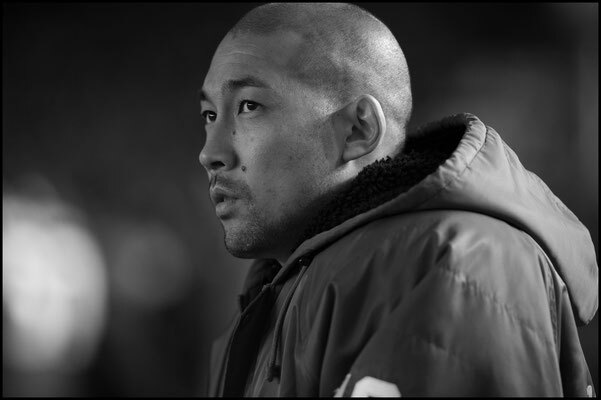 Fujitsu with three position coaches coming from an NFL / Div.1 background and four American players in the same system for several years, has opened up a gap on the rest of the country. 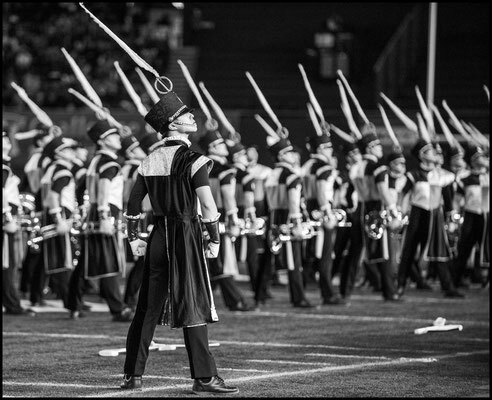 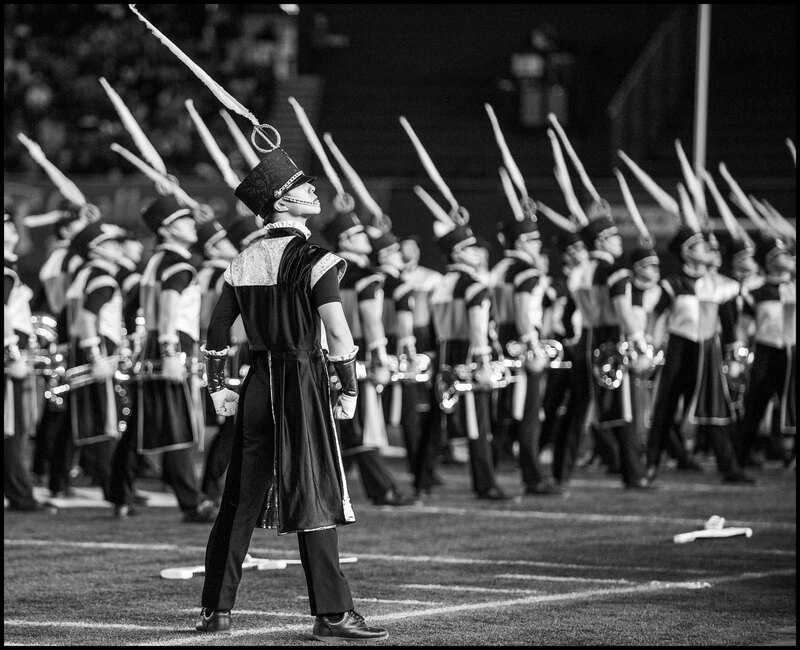 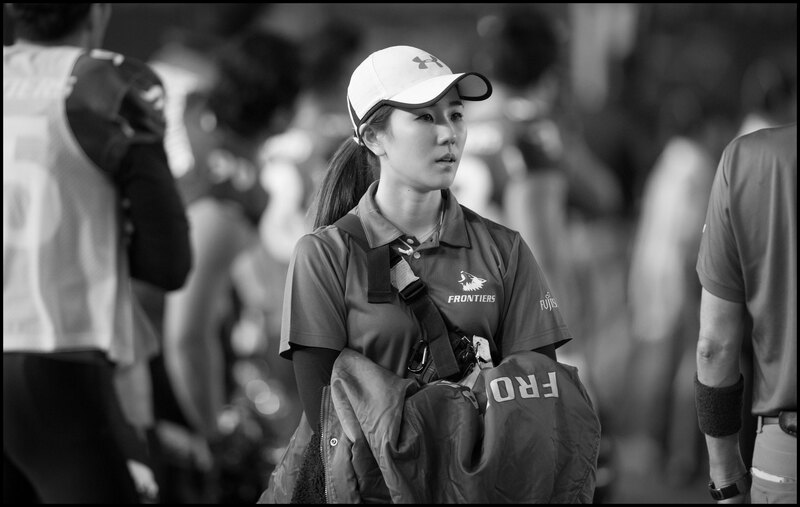 The extra practice day each week that their parent company allows certainly doesn’t hurt either. 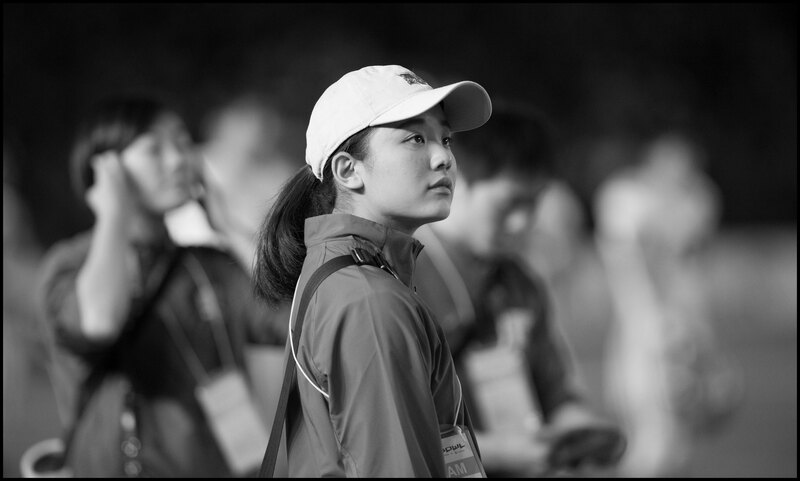 The challenge now is for teams like Obic and IBM to find ways to counter those advantages. 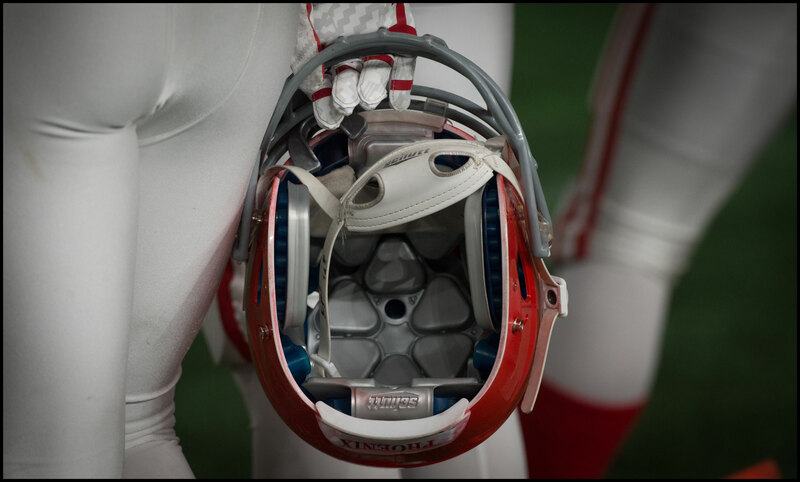 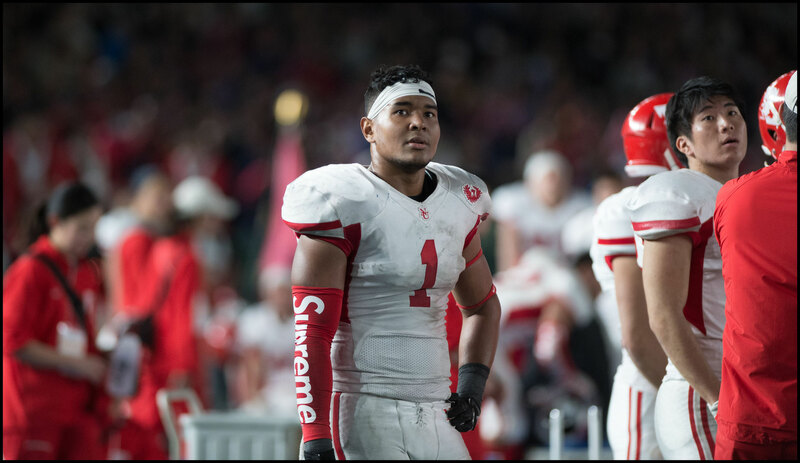 The former will be boosted by the arrival of Nichidai DB Bronson Beatty who led his team with ten tackles. 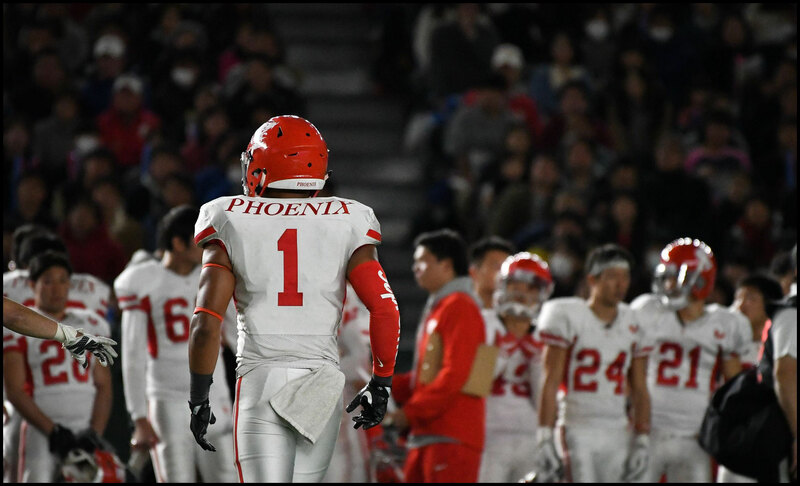 Beatty’s brother BJ has been a standout on the Chiba based side for many years and next season Bronson will join him as the Hawaiian brothers try to bring a title back to Narashino for the first time in five years. 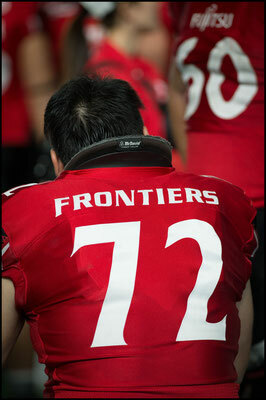 Beatty’s ten tackles were partly a result of Frontiers players constantly getting to the second and third level. 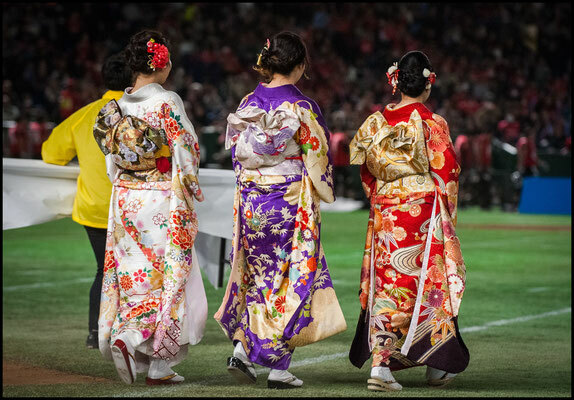 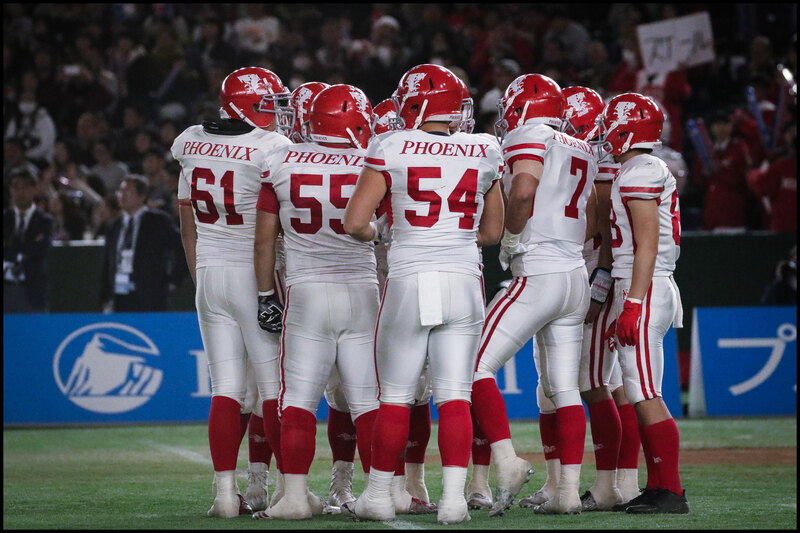 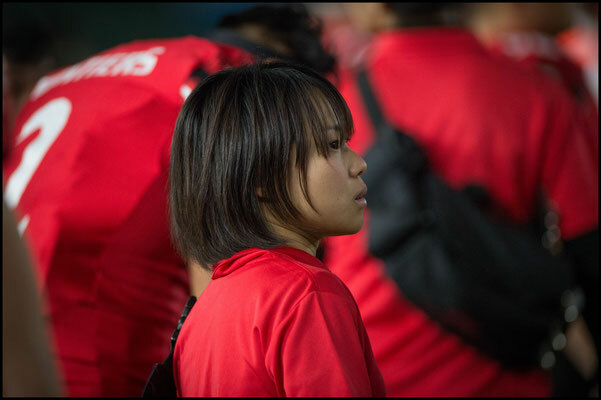 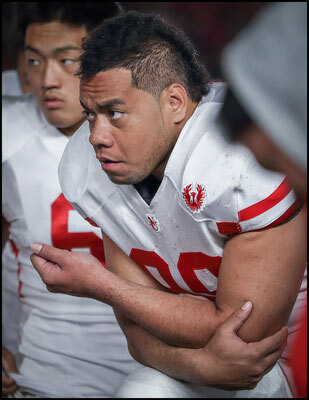 Phoenix were used to winning the physical battle up front most of the season but Fujitsu’s powerful OLine meant that Nichidai’s back end had to cover for much longer than they were used to. 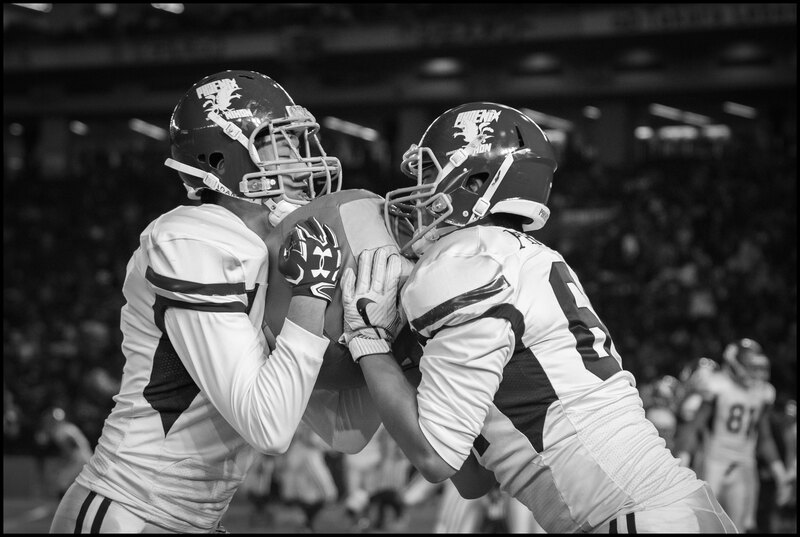 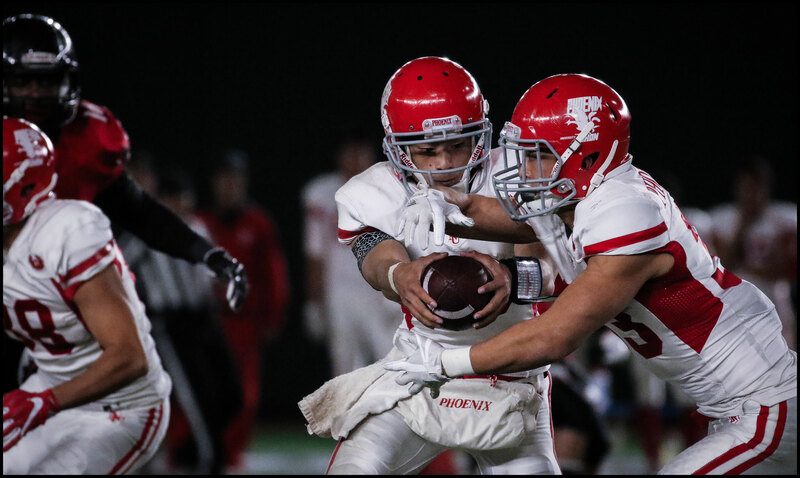 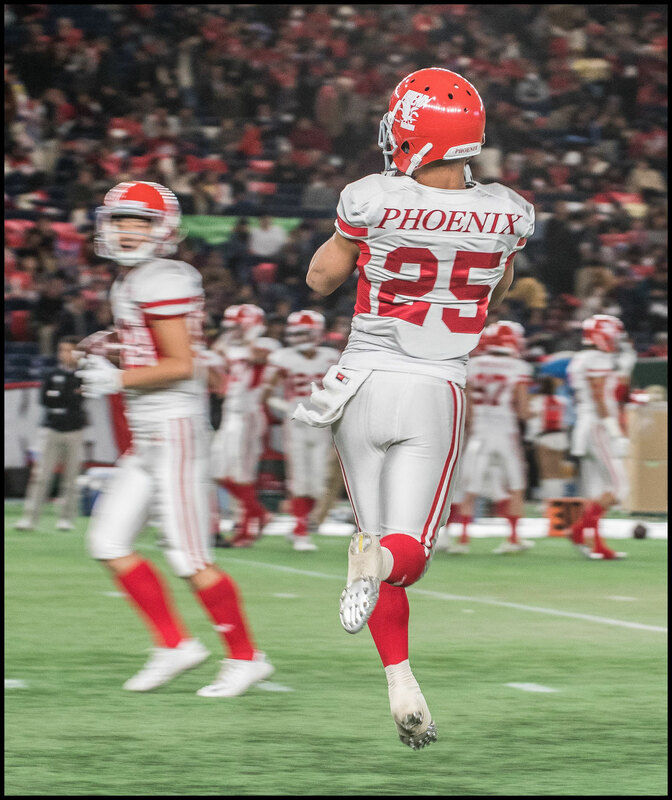 Early on it seemed as the teams had got the playbooks mixed up with Phoenix starting out with a conservative offense and Frontiers opening with a triple handoff reverse that finished with a 60-yard bomb attempt. 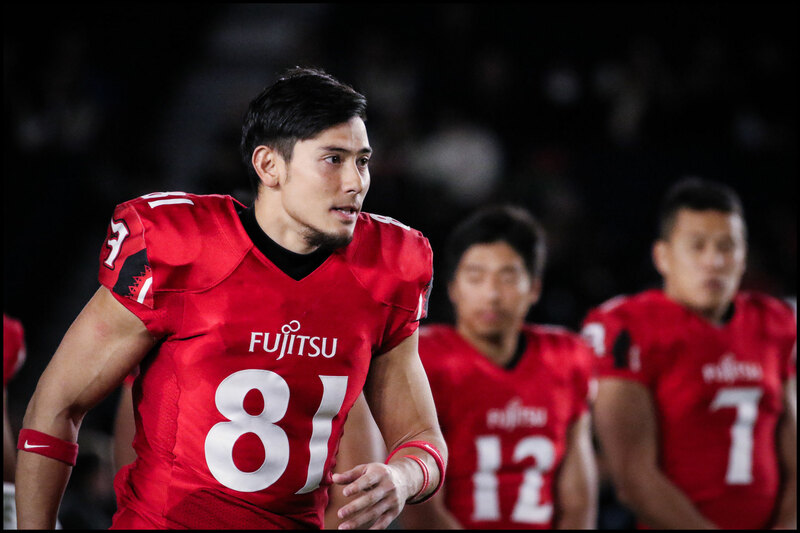 That didn’t work but Fujitsu did get their passing game going in the end, racking up 318 yards in the air with three scores. Gino Gordon caught the first of those to open the scoring with just over a minute left in the first quarter and the Harvard man ran in another score in the final period. 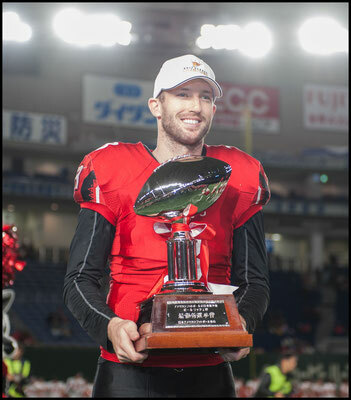 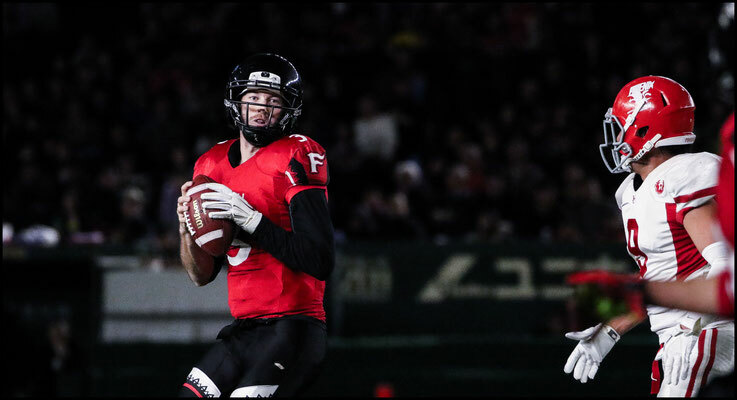 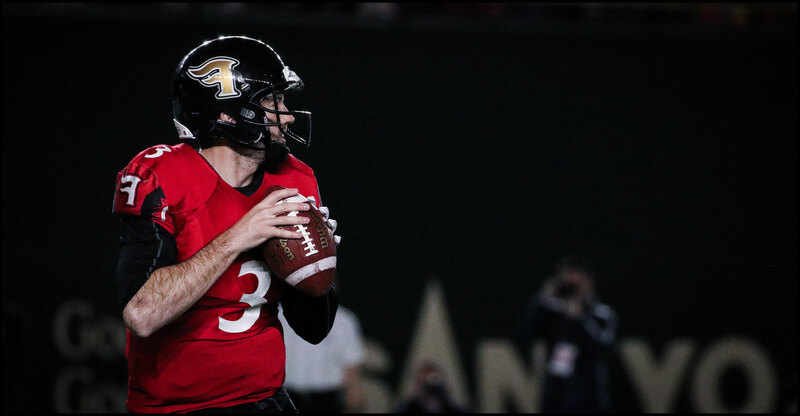 QB Colby Cameron was named the MVP and has now led his team to three titles in four seasons. 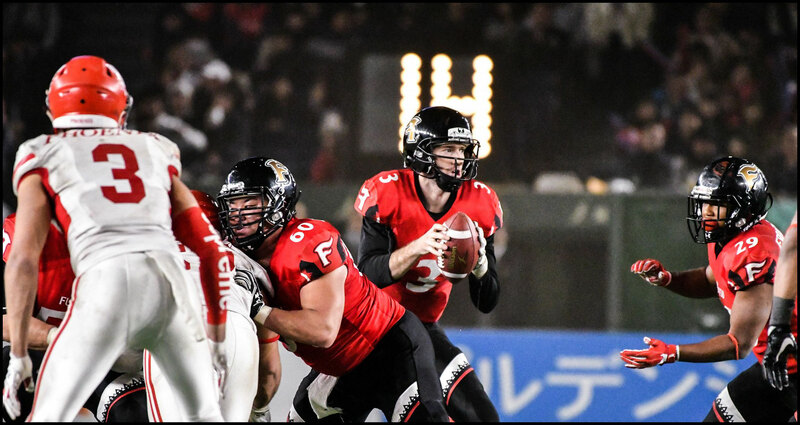 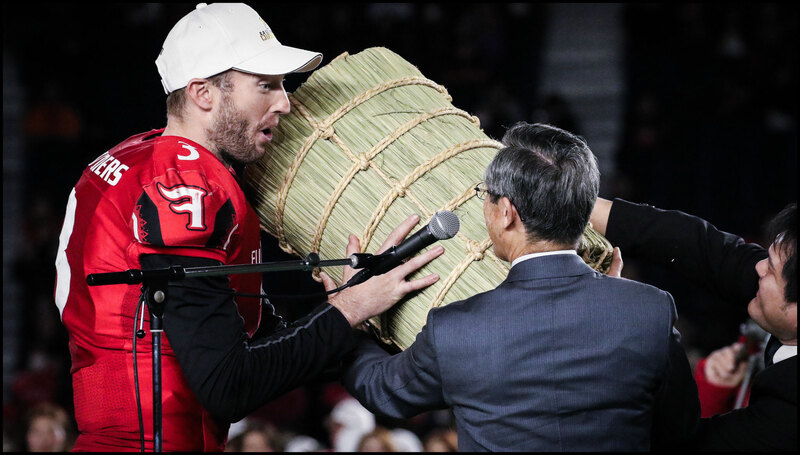 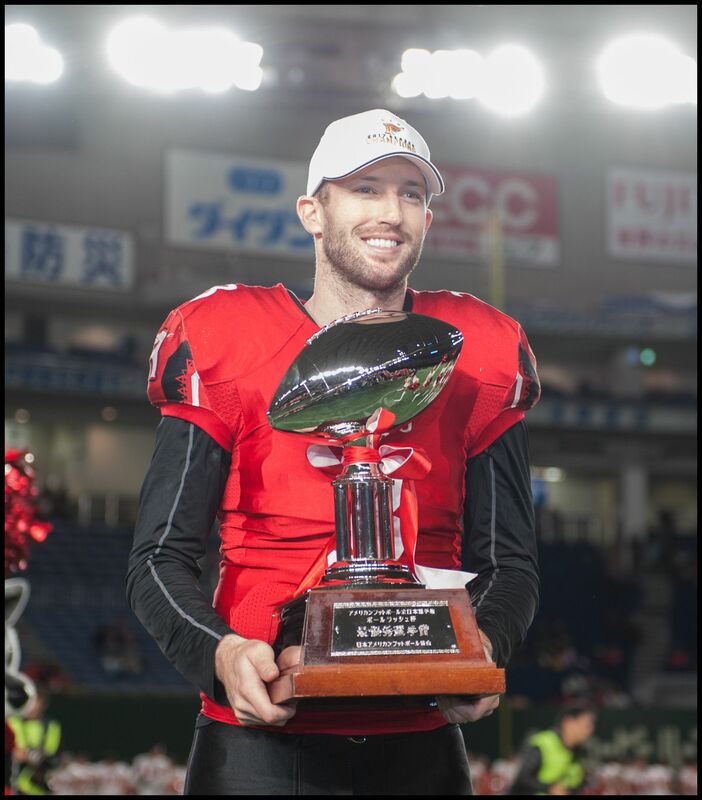 Cameron has been outstanding since arriving in Japan and the former Sammy Baugh Trophy winner (his win sandwiched by Case Keenum and Derek Carr) surely deserved more than the single shot he got at the NFL on a Panthers team that had Cam Newton. That’s the reality of professional football though and there are at least twice as many players with the ability to play in that league as spots available. 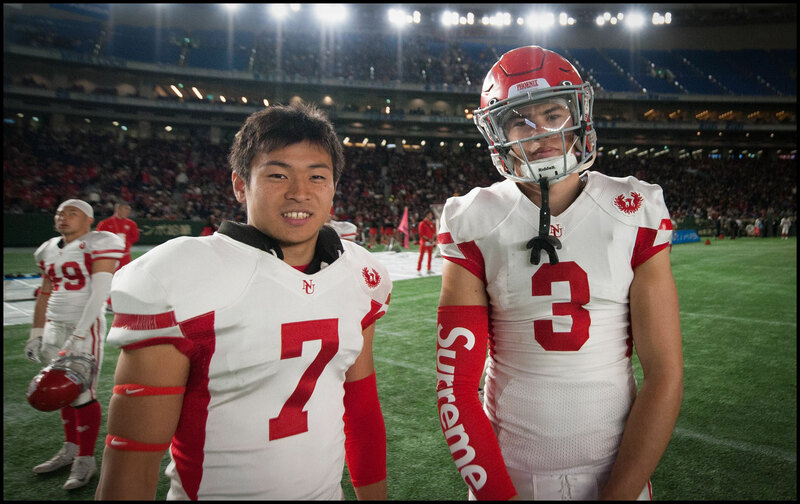 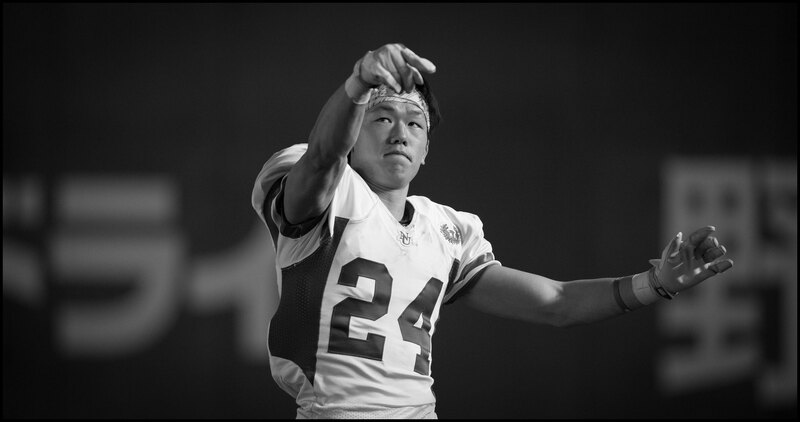 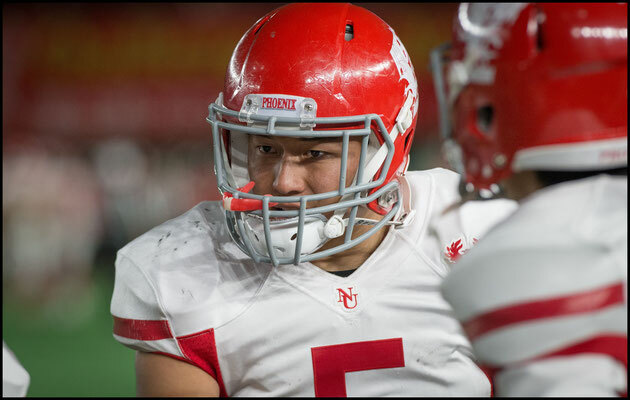 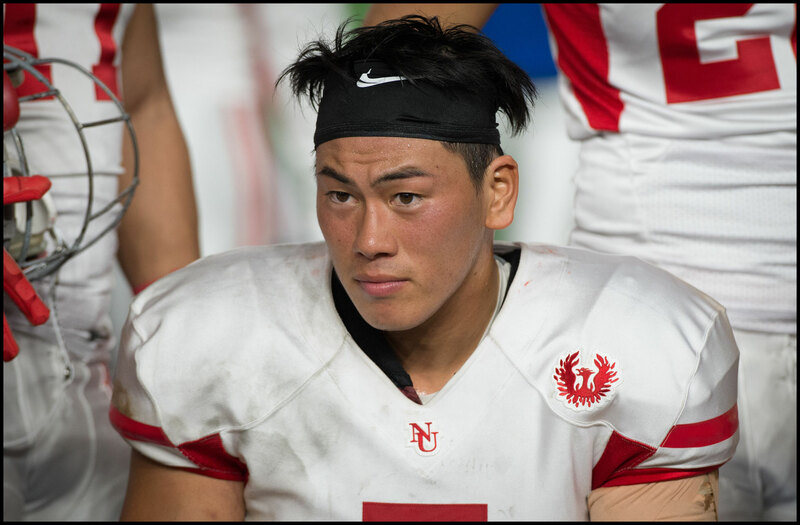 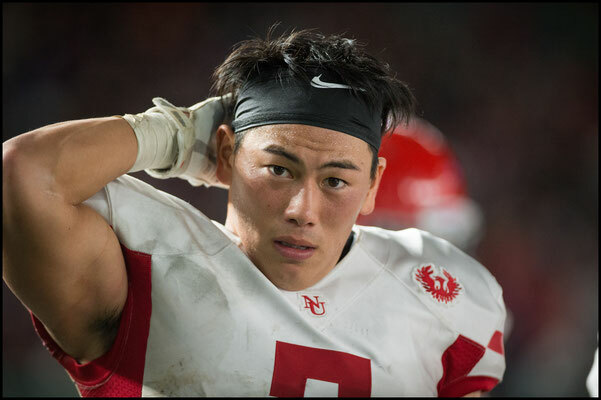 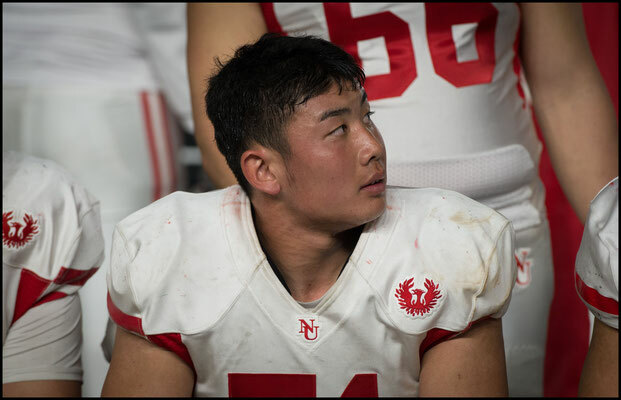 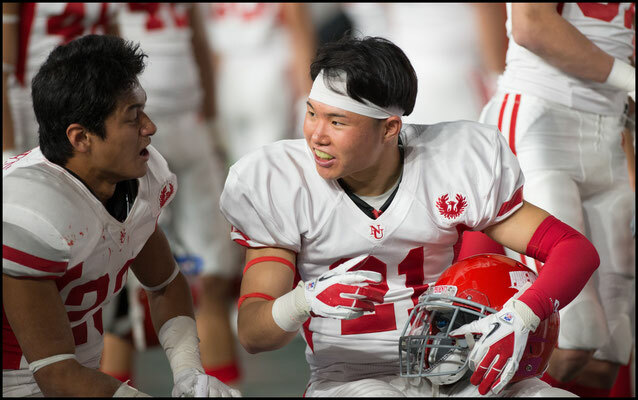 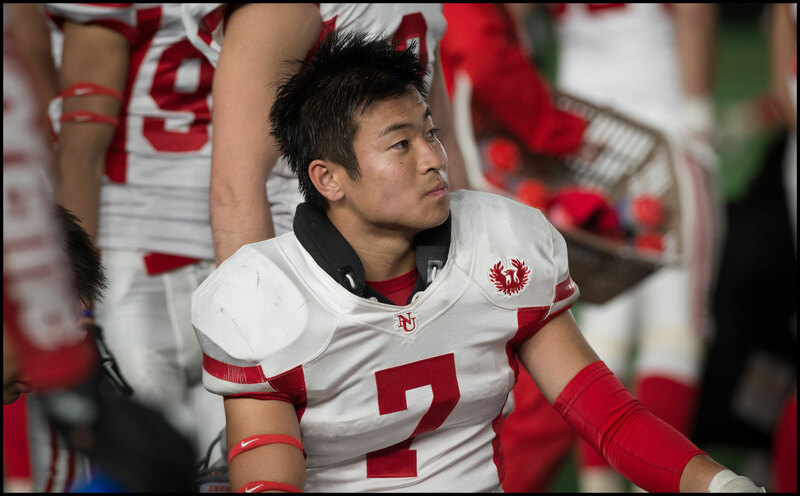 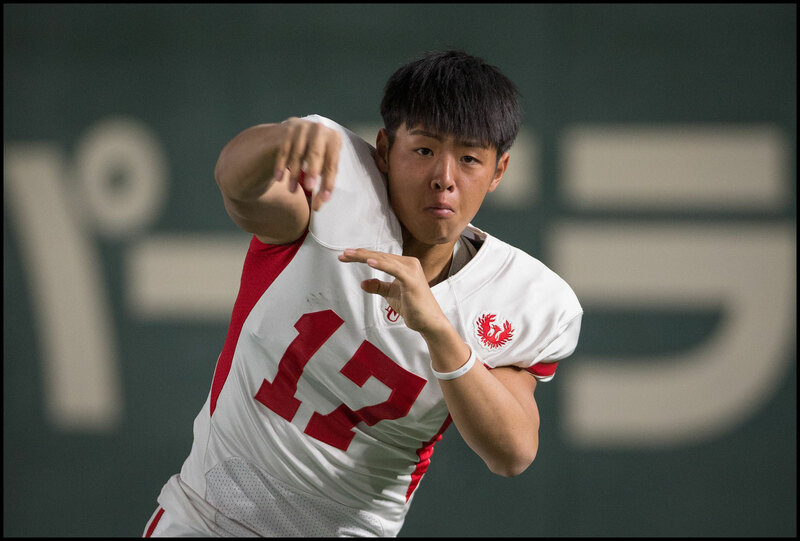 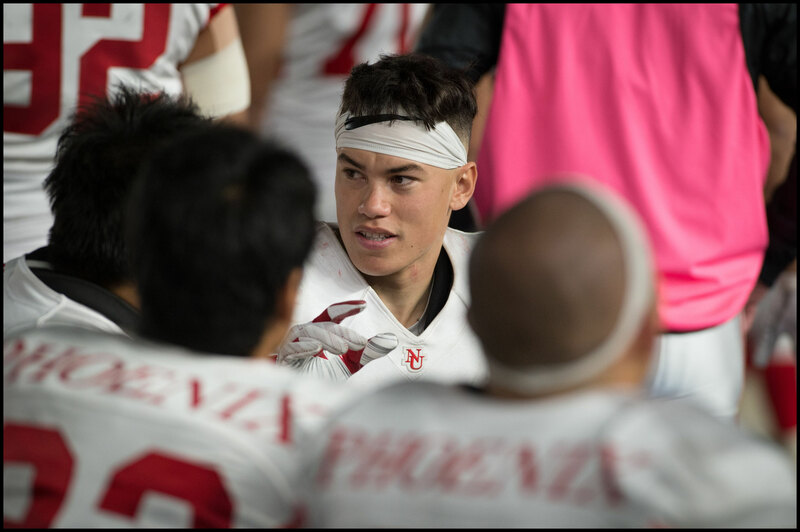 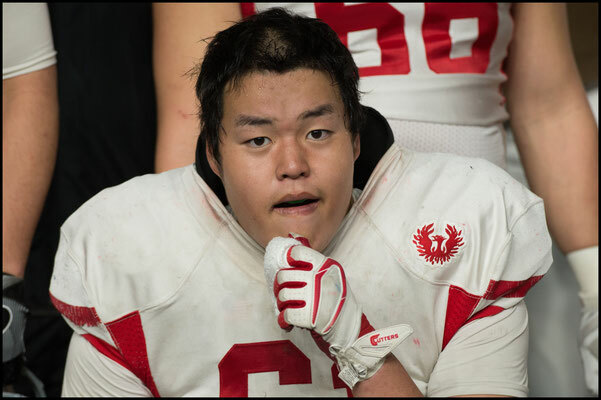 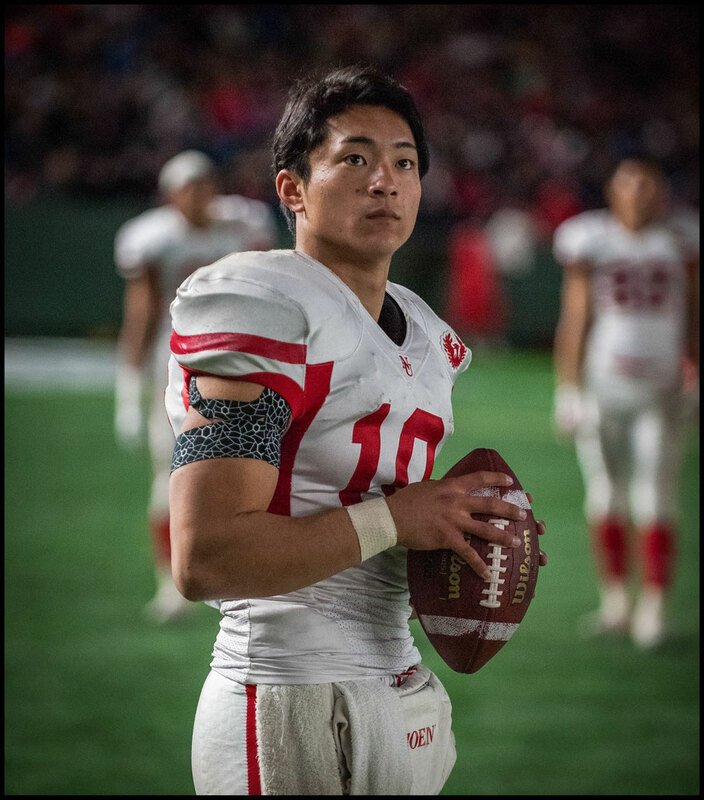 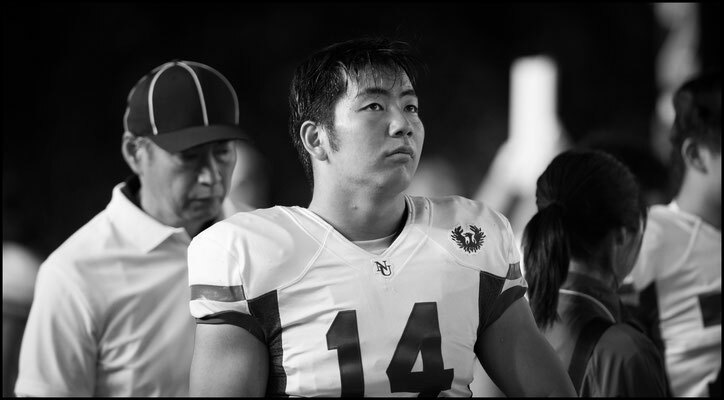 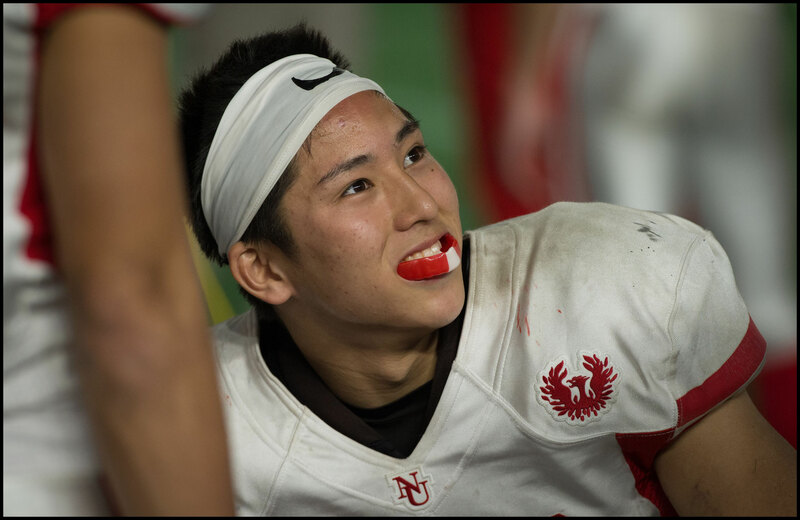 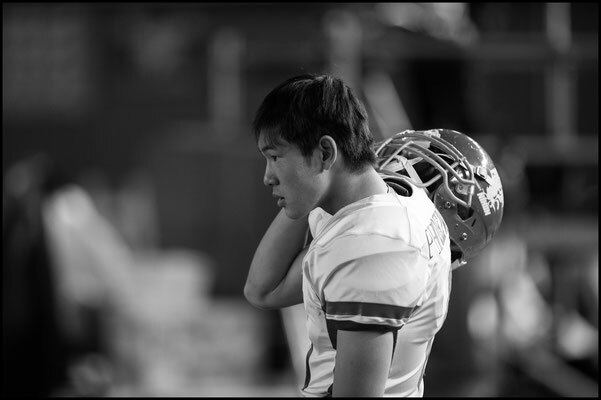 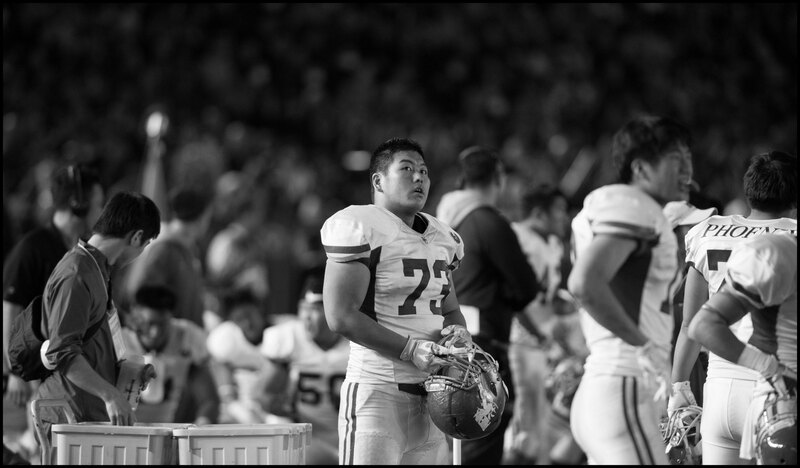 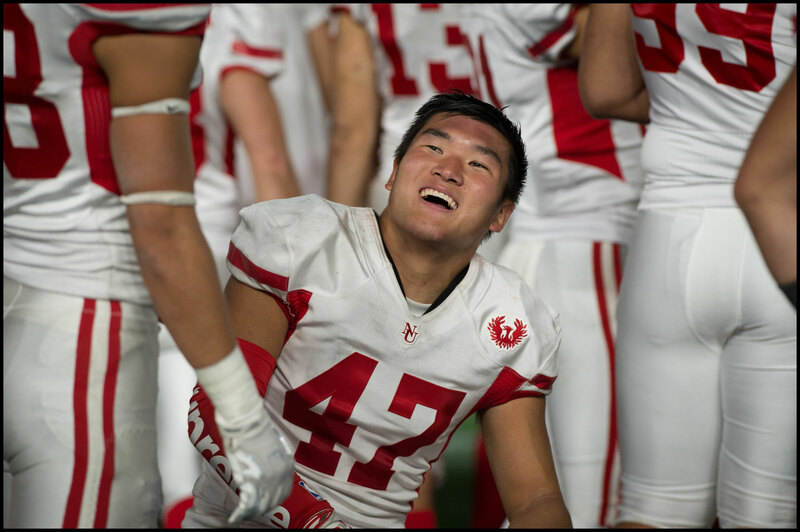 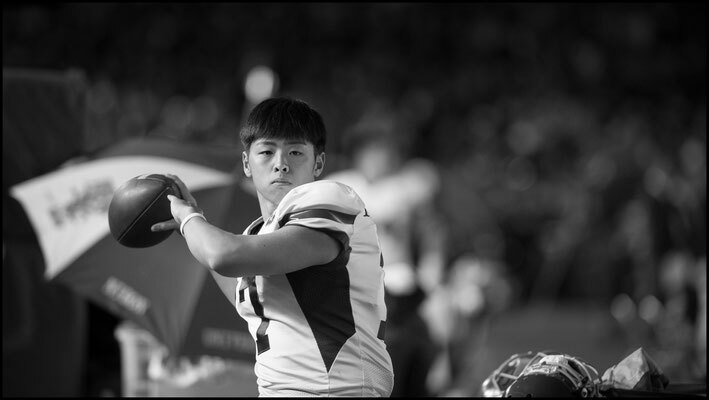 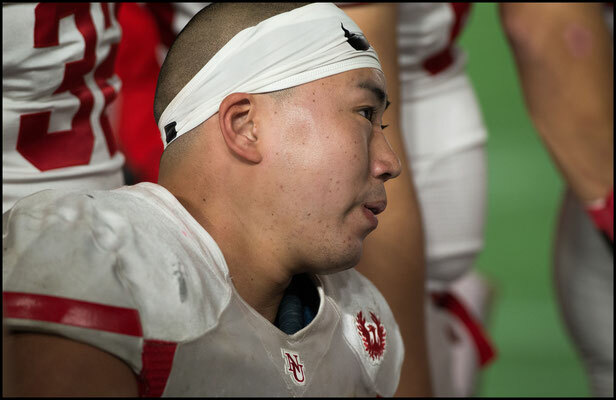 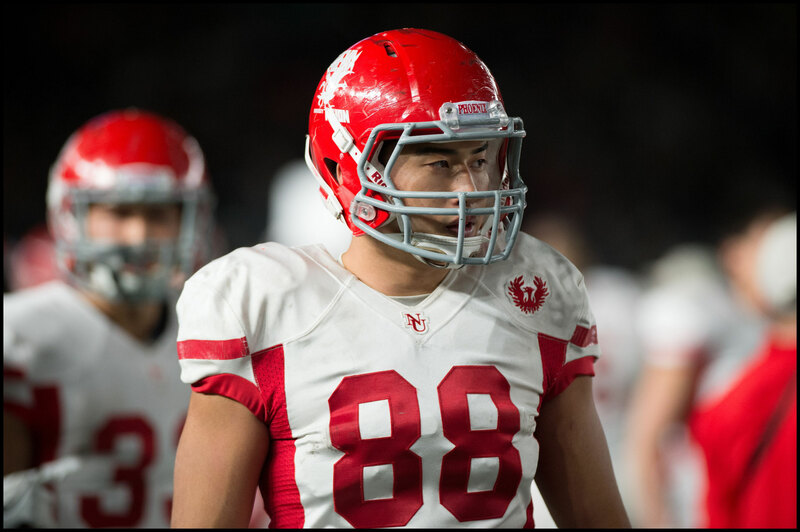 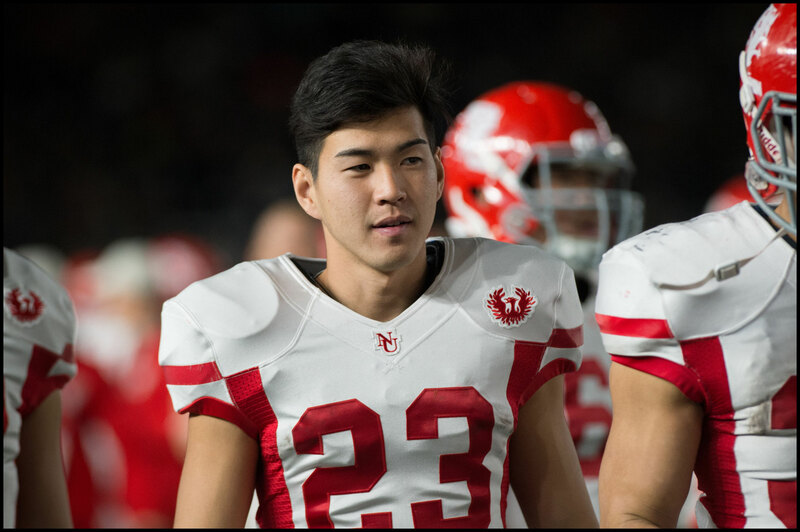 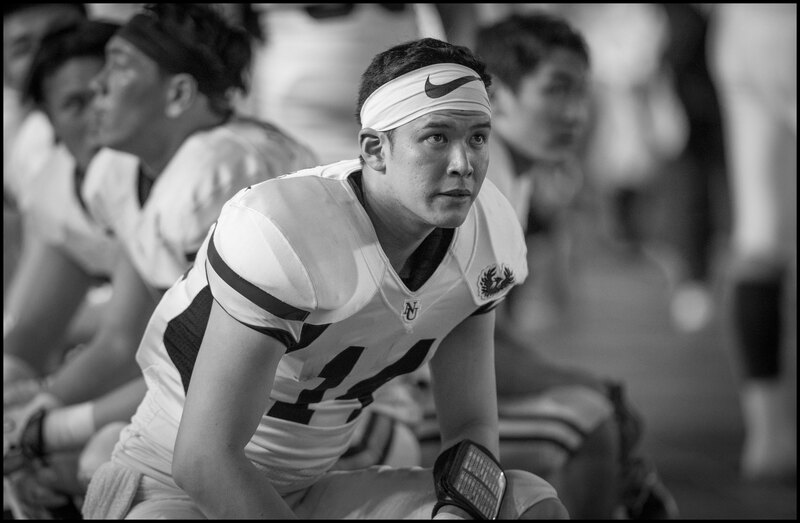 Cameron’s opposite number Taiki Hayashi had an ok day going 11 of 23 for 93 yards with a bunch of those coming on one 49 yard pass in the third quarter. Five plays later though whatever hope the students still had was snuffed out when a slow developing trick play ended in a poorly thrown pass that Fujitsu’s Al Rilwan Adeyemei picked off. 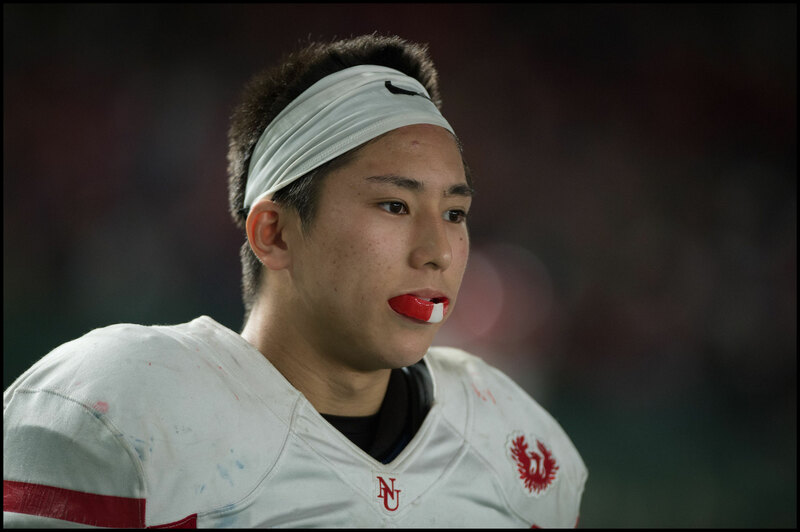 Hayashi is a freshman so he’ll get several more chances to add to the collegiate title he led Nichidai to. 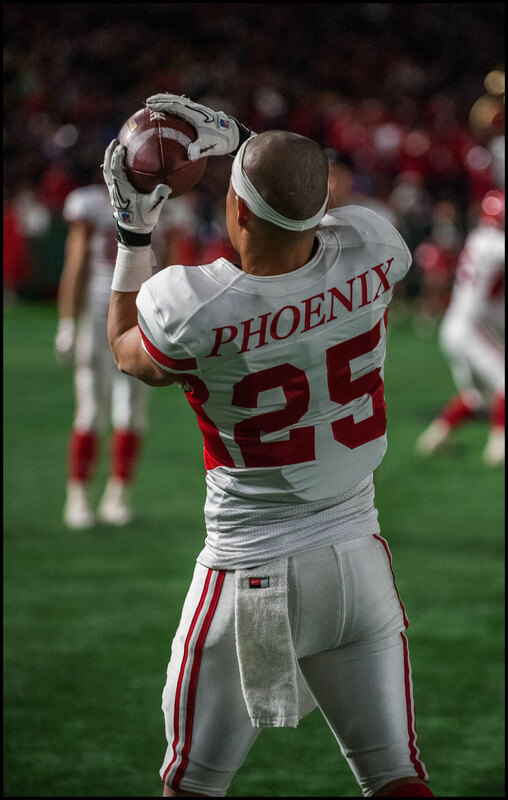 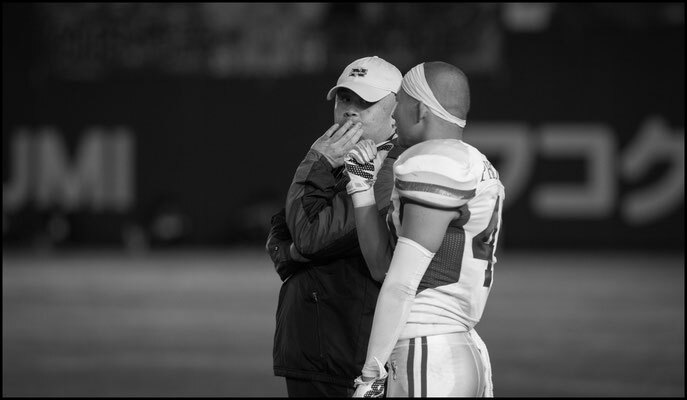 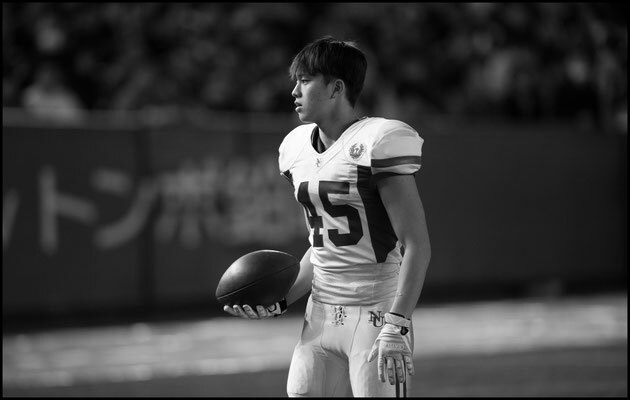 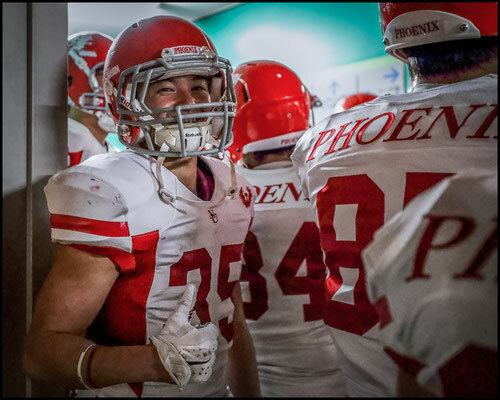 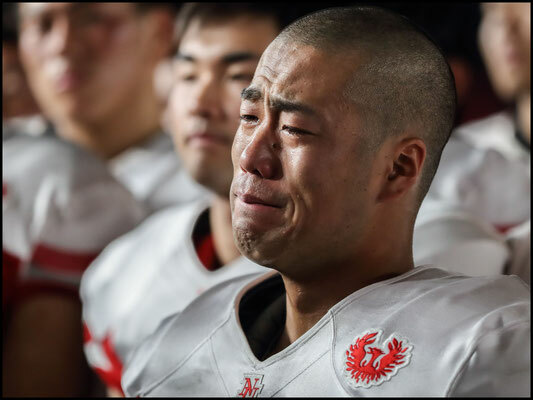 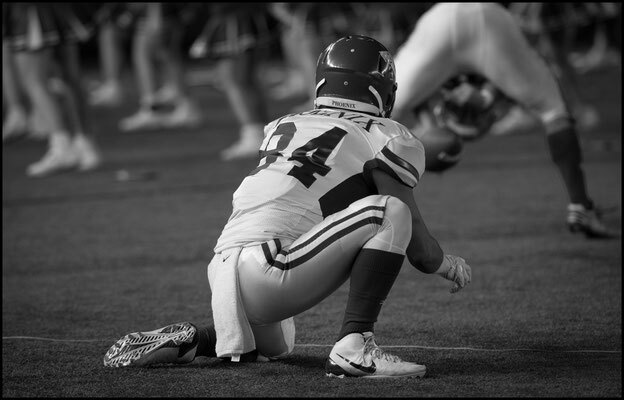 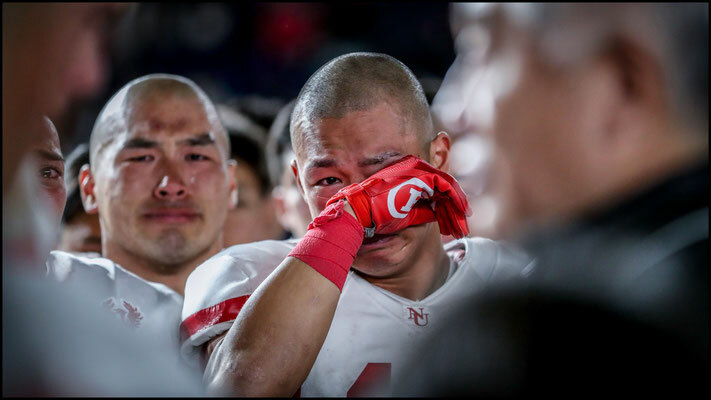 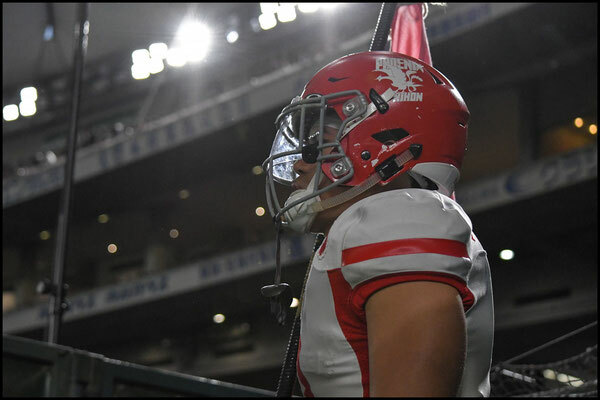 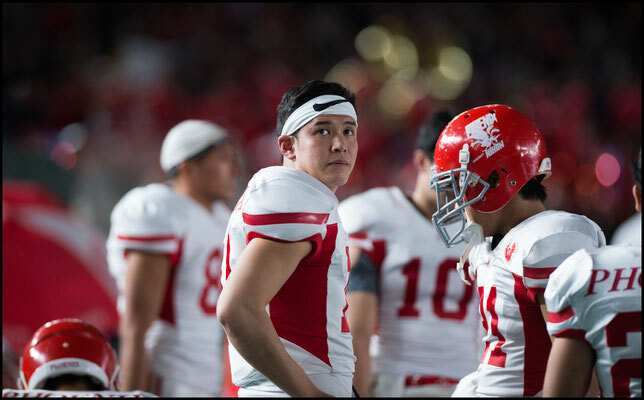 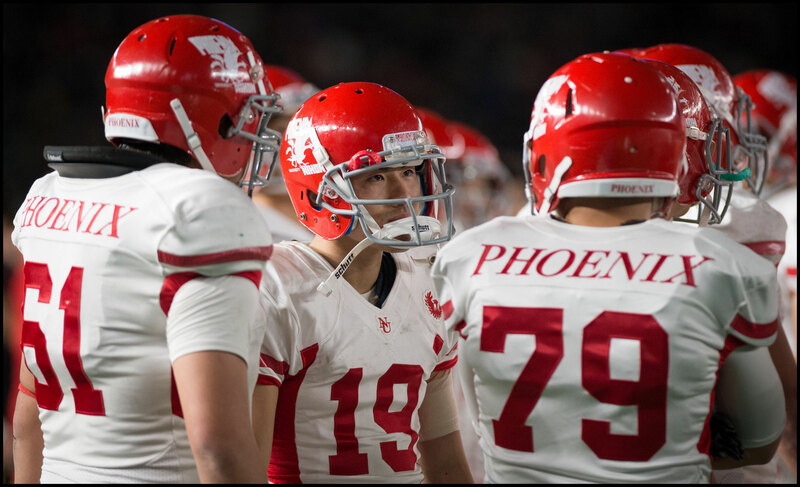 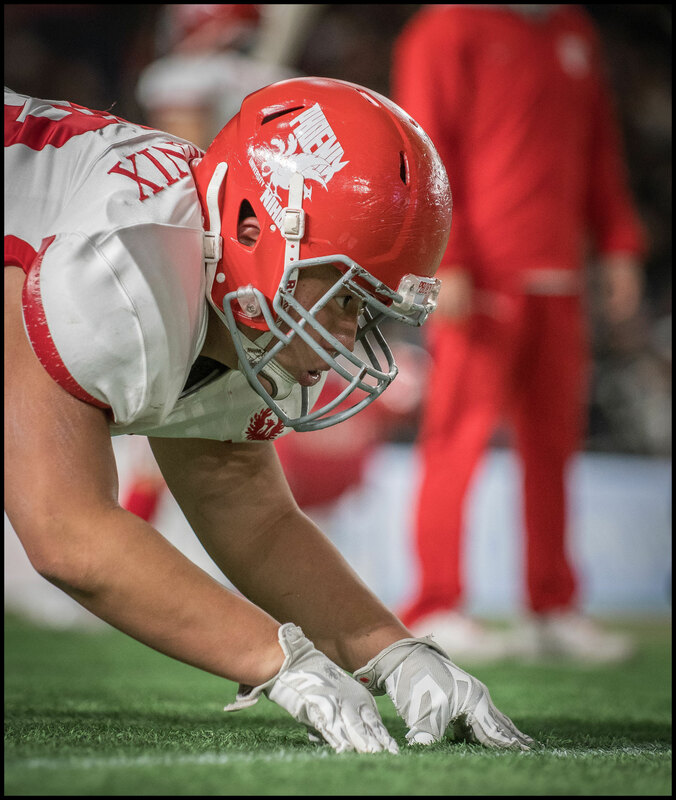 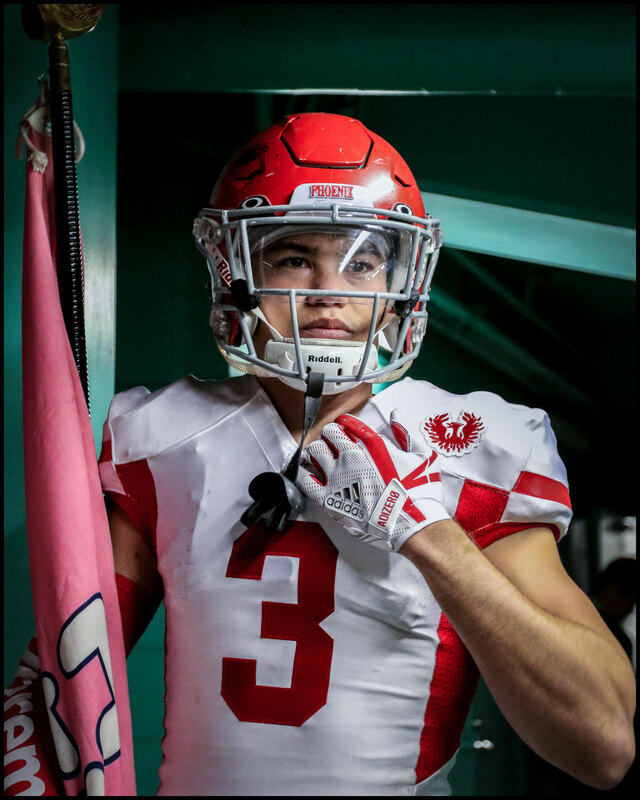 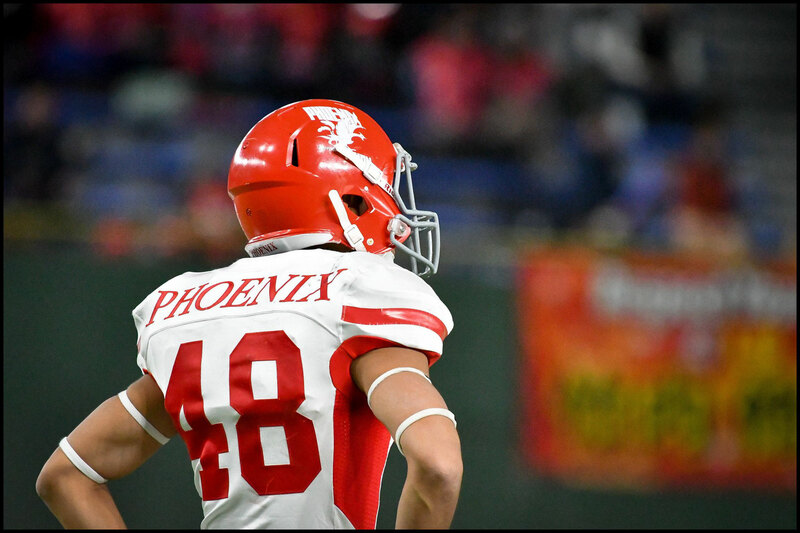 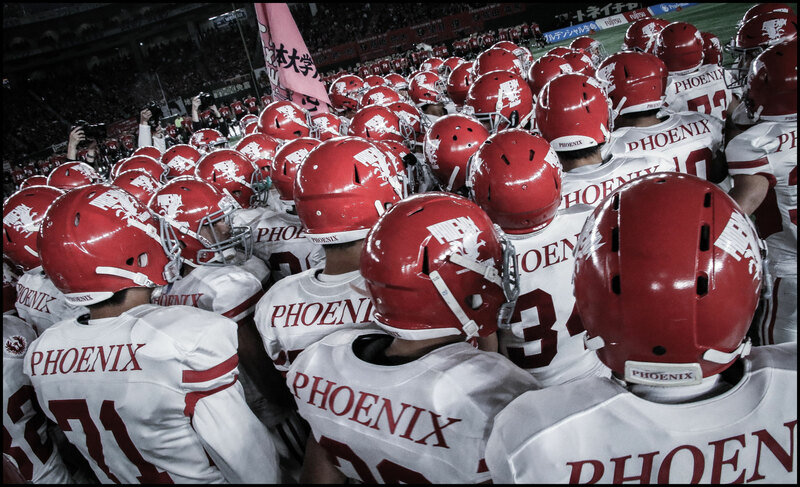 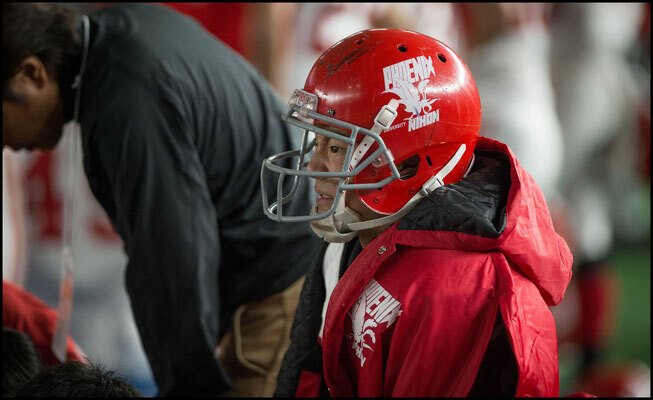 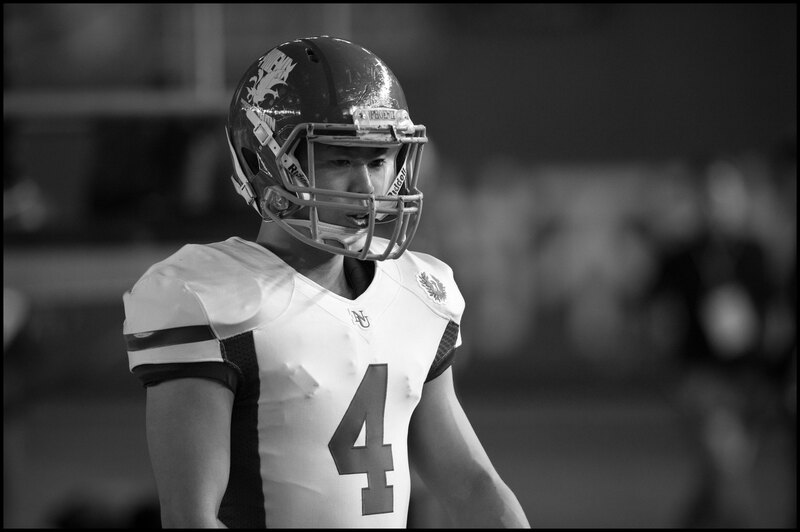 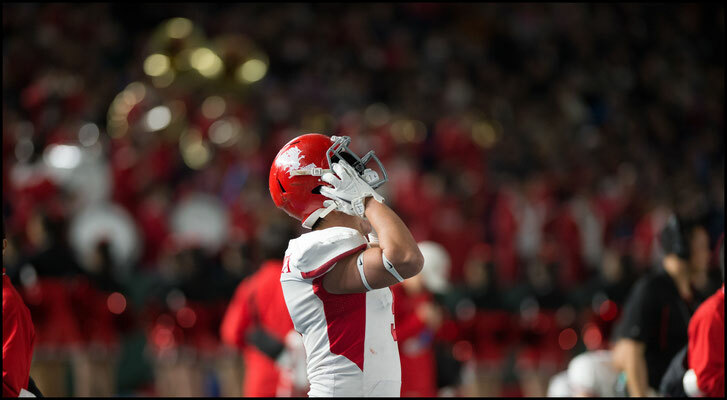 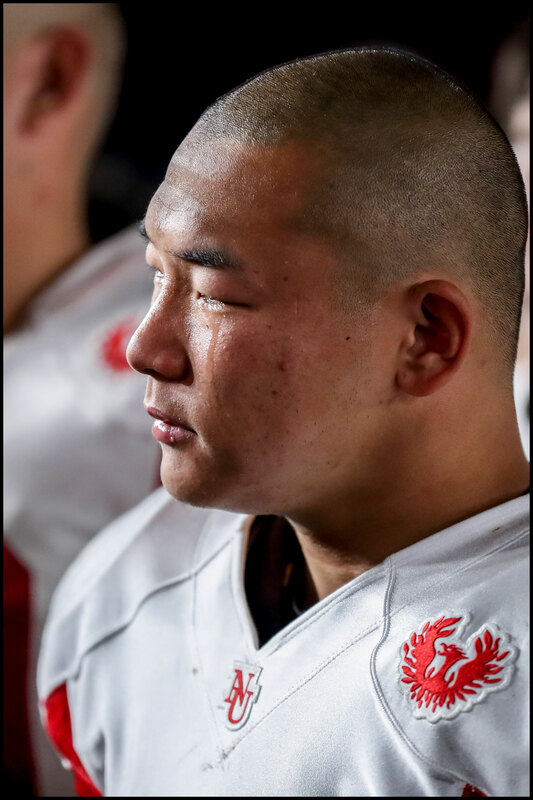 For many of the Phoenix players though the Rice Bowl was the last time they’ll ever put on pads so the tears at the end of the game were probably more for that reason than for the result. 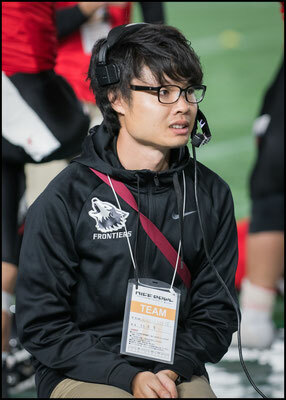 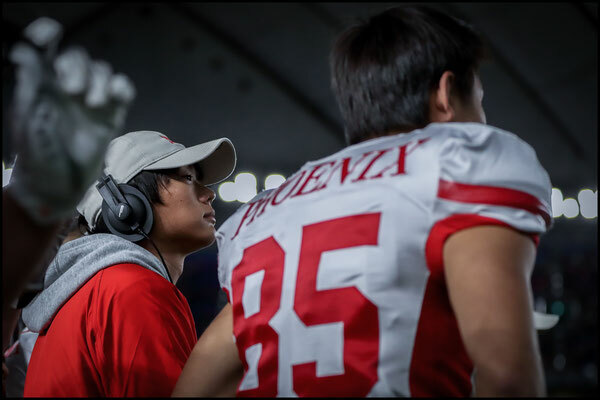 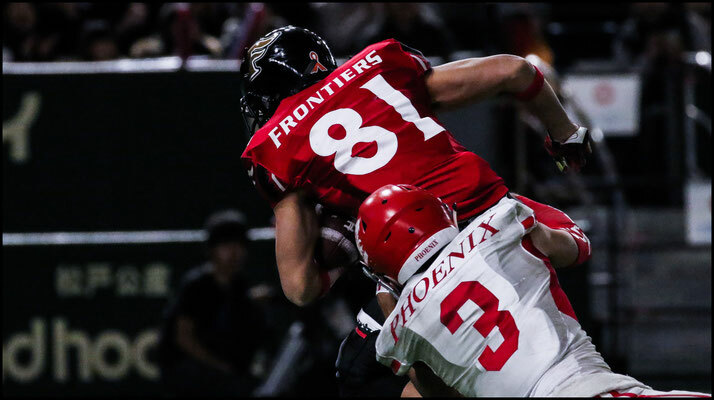 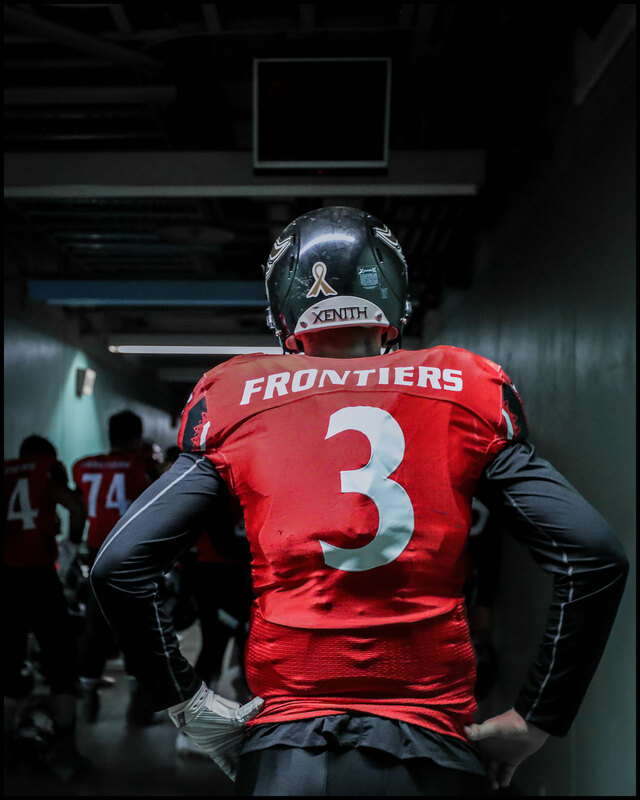 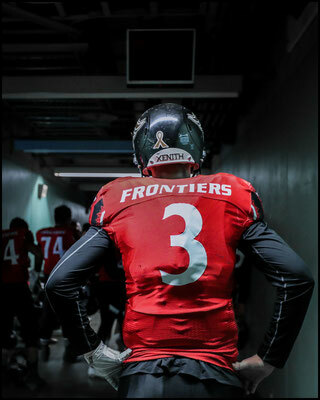 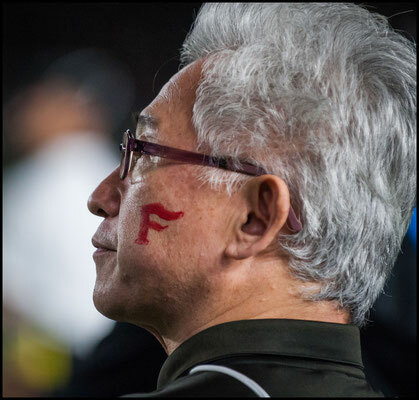 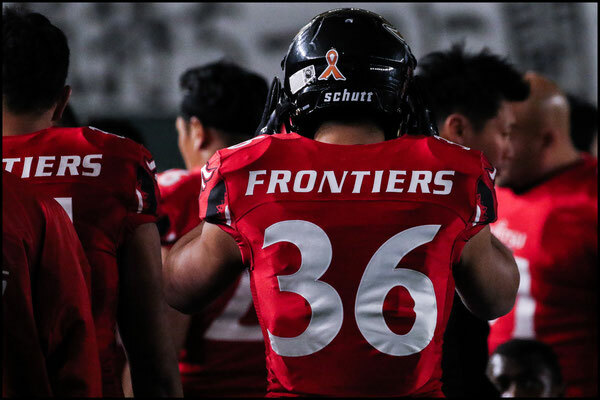 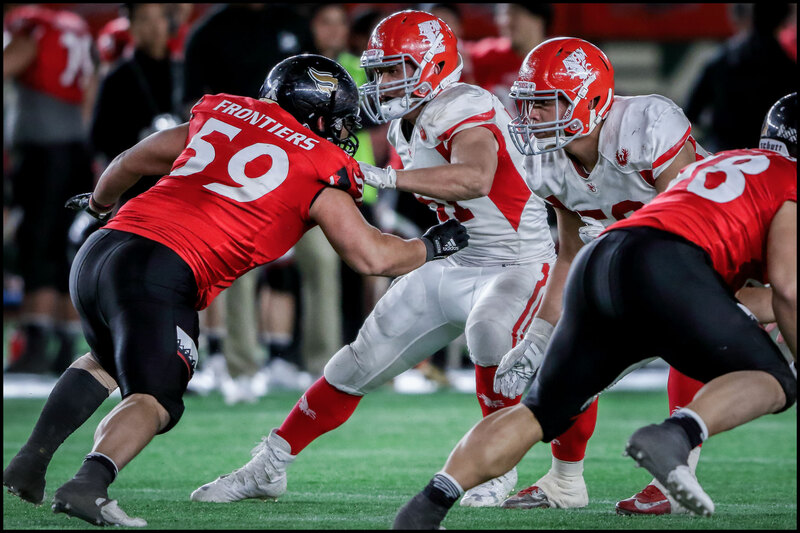 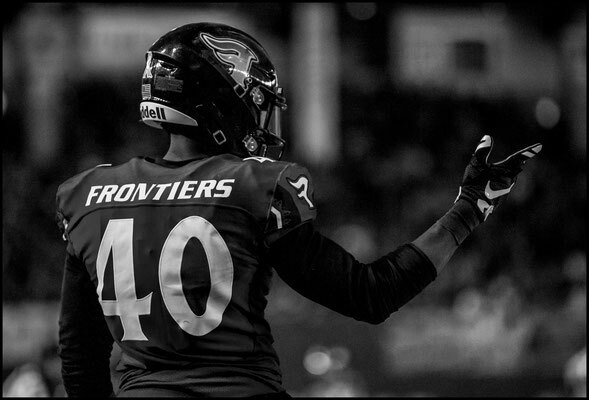 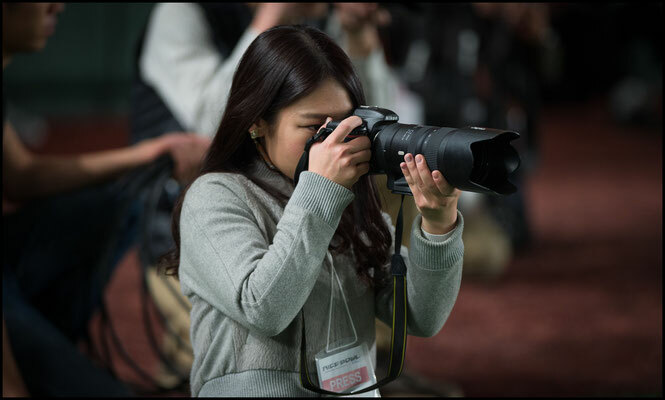 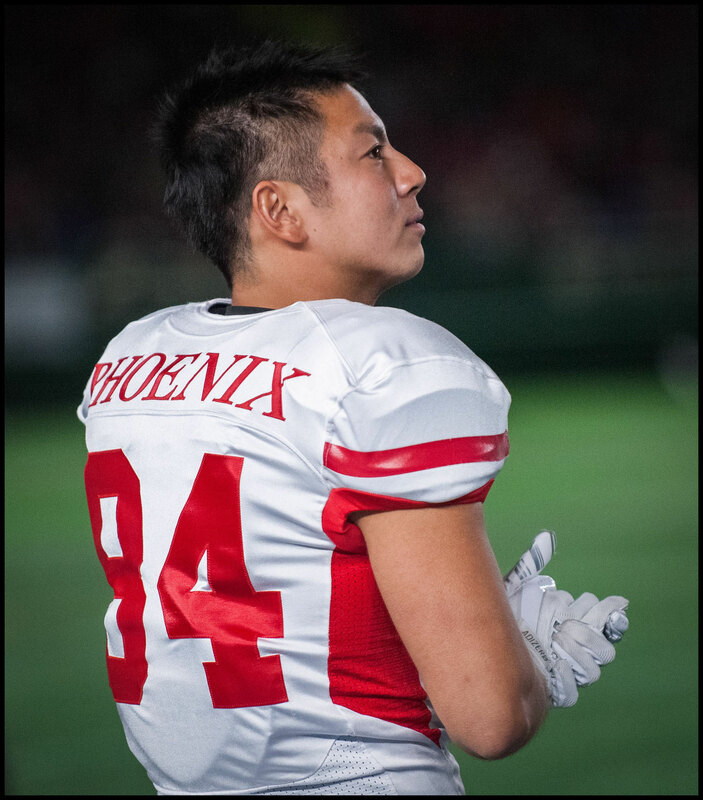 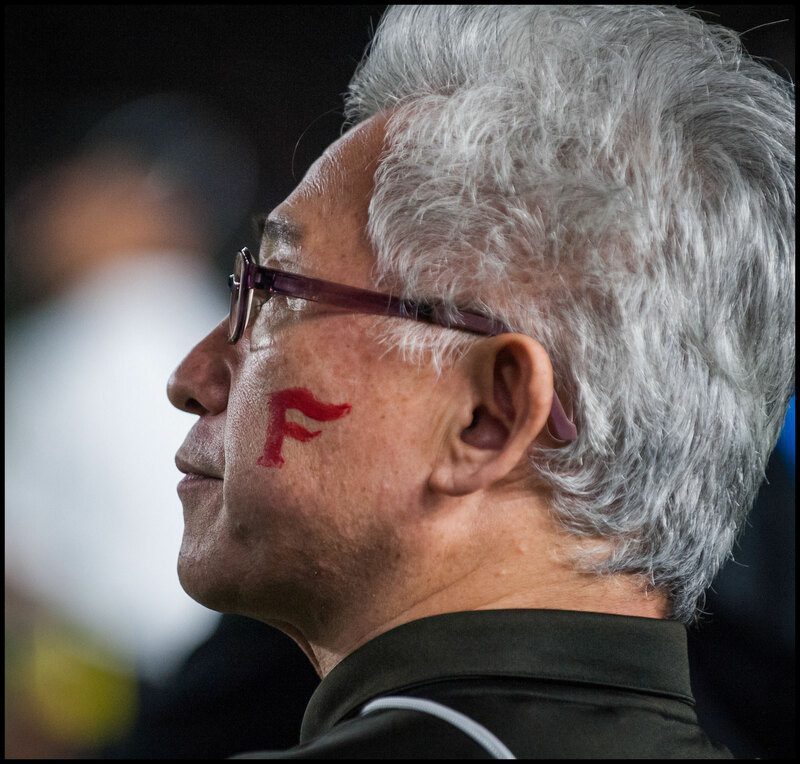 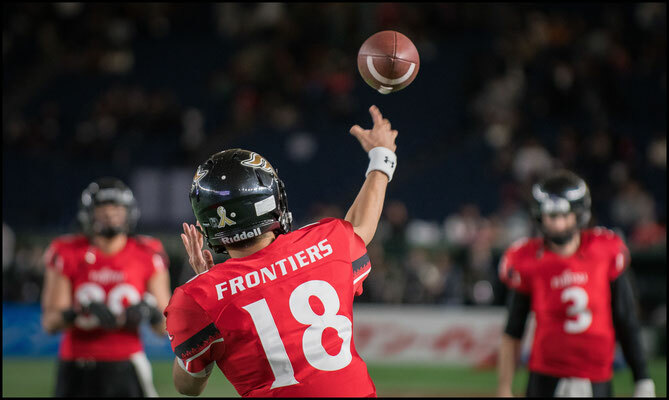 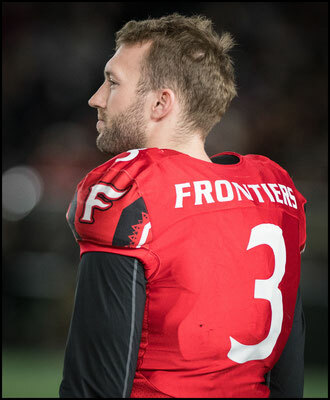 There are 12 former Nihon university men on Frontiers roster though and at least a few Phoenix players will go on to join them or play on other XLeague teams, meaning that some will eventually get to experience being on the winning side one January.